For previous years' lists and commentaries, usually incomplete, click: 2005; 2004; 2003; 2002; 2001. I seem to have lost the file for 2000. 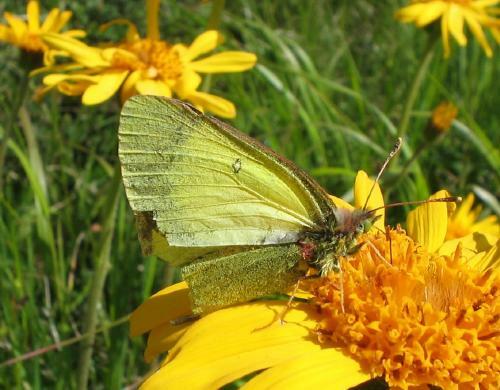 * Pale clouded yellow is the default identity for pale members of the genus Colias, but to be honest, without catching them or being lucky it is impossible to say whether those flying were pale clouded (hyale) or Berger's pale clouded (alfacariensis). 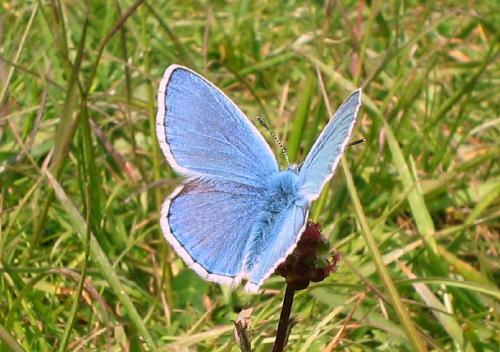 Although it turned very warm in the last few days of January I saw no butterflies. 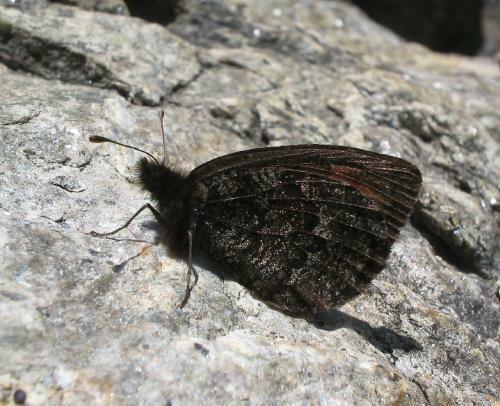 3rd: The heatwave of the end of January continued and I saw my first small tortoiseshell on 3rd Feb at 11.42am in my garden, warming up on exposed dried grass (where the snow had melted). 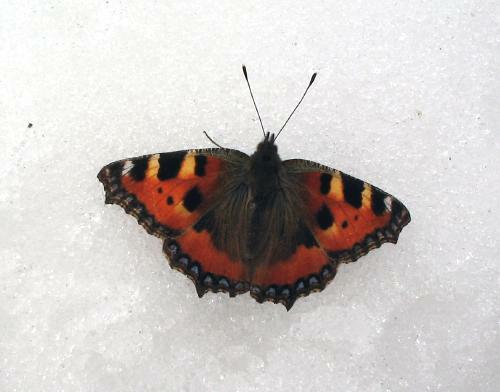 6th: After two intervening days of bitterly cold freezing cloud, with no possibility of anything flying, a single small tortoiseshell took to the wing again today (2.10pm). 22nd: Although we have had a lot of snow recently it was warm today and a single small tortoiseshell was flying at Gryon. 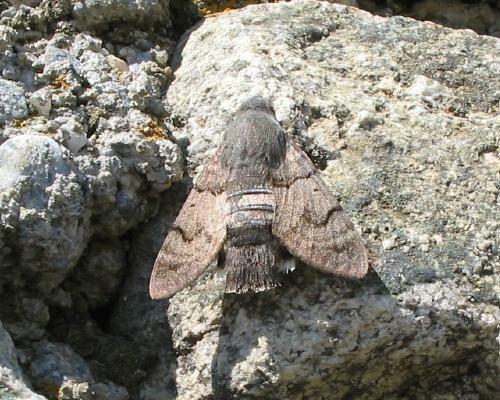 This was the third this year and all have been at different locations - probably different individuals. March began miserable and rather wet then turned very snowy, to the extent that during the second week we had more snow than at any other time this winter. 15th: It has been brilliantly sunny on thick, thick snow for the last three days. Today a single small tortoiseshell was flying along the Col de la Croix road at a comfortable skating pace so Asha and I kept abreast of it for several hundred yards as we skied along. This was my fourth small tortoiseshell of the year. 16th: Small tortoiseshell at La Barboleuse. 17th: Three small tortoiseshells today. 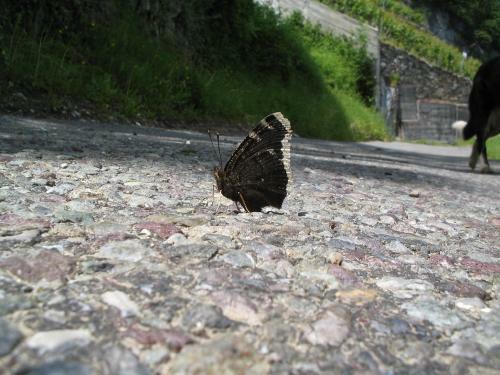 One was at La Barboleuse and two on the Chemin des Chavasses, towards Ecovets. 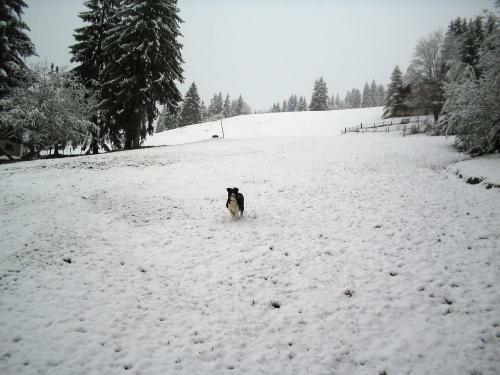 18th: Went higher today, to Les Chaux, then skied back to Barboleuse with my parents (and my dog). 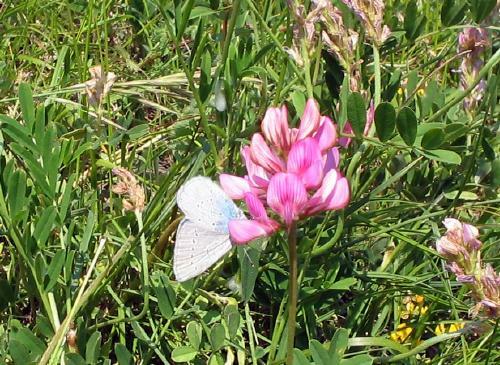 Surprised not to see a single butterfly flapping over the snow, even though it was gloriously sunny again pretty much all day. 19th: Down to the Rhône Valley, near Martigny, in morning. 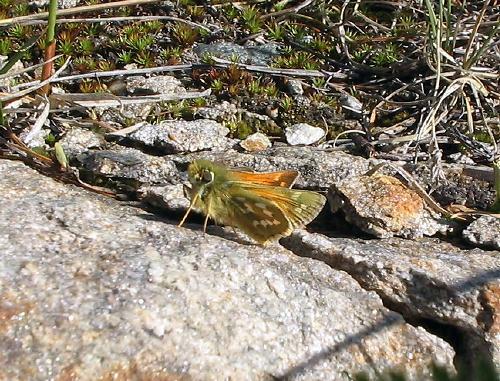 Arrived at about 10.00am, when nothing was flying - far too cold, with a milky sun barely piercing low-lying haze. 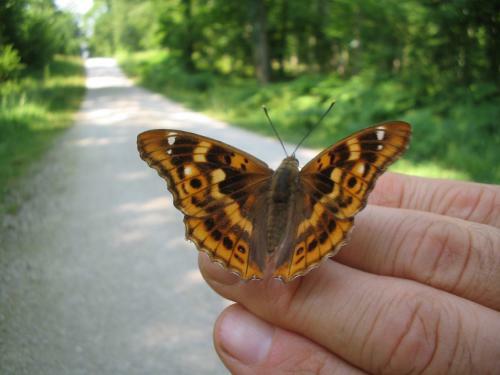 But by 11.00am I had seen plenty of small tortoiseshells, a single large tortoiseshell (that I couldn't photograph, unfortunately) and this freshly emerged Queen of Spain fritillary. The day was getting warmer but also a little windier when I had to leave and go back up the mountain. 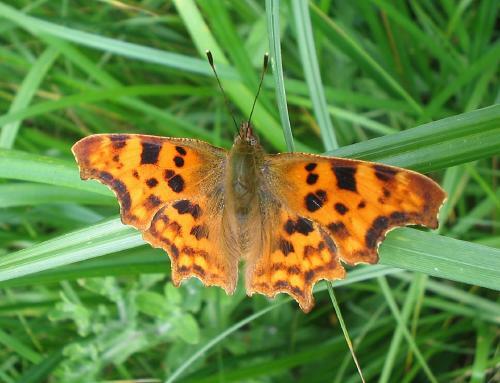 Matt Rowlings arrived shortly before I left and proceeded to see a total of 15 large tortoiseshells, as well as a brimstone, as the day warmed up!! 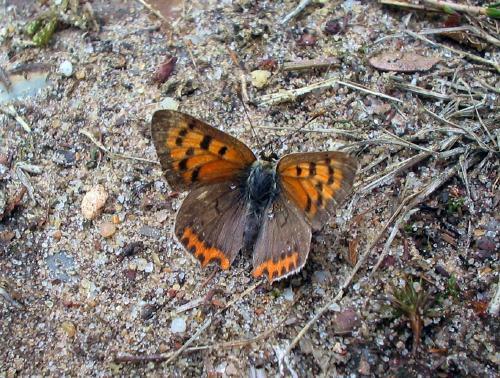 Saw more small tortoiseshells in Arveyes and Gryon later in the day. 20th: The day was cooler than recently, with cloud in the morning and most of the afternoon and even snow shortly after lunch. 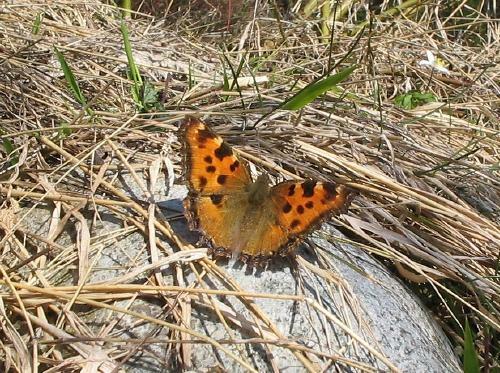 Nevertheless, several small tortoiseshells were around, including this one, that had settled on the ski piste. It did, however, appear to have become torpid there, so I moved it to some exposed earth, away from skiers. 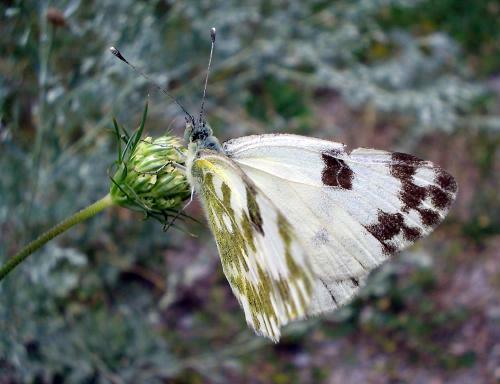 21st: Spent day at altitude, and in falling snow - so no butterflies. 22nd: Cloudy and hazy most of day, but with warmth penetrating through. 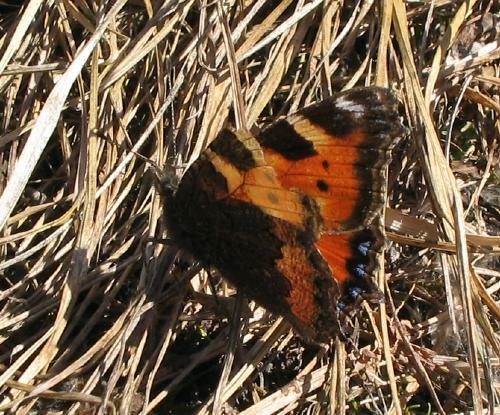 Single small tortoiseshell in Gryon. 23rd: Left my parents at the station in Bex and saw a peacock (my first of the year) and a large tortoiseshell fly across the tracks. So decided to go to Martigny and see what else was around. Whilst waiting for the next train saw several small tortoiseshells. 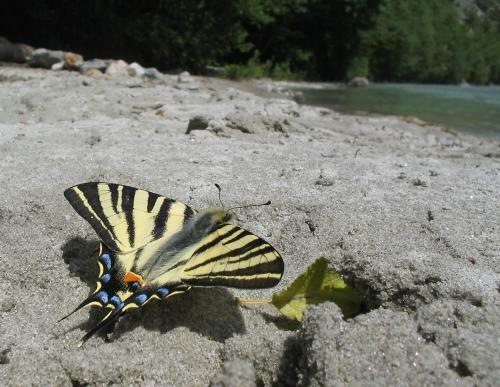 Nothing new at Martigny, and a high wind whipping round the corner of the Rhône preventing most flying, but did see a further 8 large tortoiseshells and at least 30 small tortoiseshells. 24th: Miserable weather. No butterflies. 25th: Mostly cloudy but generally warm with occasional sun. 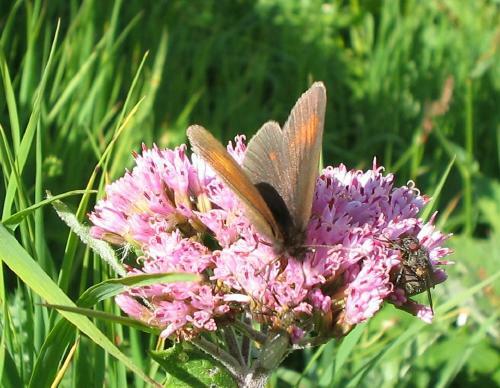 Small tortoiseshells flying in Gryon and Bex. 26th: Warm and sunny most of day. 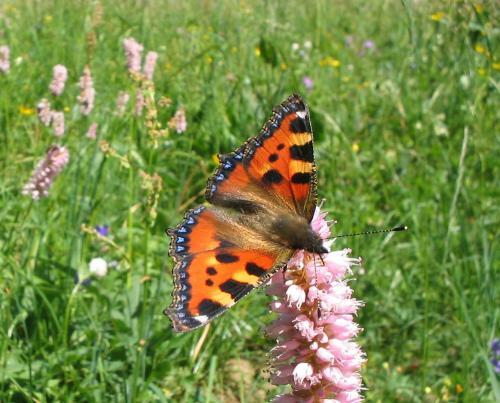 I had to be inside a lot, but while walking the dog found small tortoiseshells to be out in force in Gryon and saw a single large tortoiseshell in Barboleuse, my first this year at altitude. 27th: Cloudy but very warm. 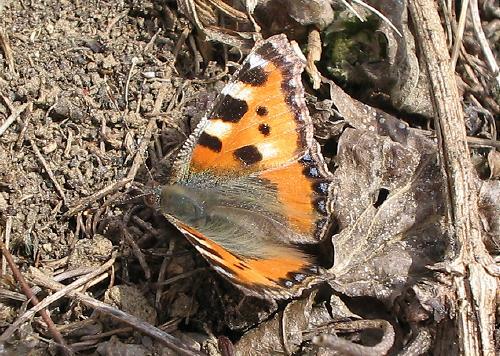 Small tortoiseshells common, sticking to the ground on exposed south-facing ground with wings pressed out flat. 28th: Cloud, wind, rain, sleet, snow (heavy in evening) - so no insects of any sort outside. Even some aseasonal thunder and lightning after dark. 31st: Small tortoiseshells flying again after the bad-weather break. 1st: Fairly miserable weather. A couple of small tortoiseshells between cloud and rain. In case anyone was taken in, the monarchs and Queen of Spain, inanis, that I originally posted never existed - they were figments of my April 1st imagination. 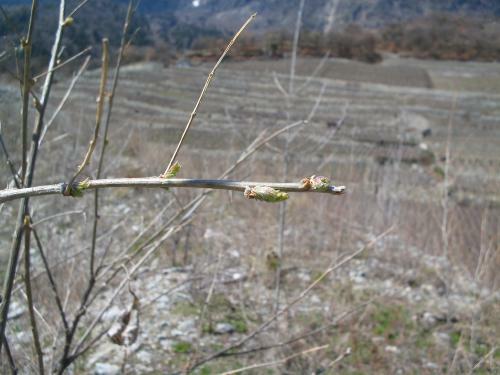 2nd: A trip to the Martigny region demonstrated how late this season is getting off the ground. 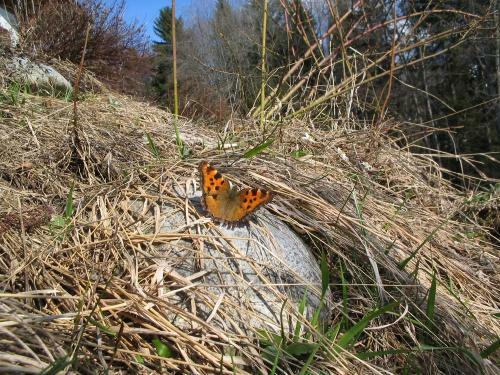 Although small tortoiseshells were plentiful and large tortoiseshells present, othe things were still sparse. 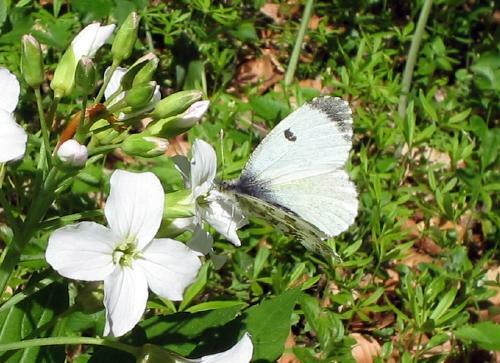 Saw three Queens of Spain at two separate sites, three green-veined whites at one site and no other new species. 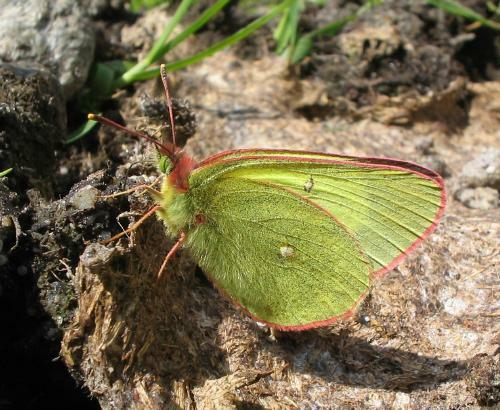 Matt Rowlings saw a single female brimstone shortly before I arrived but she did not return. 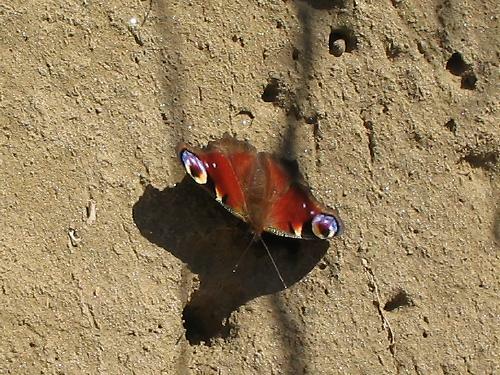 A peacock (only my second of the year) was particularly interested in taking minerals of some sort from this mud bank. 3rd-7th: Mixed sun, cloud, snow and rain, with quite heavy snow on 5th and 6th. Small tortoiseshells, but nothing else, flew on 4th and 7th. 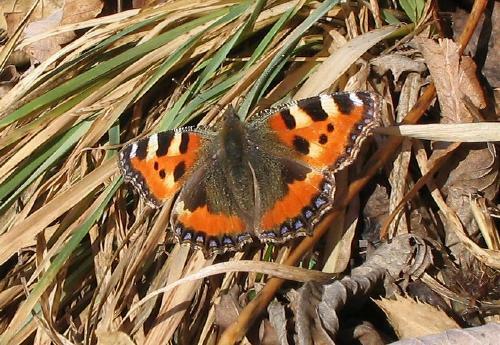 14th: After a few days of bad weather it has turned very warm and small tortoiseshells were flying again in my region. 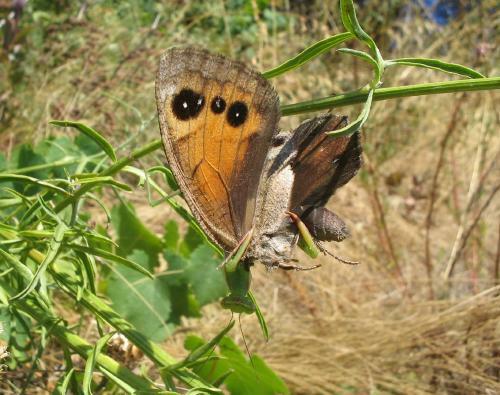 Still no other species than small and large tortoiseshell up here. 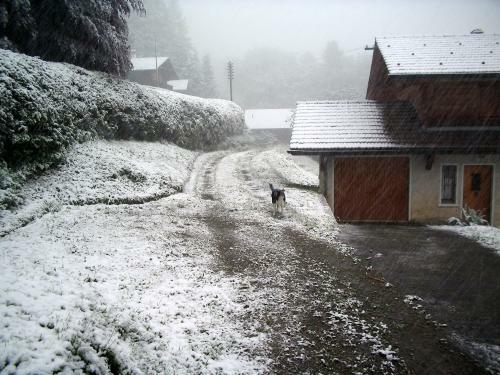 15th: Weather forecast for bright spells but reality miserable and cold with occasional snow. No butterflies. 16th: Easter day. Cold. 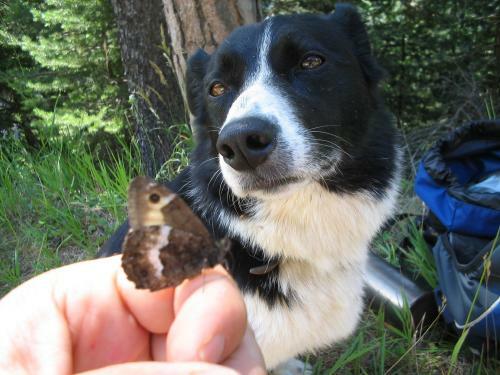 No butterflies. 17th: Mixed cold and sunny. 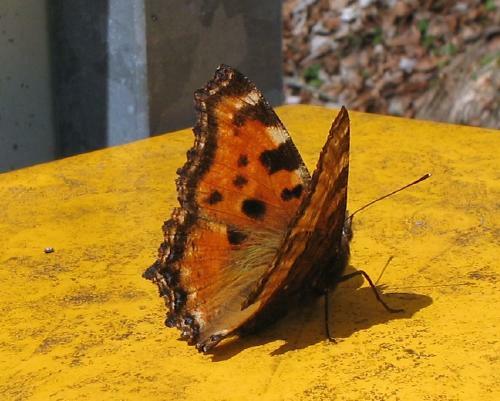 Small tortoiseshells out in number and this large tortoiseshell sunning itself on trees and on a post box (Swiss post boxes are yellow). 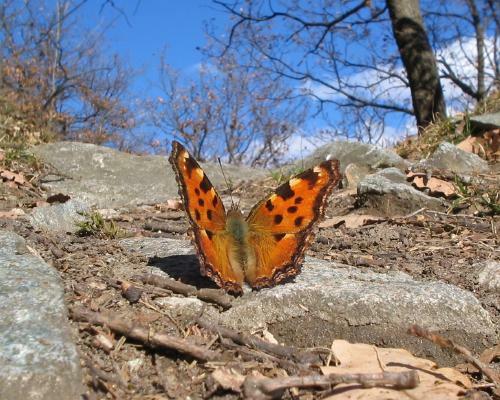 19th: Warm and sunny but still only small tortoiseshells around in any numbers at my altitude, and no other species at all here except large tortoiseshell. 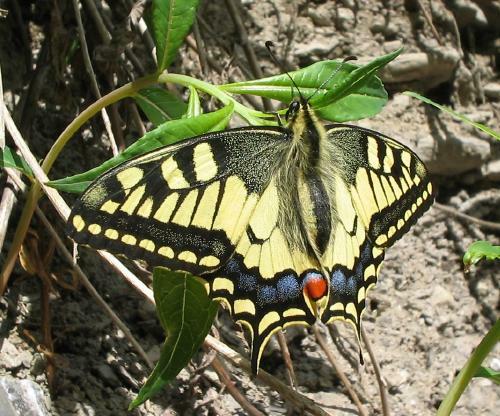 Saw two of these today, one sunning itself in my garden (pictures here and here). 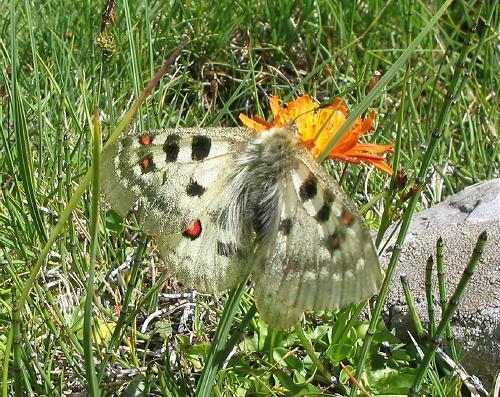 20th-21st: The warm weather has held recently, though I have only seen small and large tortoiseshell here at altitude. 22nd: Took trip down to the Rhône Valley to see how things were improving there. 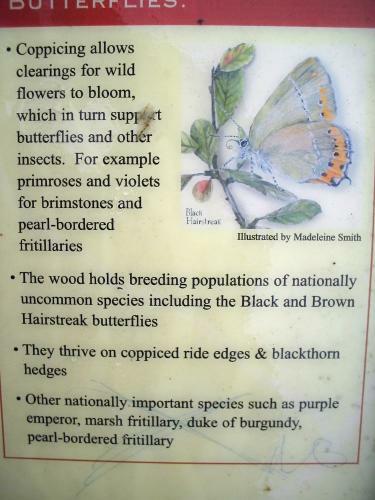 Saw: small tortoiseshell (many, but looking worn, having been on the wing many weeks now); large tortoiseshell (several, including one looking extremely worn and others clearly old); Queen of Spain (numerous); orange tip (first one seen from train on way down to Bex - others throughout day. 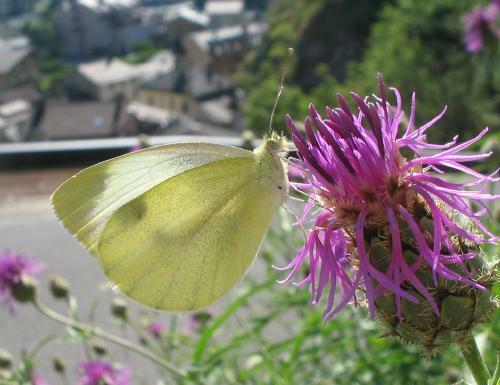 Quite a common butterfly); Bath white (a single male); clouded yellow (a single male); southern small white (quite a few, including this female and this male; small white (common, especially among the vineyards); green-veined white (common, especially in the wooded regions); comma (two, both near Martigny); holly blue (two, one in a garden at Branson and one near woods); woodwhite (first one near Fully, after a couple of hours of watching - but thereafter increasingly common, including back in places I had already looked. 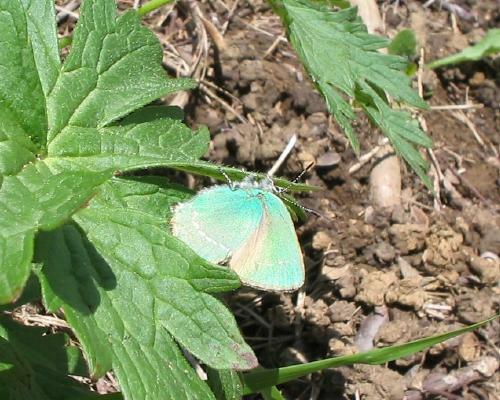 It seemed they were emerging during the day); green hairstreak (a single insect near a woodland edge near Fully); grizzled skipper (a single insect, late in the day. 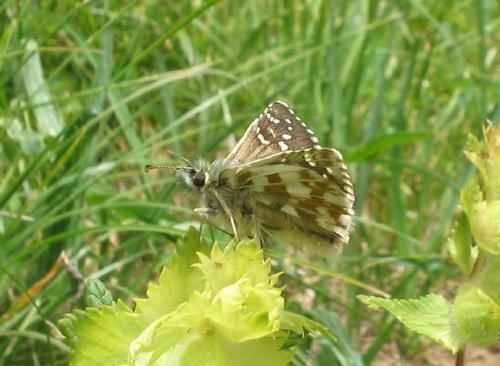 This is very late to be seeing so few grizzled skippers); mallow skipper (just one, among the vineyards); large white (just one, male, in flight, towards end of day's watching, that is, about 3.00pm). 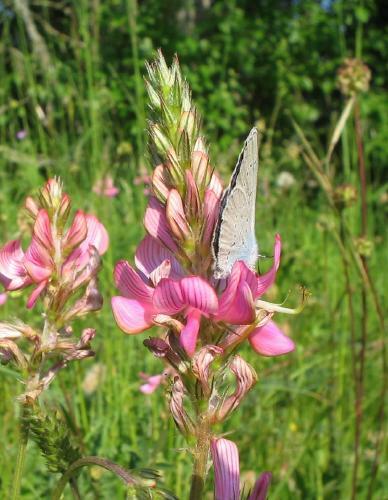 Also saw this hummingbird hawk moth, my first of the year. 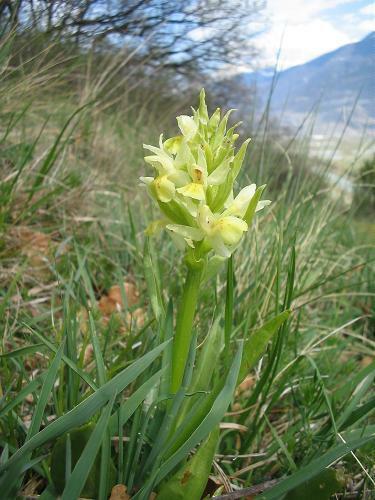 Some nice orchids pushing up now: here and here. 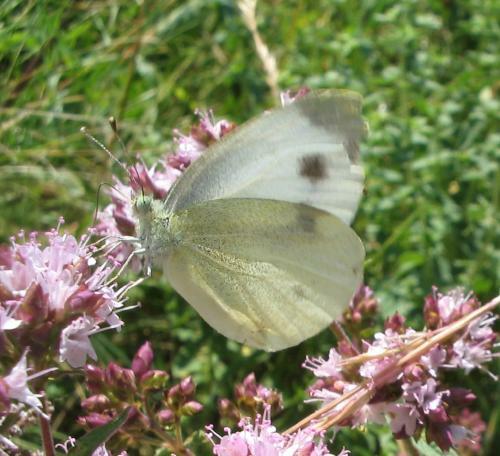 23rd: Mostly cloudy but saw my first upland green-veined white and wood whites (one of each) in Gryon. 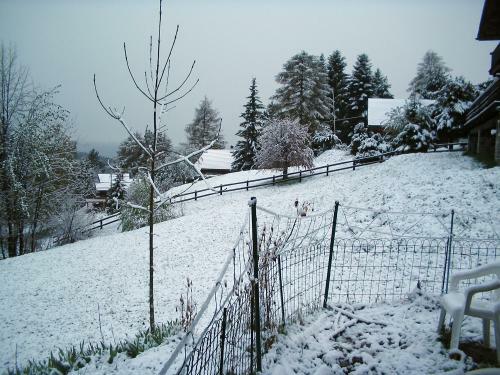 24th - 28th: Mostly poor weather. 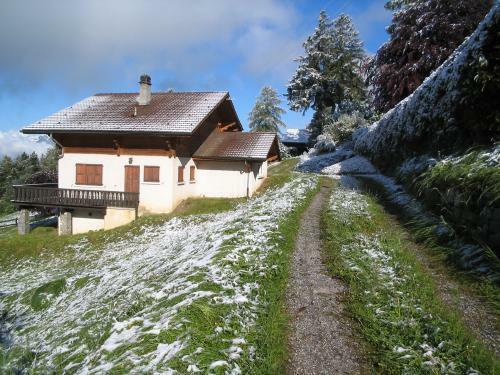 29th: Awful weather in Villars region in the morning but took Asha to the Rhône Valley for a walk in the afternoon (with Matt Rowlings and his wife, Gwen) and found a little activity there, on a cold, windy but generally quite sunny day. Things are still very late, though! 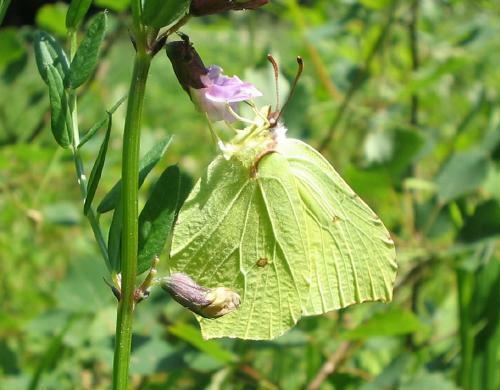 My first year tick was a brimstone, seen from the train on the way down to Bex. 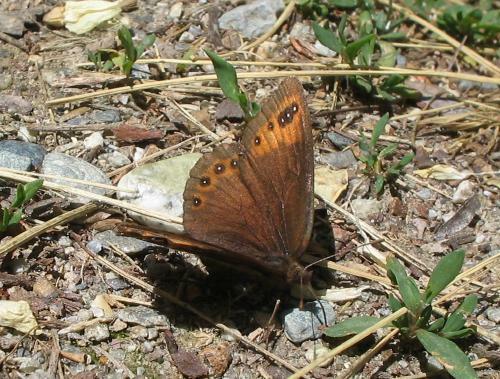 In the valley, near Martigny, a single scarce swallowtail was cruising around one particular spot (my first for the year) and a handful of wall browns were on the wing (also year ticks). 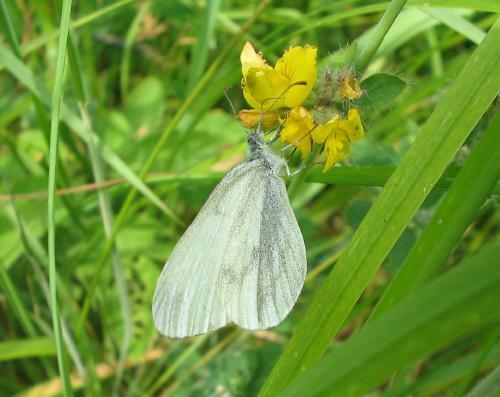 Small whites, green-veined whites and southern small whites were all flying (and there was a single large white in Bex earlier on). 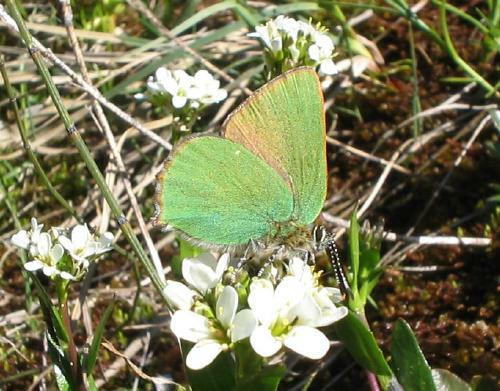 A single orange tip put in an appearance, as did a green hairstreak - my second of the year. A few Queens of Spain, some looking rather tatty now, and a very few small tortoiseshells, also a little weary, were holding the fort for the hibernators. No large tortoiseshells. 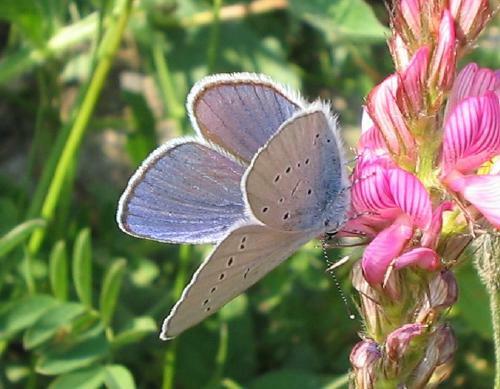 No blues at all and in general very barren, though to be honest the strong wind must have discouraged flight. 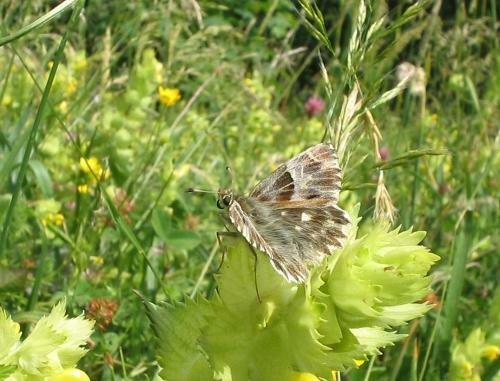 A single mallow skipper. 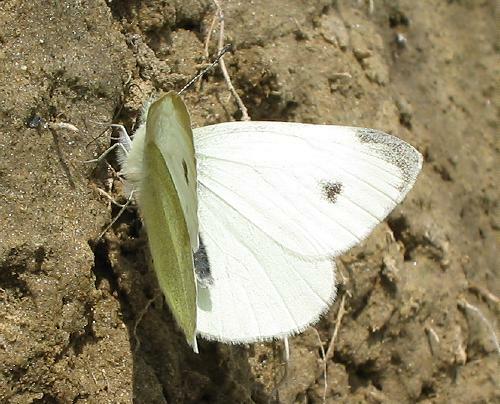 We watched a male southern small white very closely to confirm its identity, because the apical marking seemed ambiguous, not extending very strongly down the wing edge. However, as the above picture shows, it does extend down the outer margin further than in small white, if weakly, and the discal black mark is noticeably outwardly crescent-shaped. 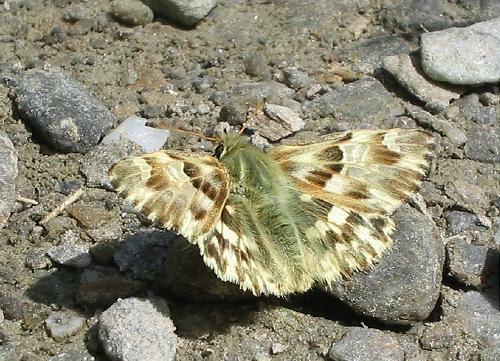 Two further features serve to identify weakly marked males of this species. 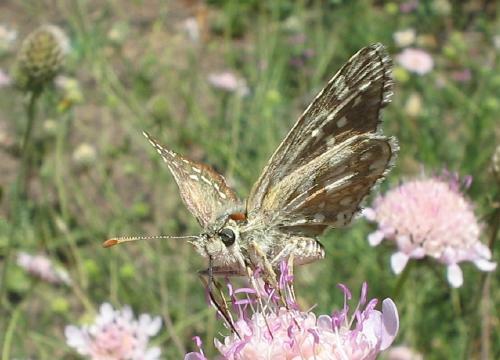 The underside of the hindwing is evenly and rather densely coated in black scales (less dense and more irregular in small white); the mark on the hind wing upperside costa, normally covered by the forewing, is outwardly curved, as revealed in this lucky shot of the butterfly taking off (look at the left hind wing). 3rd: Warm. 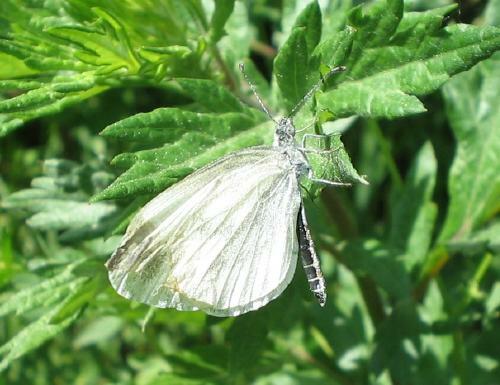 Wood whites are now present but not really common yet around Barboleuse and Gryon and orange tips too, though even more sparsely. 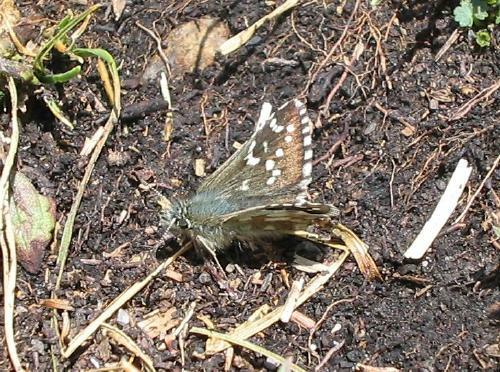 No grizzled skippers yet in my garden. 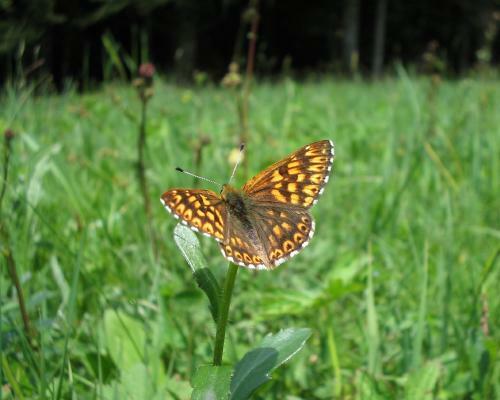 A single violet fritillary appeared in the evening and asked to be photographed but my cat and dog scared it off. 4th - 8th: Descent into wet weather again. Sat. 6th, Sun. 7th and Mon. 8th all miserable, with rain and some thunder! 11th: Sunny though still quite cold. 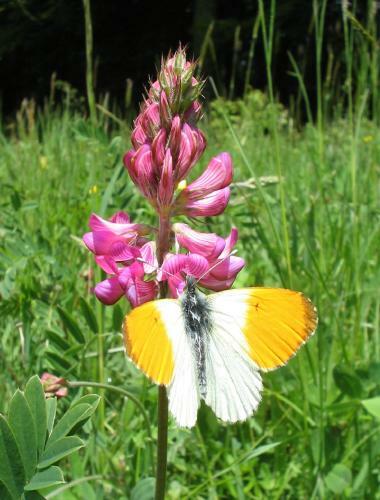 Wood whites and orange tips flying around Gryon region. 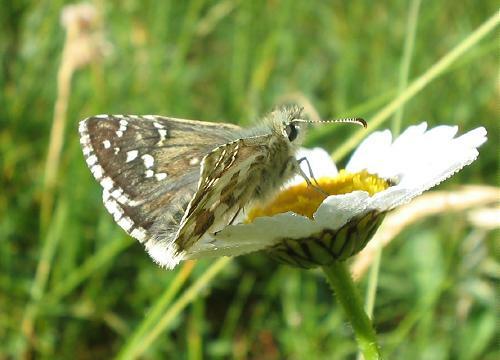 A single grizzled skipper in my garden - my first of the year at this altitude and only my second of the year anyway! 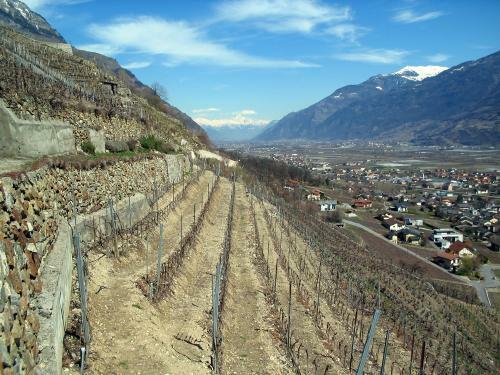 13th: Trip to Rhône Valley near Martigny, where met Matt and Gwen Rowlings. After a partly cloudy beginning, this seemed to be the first real day of summer - at least until the early afternoon, when it clouded over again! 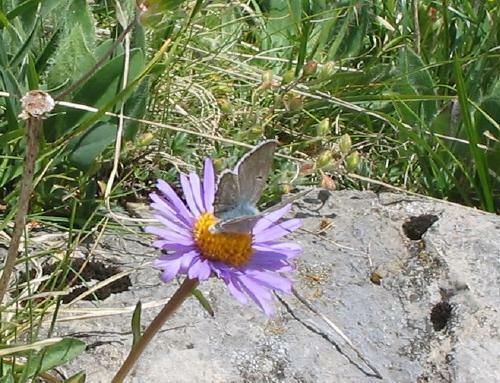 Many species of butterfly were out, apparently making up for lost time earlier in the year. 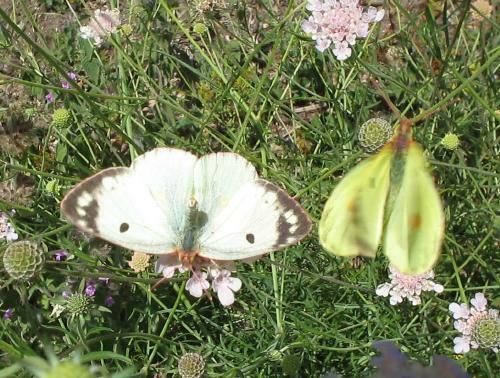 These included: Swallowtail (one or two); scarce swallowtail (several, including a rather small male); Large white (a few); small white (a few); green-veined white (a few); southern small white (relatively speaking, quite a lot - here is a picture of a pair mating); wood white (quite a few); orange tip (males and females about equally numerous); pale clouded yellow (this was not a certain ID. 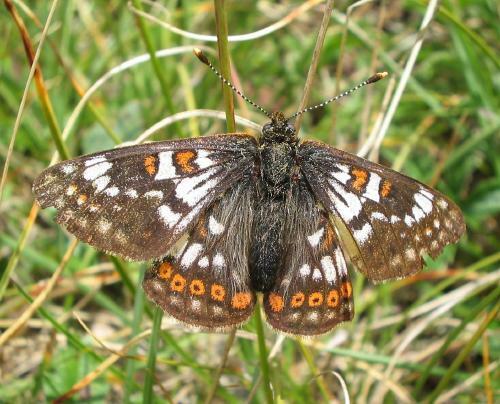 There were reasons to opt for both hyale and alfacariensis but nothing sufficiently decisive and none examined in the hand); mountain dappled white (two possible individuals at one site, followed by several confirmed at another. 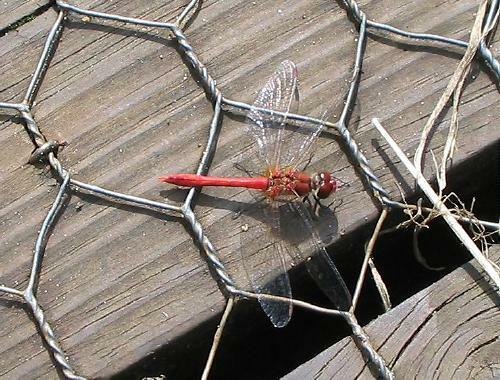 This one was caught and released by Matt, after which it hung around for 6 microseconds then disappeared again. Hence the rather woolly picture! 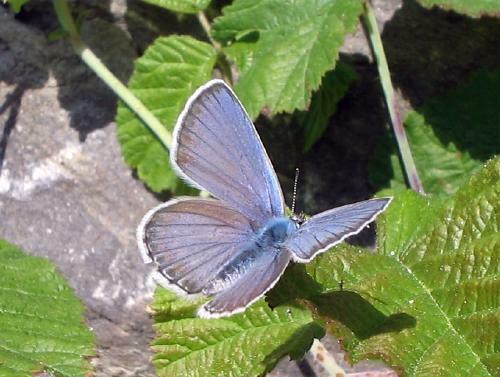 The mountain dappled whites at this second site were all flying along well-worn routes up a steep rockface, with a frequent characteristic yellow crucifer acting as attractant); common blue (a few, in several places, mostly males but one or two females); adonis blue (several males in a few places, as well as a female); chapman's blue (just this one confirmed, found after cloud and nearly rain had already set in - there might have been others); Provençal short-tailed blue (a total of three, probably, including two males and this female, which looked from any distance exactly like a little blue but gave itself away at close range by the tails and the shape of the hindwing, not to mention the blue scales); green-underside blue (several in one localsed region, including this mating pair, in which the male is the lower, larger insect); baton blue (a single male. 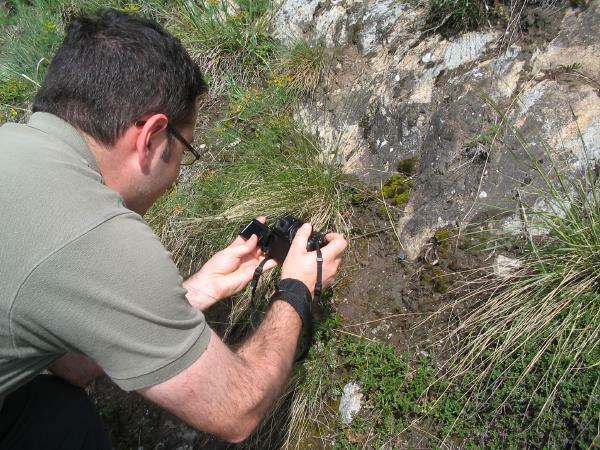 Here is a picture of Matt photographing it and here one of my own shots. 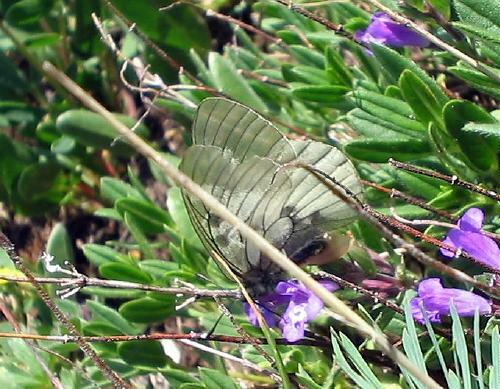 This one shows a glimpse of the underside too. 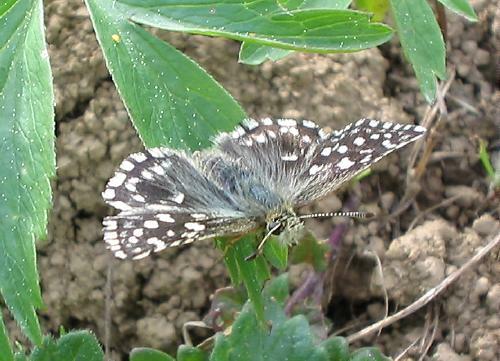 ); chequered blue (almost abundant in a broadly localised region. 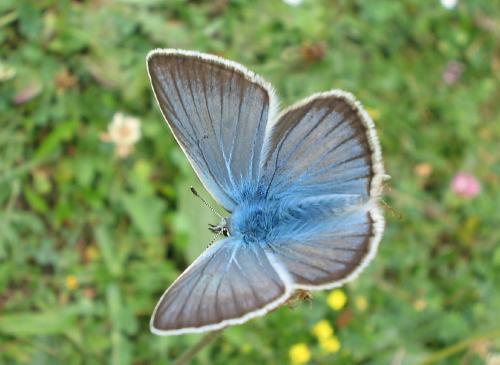 No insects showed anything like the extent of blue seen in French colonies of the insect, like this one photographed by Tim Cowles. 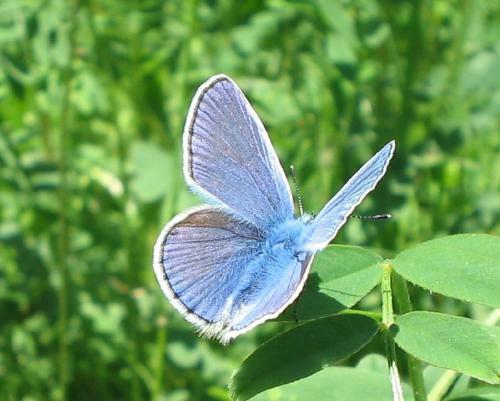 The bluest individual I found was this, and others looked like this and this. There was little or no difference between the sexes. 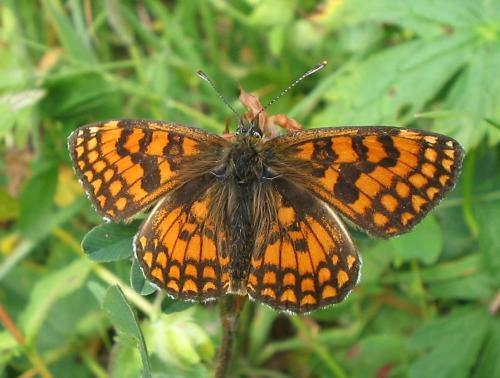 ); Glanville fritillary (very common in a localised region); comma (a single, very large and pale, individual); wall brown (very common locally); small heath (a single individual bravely flying around under 100% cloud-cover); grizzled skipper (three or four individuals); mallow skipper (three or four individuals). 14th: Afternoon trip to Panex, on an often bright, sometimes warm, summery/blustery day. First dingy skipper of the year was nice to see, though I only found one; little blues were out in some numbers at one site; violet fritillaries are now reasonably common in the south-facing meadows, though very flighty and difficult to photograph; orange tips common - here is a female showing its upperside, another showing the underside, and a male on sainfoin; other species seen were holly blue, small heath, small, large and green-veined whites and the odd small tortoiseshell (these are scarce now). 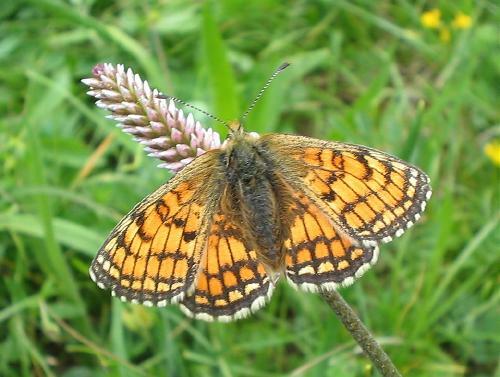 I had been hoping for pearl-bordered fritillaries, which usually feed on bugle growing along woodland rides at this time of year. There were none. This might be because it is still too early. 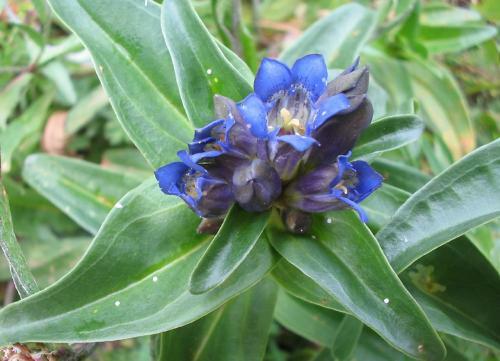 It might also be because the exact spot I always see them has had its bugle patch churned up by heavy vehicle traffic... There was very little reason for them to hang around there today. 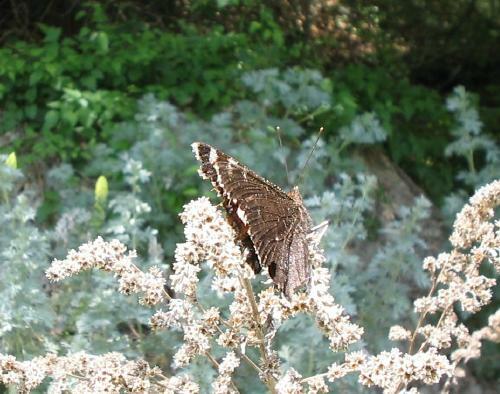 17th: Although I worked most of the day there seemed to be plenty of butterflies around in my moments off. 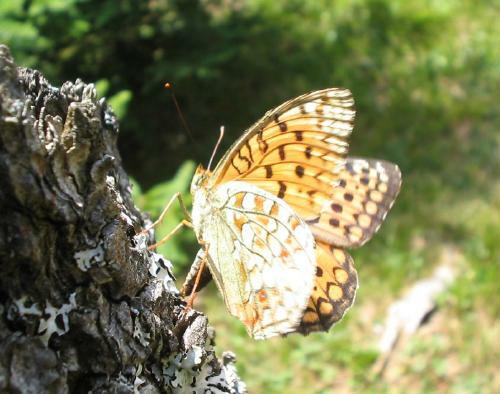 Today the painted ladies arrived. At the time of writing I have seen six (it is still sunny outside), including this one. 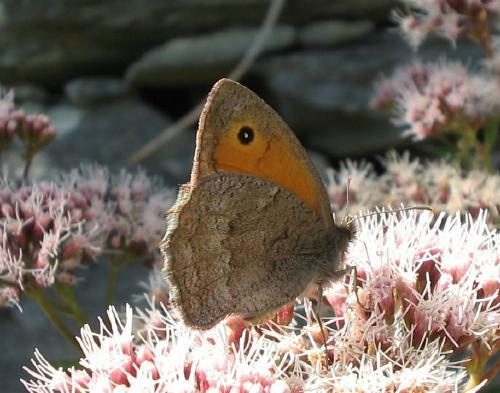 Sooty coppers were on the wing in Gryon for the first time this year and wood whites and orange tips were out in good numbers. 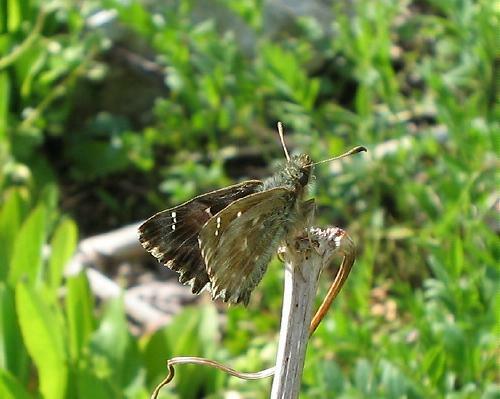 In my garden the grizzled skippers seem really to have taken off. 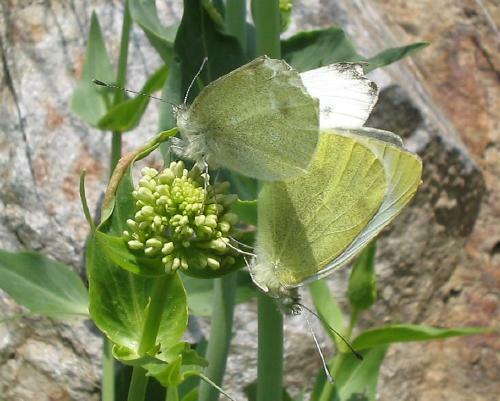 Here is a romancing pair, here a single individual, and here and here an individual of the form taras, which is not uncommon around here I have discovered. 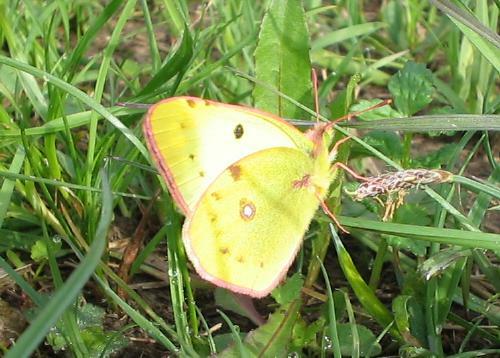 This pale clouded yellow was flying in La Barboleuse in the morning. 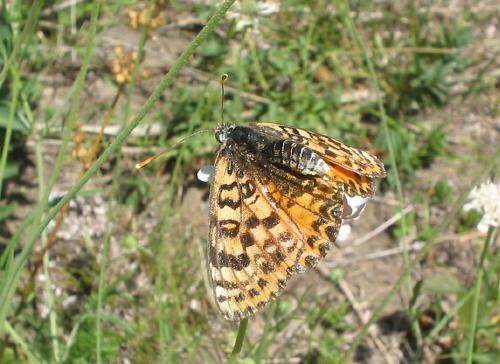 18th: During sunny spells in morning painted ladies were everywhere. Rain set in and became a heavy storm during the afternoon and evening. 19th: Cold after the storm, but bright. 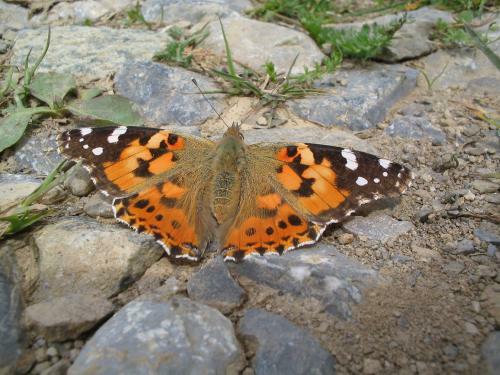 Again, painted ladies seemed to be everywhere, the first one flying off my path first thing in the morning when I left for work. 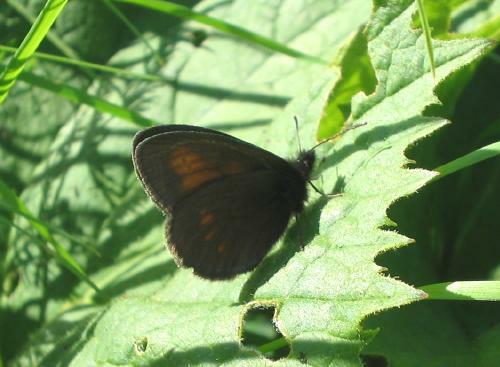 Amazing numbers of butterflies in Gryon at lunchtime, including my first Dukes of Burgundy for the year (here and here) and my first woodland ringlets of the year. 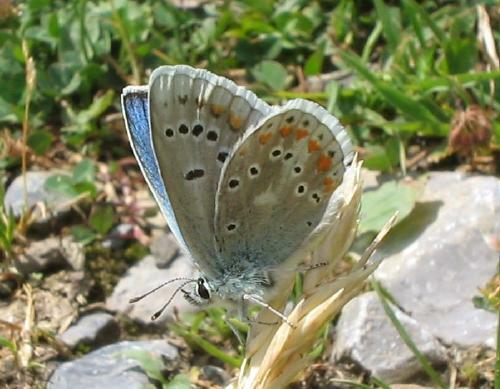 Also my first ever local green-underside blue (ups here) - until now I have had to go down to the Rhône Valley to see them. 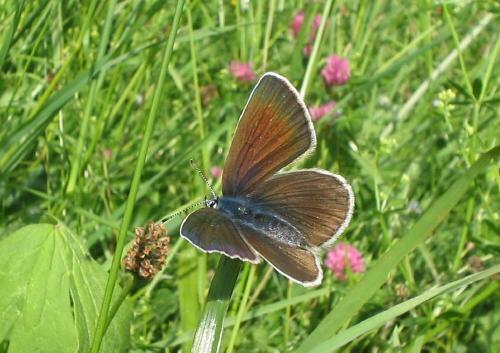 Other species enjoying the beginning of summer were: Chapman's blue; dingy skipper; grizzled skipper; common blue; little blue (and here); violet fritillaries; probable meadow fritillaries (but none stopped to let me confirm); sooty coppers (absolutely abundant, throughout the Gryon meadows); pale-clouded yellow; whites (at least small white and green-veined white); large tortoiseshell (a single, very faded, specimen); orange tip; green hairstreak. 20th-21st: Mostly rainy, with sun towards the end of the 21st (Sunday). 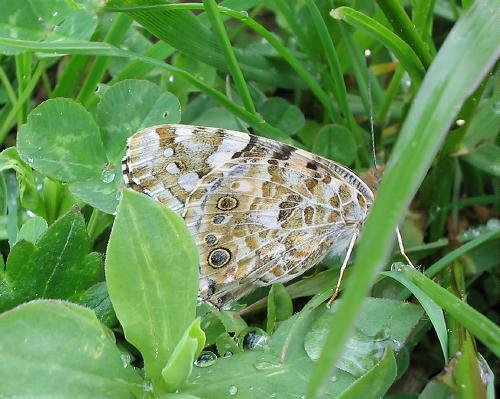 Painted ladies abundant and visible even in overcast and wet weather (here is one skulking in the wet undergrowth). 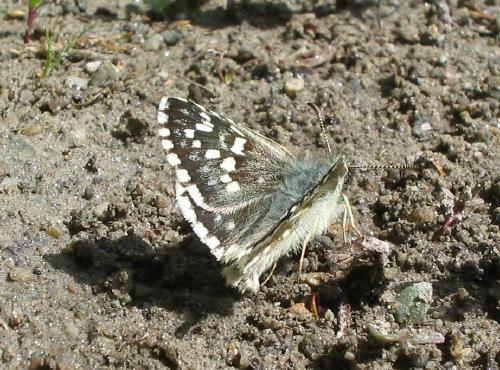 Also grizzled skippers, wood whites, orange tips and other species taking advantage of any moments of brightness. 22nd: Very windy - the Föhn has been blowing since last night. But also bright and often warm. 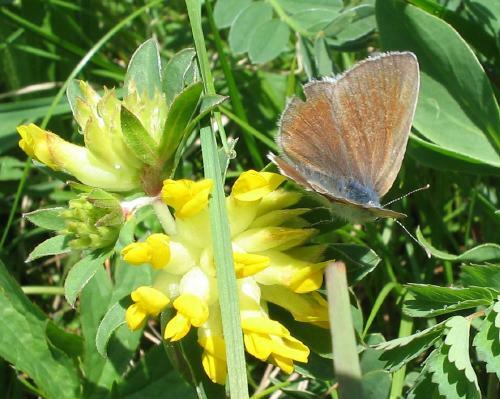 In Gryon I saw my first confirmed Berger's pale clouded yellow of the year (almost certainly not actually the first Berger's I've seen - just the first confirmed one - and there were several about today). 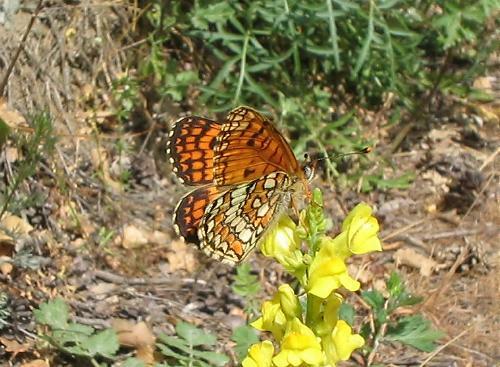 Painted ladies still abundant. 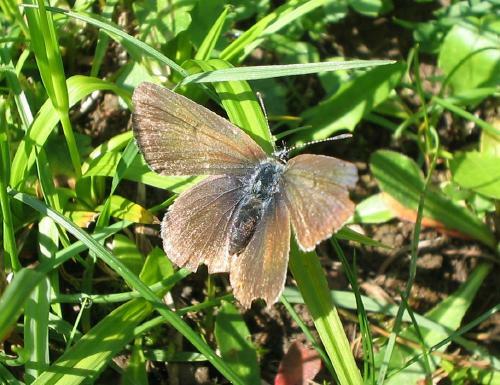 All the usual whites and orange tips, including increasingly many large whites; sooty coppers very common, with my first female of the year today; a single dingy skipper; Chapman's blues, common blues, two green hairstreaks, lots of little blues; lots of grizzled skippers in my garden. 23rd-24: unseasonally cold, but bright patches on 24th especially. 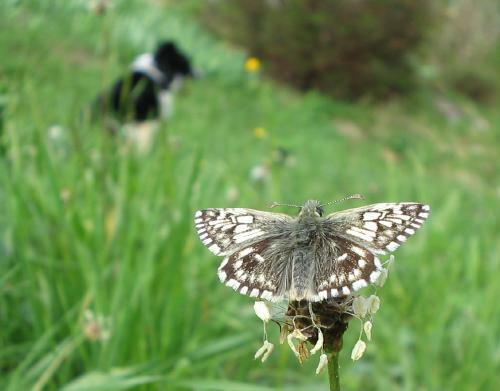 Saw almost no butterflies at all during a long morning dog walk but found my first chequered skipper of the year (here's another shot, with my dog and cat) in my garden in the early evening and my first pearl-bordered fritillary close nearby shortly afterwards. 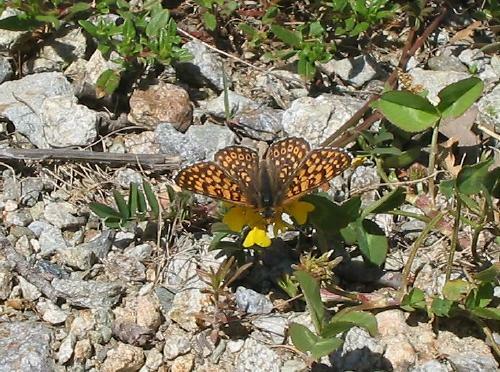 Violet fritillaries around, but looking quite tatty, and also a single adonis blue - my first at altitude this year. 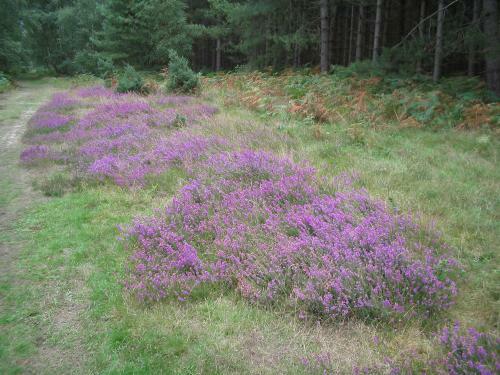 A few small heaths. 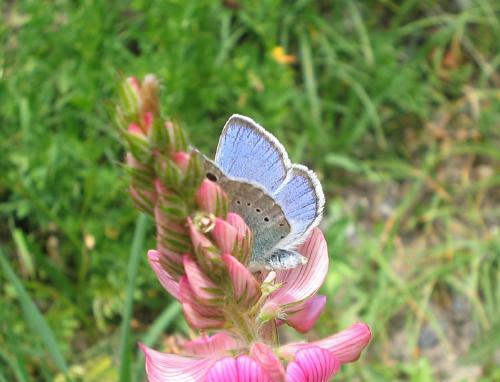 26th: Took trains to Martigny early in the morning and did a trek along the Rhône Valley in search of iolas blues. 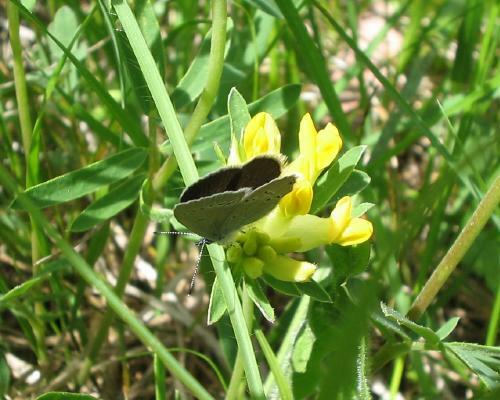 Found two or three males at the same place as I found them last year (ups and uns), always hanging around their larval foodplant, bladder senna. 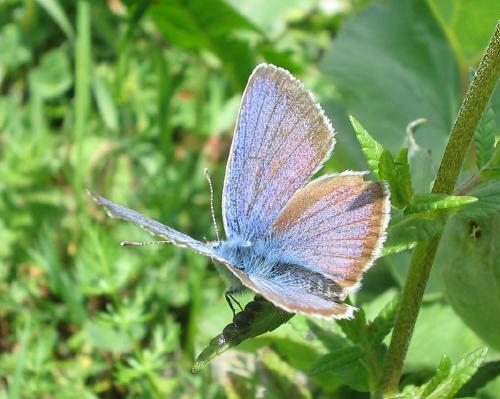 On way, found my first Apollo of the year, as well as seeing plenty of common blues, adonis blues, one baton blue, one (at least) Provençal short-tailed blue, painted ladies, all the now familiar whites (including southern small white), grizzled skipper, pale clouded/Berger's clouded yellows, walls (abundant), chequered blues, green hairstreaks, swallowtails and scarce swallowtails, Queen of Spains, Glanville fritillaries, small heaths and doubtless other things I have omitted. 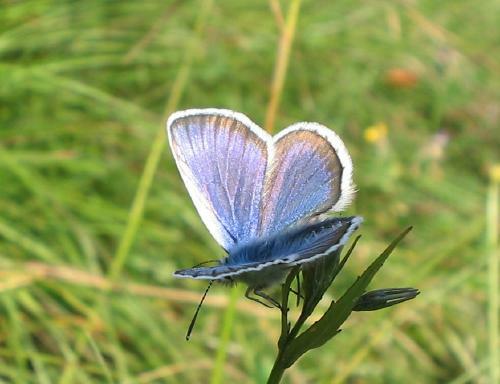 A trip to a purple-shot copper site produced none of these, unfortunately, but a Camberwell beauty did pop in for a photo opportunity. At one point it actually landed on my dog but when she saw me creeping towards her stealthily she came joyfully to me and it flew off. 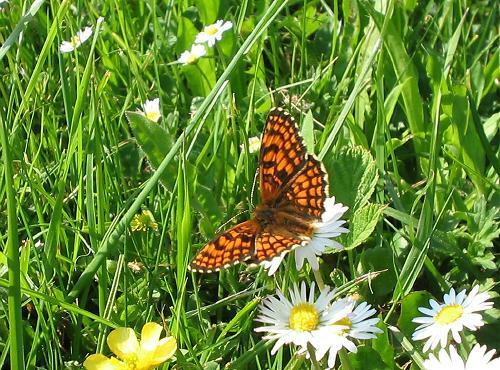 Here she is in the same field of vision though... After returning from the Valley and leaving a hot, tired dog at home, I headed up to one of my violet copper sites. Saw at least 8 males, mostly competing for sun spots and spiralling around in the air, including this fresh one and this not so fresh one. 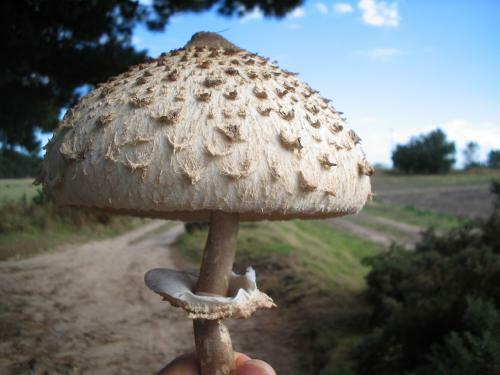 Here is an underside. This colony seems to be under some threat from nearby development. 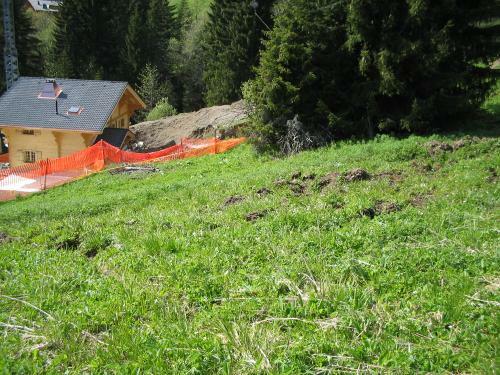 I noticed that despite considerable precipitation this winter and spring the ground was drier than usual, as if the building work just below it (down the hill) had created more drainage. 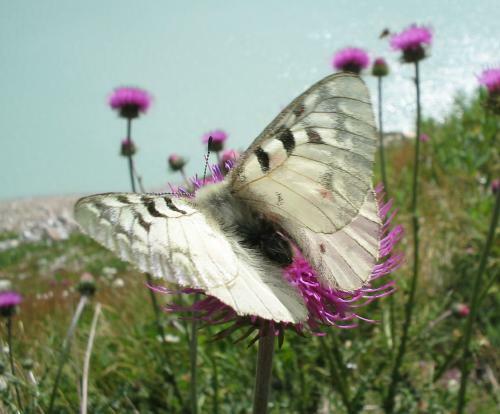 27th: Took long walk from my house up to Frience, then to Solalex, then up to Anzeindaz and back (this last hoping for some mountain dappled white, which I have never seen on this route but thought might fly). 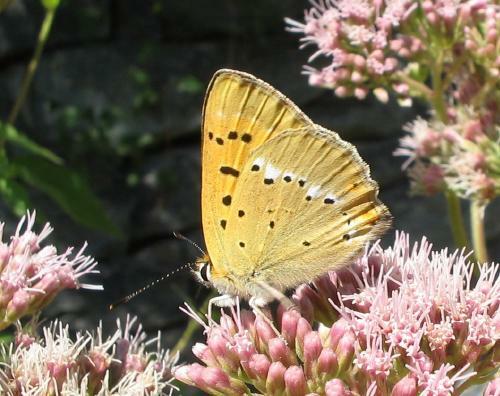 Unfortunately the weather meant I saw little, but I did get two northern wall browns, at different locations, as well as plenty of painted ladies and three or four green hairstreaks. 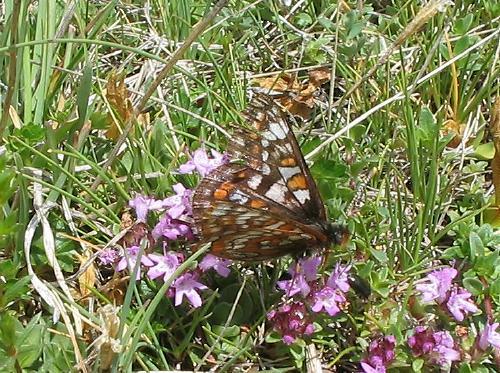 At one point a fritillary flew past looking bright and fresh and very like lesser marbled - but it didn't stop so I will never know. 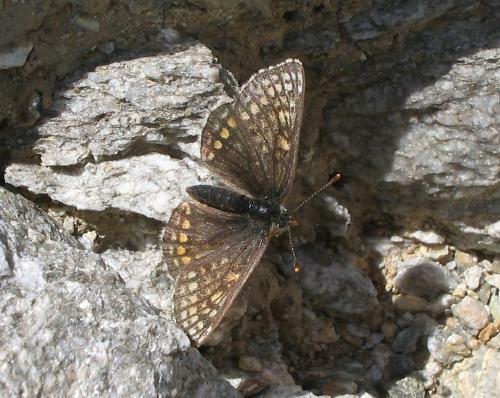 Grizzled skipper quite high up the mountain and painted lady at over 2000m. 28th: Hazy warm for most of the morning, clouding over in the afternoon and raining in the evening. 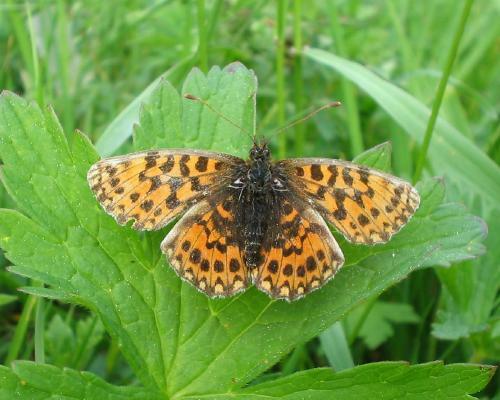 A lunchtime walk around Gryon produced my first confirmed meadow fritillary of the year - although I have probably already seen one or two in flight without them stopping to be identified formally. 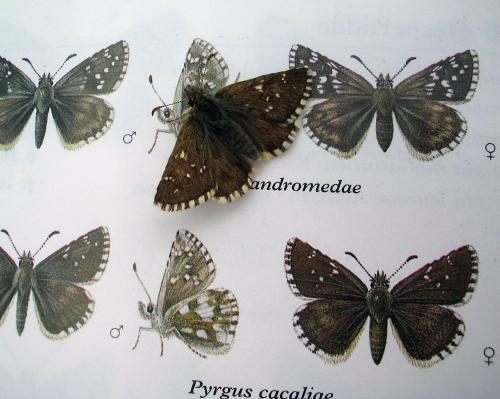 Here is an underside shot and here a close-up of the upperside. 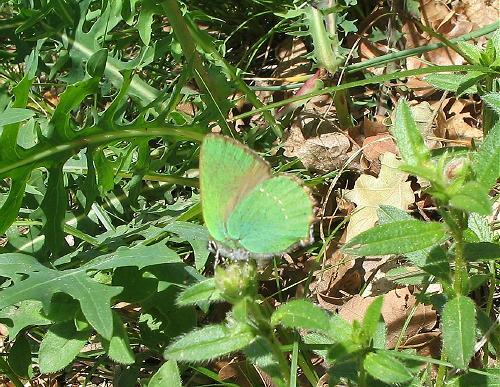 Saw several green hairstreaks and plenty of Chapman's blues, males and females. 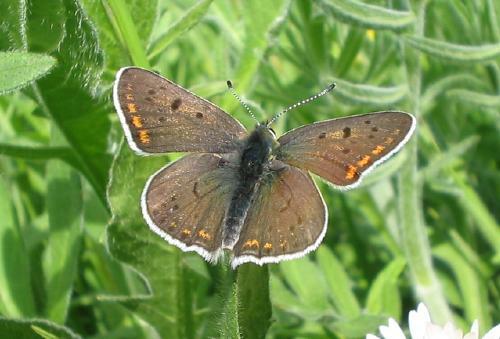 Sooty coppers were still in evidence and Berger's pale clouded yellows common, despite the lack of sun much of the time. 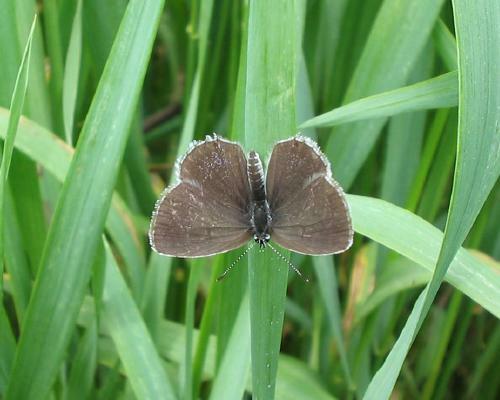 Little blues increasingly common (this one was in my garden) and woodland ringlets bobbing around everywhere over the meadows. 30th-31st: Aseasonal snow descended on the region, lightly on 30th and then heavily on 31st (and during the night). 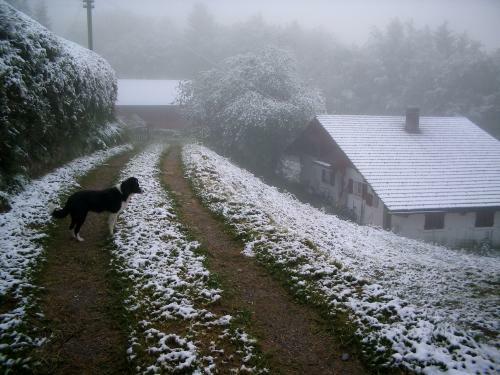 Here is a picture taken near my house early in the morning of 30th, and here and here pictures from 31st. 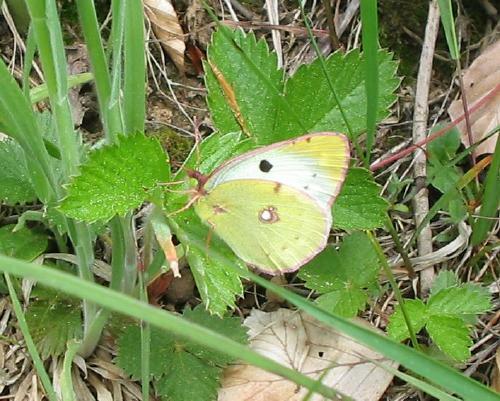 Amazingly, in a brief dry spell on 30th, when I chose to take my dog for a walk, I found this Berger's pale clouded yellow hiding in a place protected from the snow. 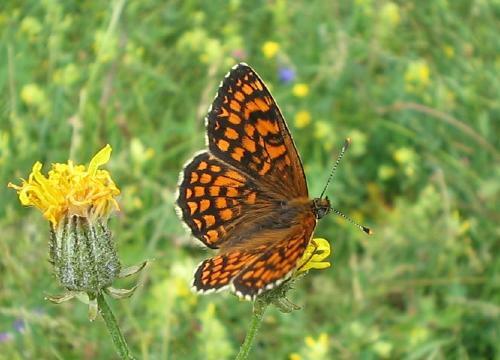 Other than that, these were not butterfly days. 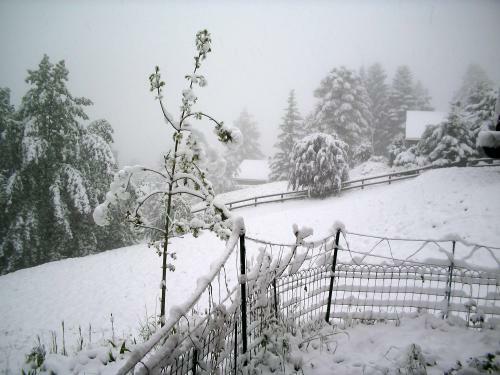 I have never known such intense snow so late in May. 2nd: It snowed quite heavily last evening and a little during the night, before clearing up in the small hours (resulting in well sub-zero temperatures in the morning, and black ice!). Here is my house in the morning, and the scene as I set off for work. 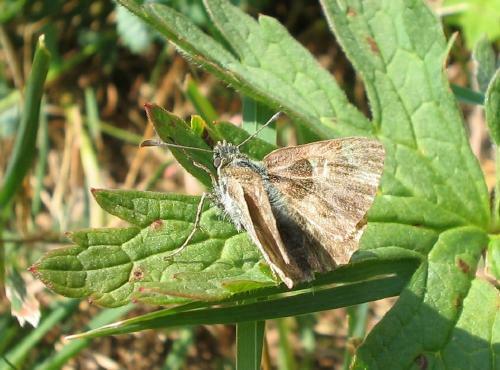 Nevertheless, the sun put in an appearance today and when I got back from work I found my first geranium argus of the year in my garden (here and here - clearly a freshly emerged insect), as well as a lovely fresh chequered skipper (ups and uns). 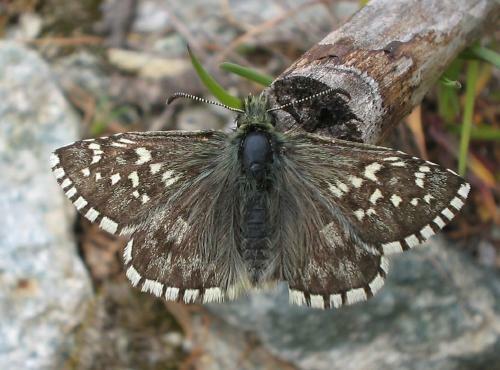 There was also a beautiful and equally fresh grizzled skipper, ab taras, but Asha bounced it off before I could get a photograph. 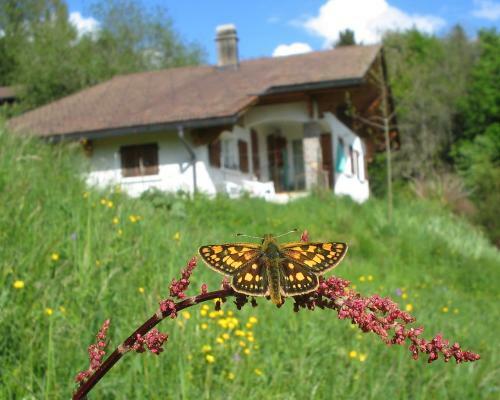 3rd: Walk from Visp to Leuk, along north slopes of the Rhône Valley. In fact, I didn't reach quite as far as Leuk because Asha was exhausted and above all very hot (it would have been 22km along the main road - much more up and down the hills, in and out of the gorges), so took bus for last litte bit! 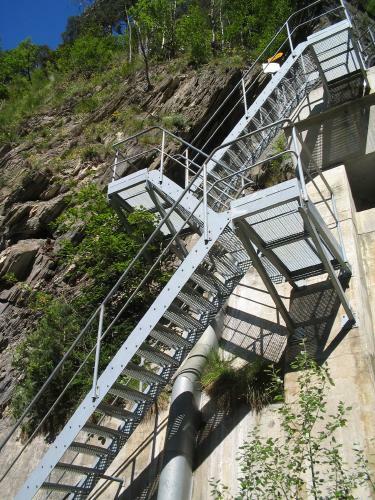 The journey was quite challenging for a small border collie, including this ladder, (it was either that or jump...) this swaying gorge crossing and this see-through steep staircase!! 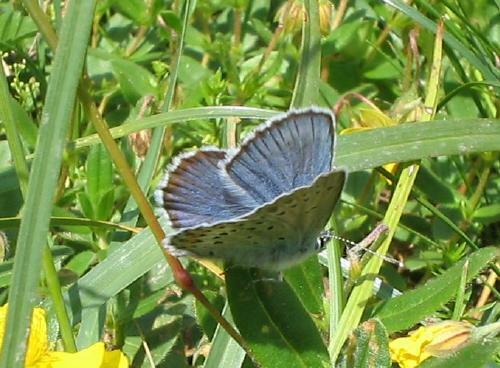 Saw, in roughly chronological order: adonis blue (abundant throughout walk); pale-clouded/Berger's clouded yellow (frequent throughout); wall brown (abundant); red-underwing skipper (a couple); apollo (common to very common all along walk); Escher's blue (a single female); black-veined white (several, but not really common); Queen of Spain fritillary (common); de Prunner's ringlet (common to abundant for much of the way); northern brown argus (a single individual, at about 1100m); red admiral (just one); probable mountain green-veined white, but didn't get the photograph and don't think I shall count it; marbled white (first of the year - becoming common as day progressed and warmed up); orange tip (several); small white (a few); speckled wood (a few in shady parts of the trip); wood white (several/many - common in a few places but not everywhere); large skipper (one male - my first of the year); scarce swallowtail (frequent); heath fritillary (several Mellicta seen - just one identified firmly as heath fritillary); Glanville fritillary (abundant in several places, so much so that photographing them was difficult as they kept disturbing each other); safflower skipper (just one - in peak condition and rather flighty); dingy skipper (just one); large blue (just one); pearl-bordered fritillary (just one or two); green-underside blue (a single male); little blue (a few); green hairstreak (a few); swallowtail (numerous locally); clouded apollo (a single individual, near Erschmatt). 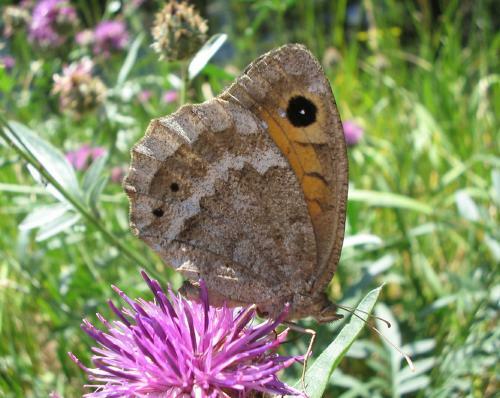 Back home I found another lovely geranium argus in the garden. 4th: A coldish day, with the Bise blowing gently and cloud covering the sky much of the time. 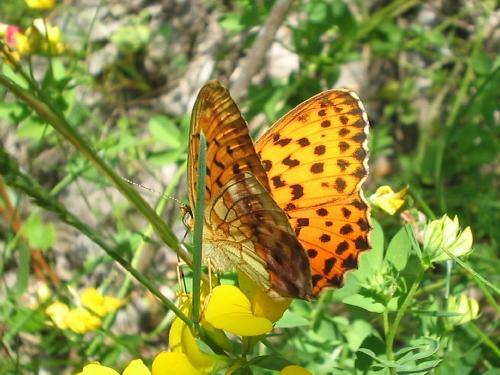 Nevertheless, some butterflies were about. 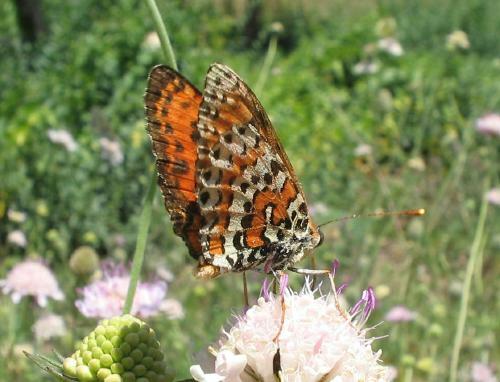 Painted ladies were bombing to and fro, though not so many as when they first arrived, before the cold spell. 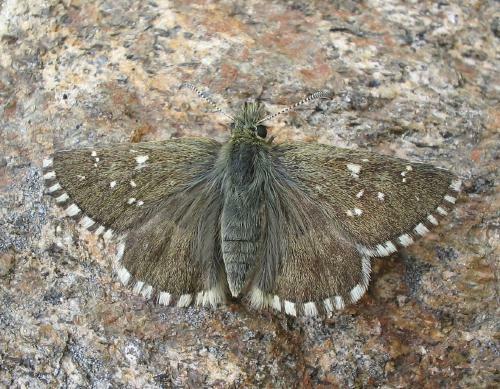 There were up to 5 geranium arguses in view at a time in my garden in the afternoon, and several grizzled skippers too. 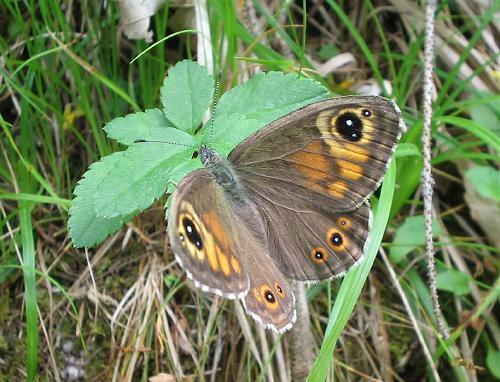 Photographed this large wall brown, my first of the year, during an afternoon dog walk. At about 5.30 it seemed to be getting generally brighter so I jumped on the bike and dropped down the road to Les Posses. 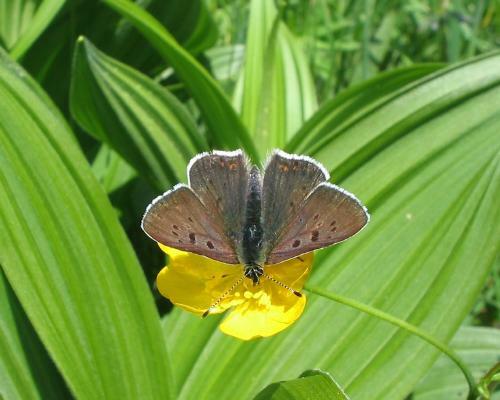 In the roadside meadows there were many species of blue, as well as grizzled skippers and red-underwing skippers. 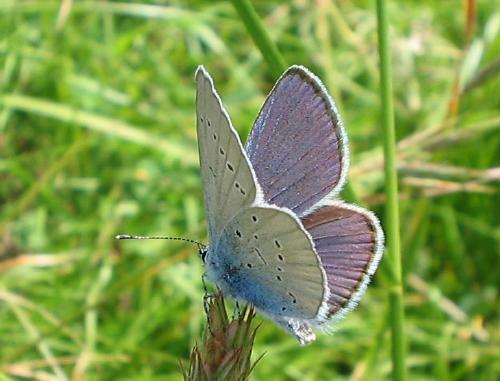 The blues included my first mazarine blues of the year, as well as adonis, Chapman's, common and little. I found no osiris blues. 5th: Not good weather on the whole. 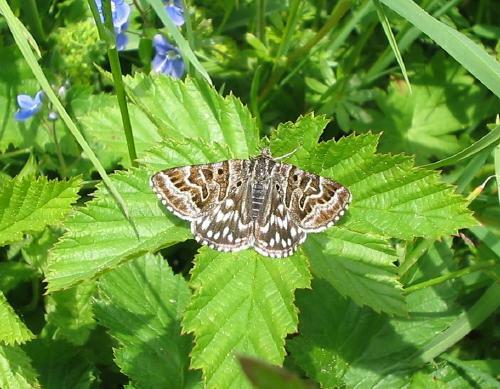 Nothing special flying, but I did photograph this rather lovely Mother Shipton moth showing particularly haggish markings (the moth is named after a celebrated 15th-16th century prophetic sorceress). 6th: Mixed cloud and sun. 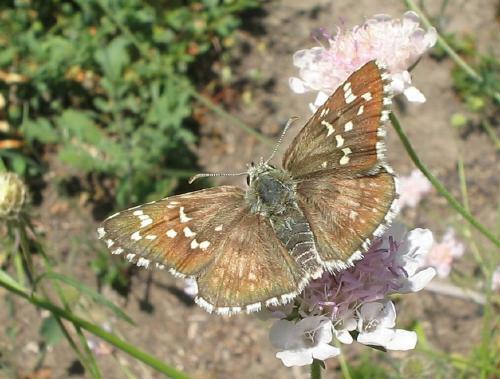 Speckled woods are now flying in the Gryon woods and geranium argues have proliferated over the last couple of days. 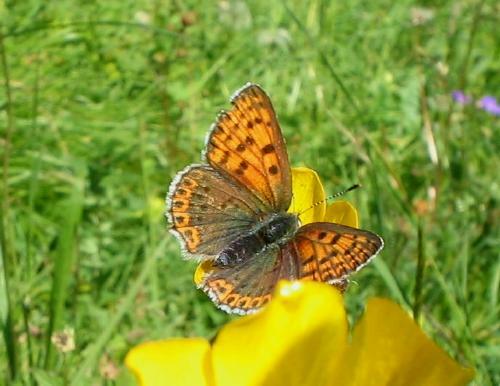 Several meadow fritillaries were also flying in Gryon, where the commonest blue was now Chapman's blue. 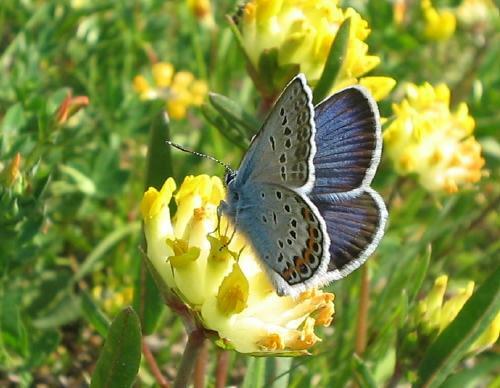 Some adonis blues are beginning to look a little tired but in general they are still prominent. 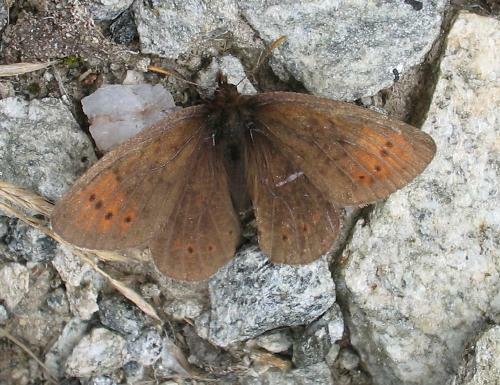 Male sooty coppers still very visible, with far fewer females in evidence. 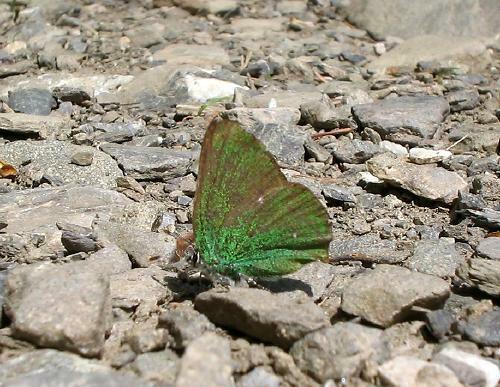 After school, at about 4.30, I visited my nearest violet copper site. 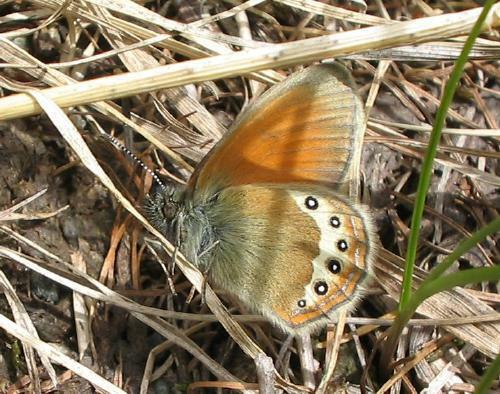 The weather was generally poor and little was flying but I saw and photographed a few coppers, including this upperside and underside of the same butterfly. 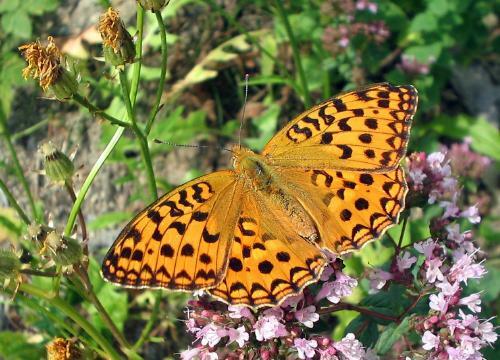 I possibly saw my first Titania's fritillary of the year cruising through, but it is early for this and I couldn't be certain in flight. 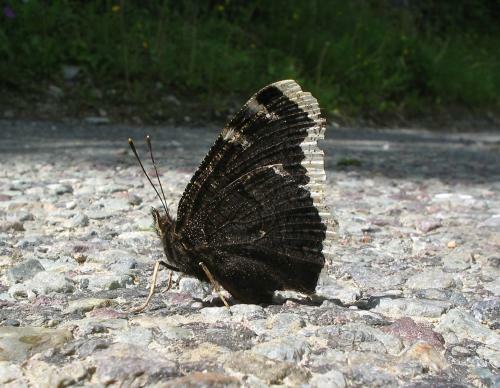 8th: Saw my first red admiral in Barboleuse in the afternoon. 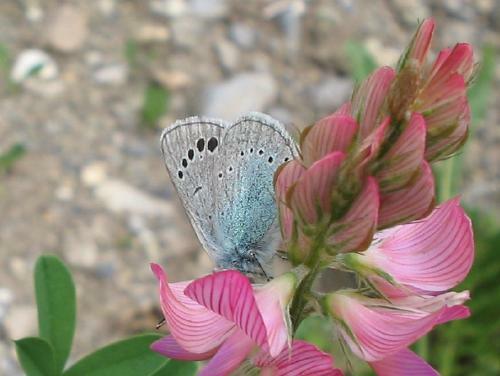 My osiris blue site, where I first found osiris on 5th June last year, in the company of silver-studded blues, is still barren, the sainfoin not yet in flower except for a few heads. Just a few Chapman's blues testing it out and then flying on. 9th: Hot and sunny pretty well all day. 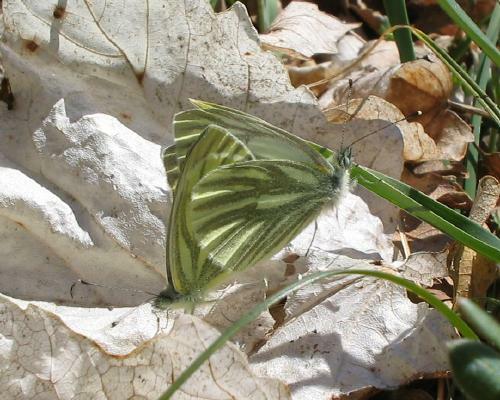 This first brood female green-veined white looks rather weary - the second brood will soon be on the wing. 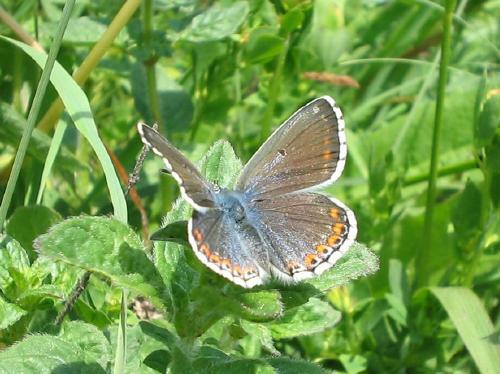 Mazarine blues have suddenly appeared in the garden, where sooty copper females are also flying, lots of geranium arguses and one or two grizzled skippers. 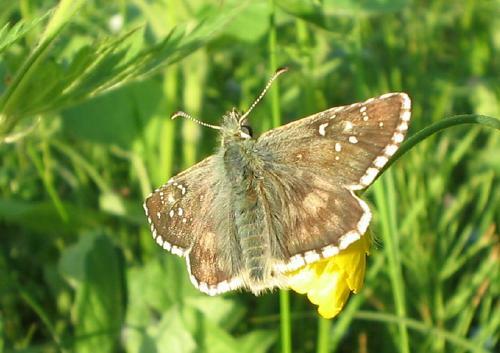 A single dingy skipper was defending a territory there and several Berger's pale clouded yellows (I think) flew through. 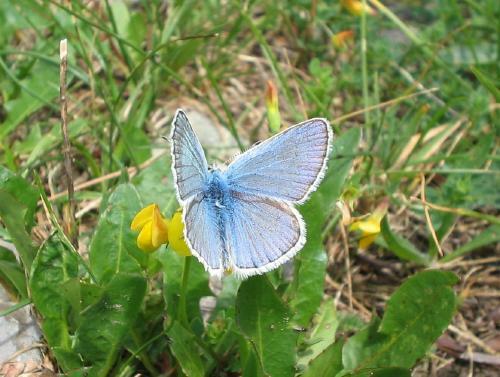 On the Barboleuse ski piste the first silver-studded blue of the season was flying, as well as lots of adonis blues (here is a female) and several Chapman's blues. 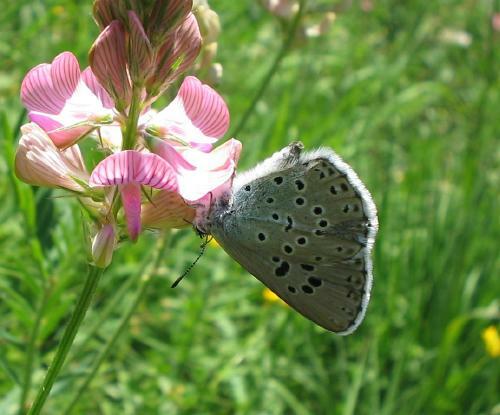 The osiris site (see 8th) had a few more sainfoin plants in flower and quite a few Chapman's blues, including this pair mating and this female. 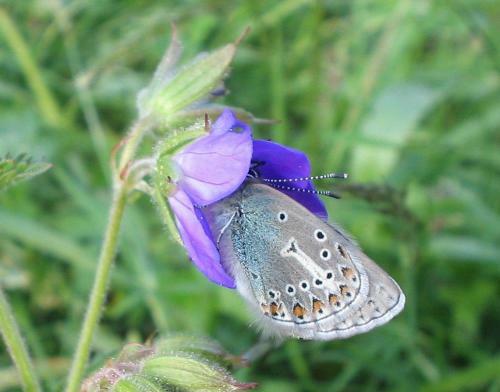 There were also adonis blues there. 10th: Hot and sunny. 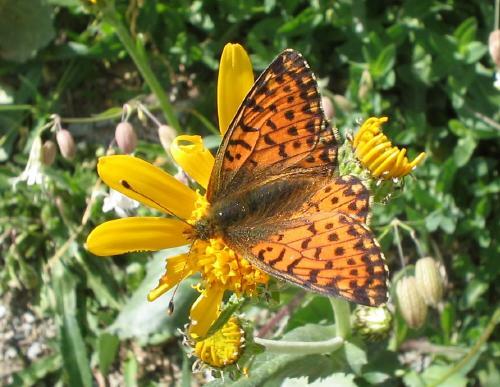 Took train trip with a friend to a region of the Rhône Valley known for the continuing presence there of Provençal fritillary (subspecies berisalii), a butterfly that has been driven from many Rhône Valley haunts through intensification of land use, particularly extension of vineyards. 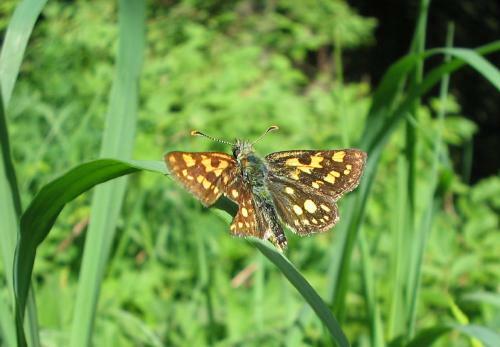 The trip was a success from this point of view, as well as for many other species. 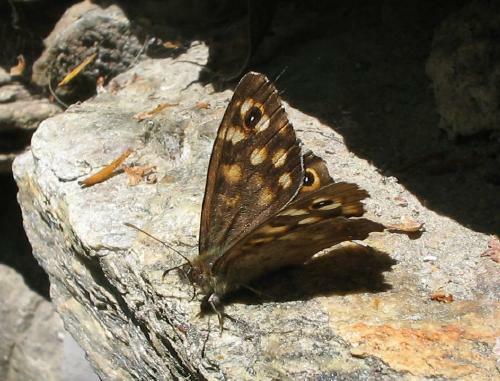 I probably saw many berisalii, though they were fresh and very reluctant to stop during the time we were there, thus it was not possible to identify with certainty each one. However, I did video one from some distance when it paused briefly and extracted these frames (here and here) which, though awful pictures, show enough to confirm berisalii. 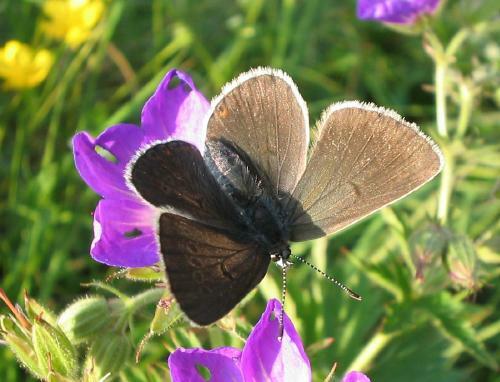 Note especially the engorged black submarginal lunules on the underside hindwing in one of the pictures. 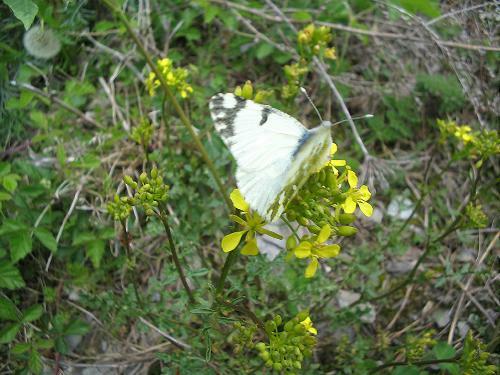 They were flying along hedged rides and tracks with thyme growing and scattered toadflax, the foodplant. 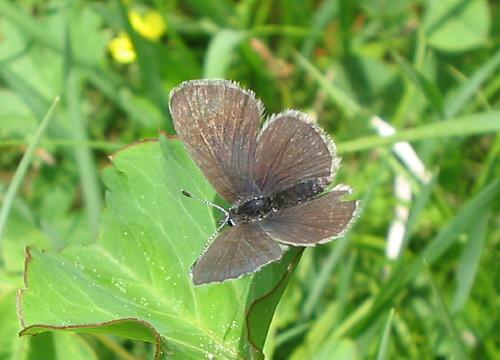 Also saw: wall brown; common blue; small and green-veined whites; large wall browns; purple-edged copper (my first of the year); large skipper (common); little blue; Provençal short-tailed blue (males and females, reasonably common); Southern white admiral (6-8 during trip, all presumably males, defending territories from trees and usually out of reach of the camera); lots of Zephyr blues, subspecies trappi (here and here are some more pictures); apollos (common); swallowtail (several, including one female which laid this egg); scarce swallowtail (many, including this group of four drinking); small heath; safflower skipper (common); black-veined whites (many, including these drinking with a safflower skipper); adonis blue (several); grizzled skipper (one); wood white (a few, looking a little weary); marbled skipper (just one or possibly two); Berger's pale clouded yellow (many); marbled fritillary (one or two); Queen of Spain fritillary (several); knapweed fritillary (common locally); Bath white (two); Camberwell beauty (two, including this extremely tired and worn individual! 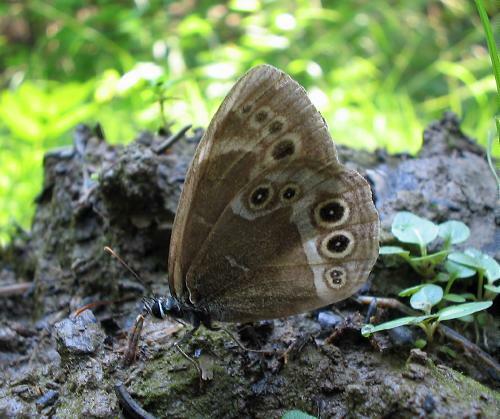 ); several unidentified Erebia that never stopped - but possibly Piedmont ringlet; probable great sooty satyr (two possible males and a possible female - but they appeared when I was preoccupied with other things! 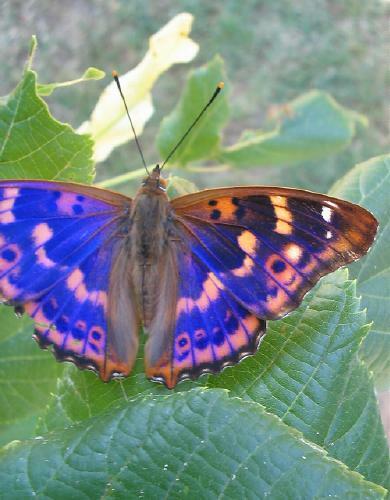 ); red admiral (a few); painted lady (a few); purple-shot copper (a single, rather fresh and beautiful, male); comma (one). I am sure I have forgotten a few things in this list! 11th: Took a short walk a little higher, near Solalex. Very little happening at altitude. 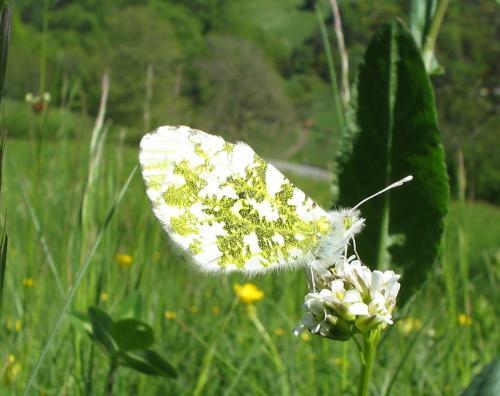 Lower down, found pearl-bordered fritillary, green hairstreak, grizzled skipper, northern wall brown, mountain green-veined white (first of the year, also here), orange tips and a few whites. 12th: Hot and sunny. 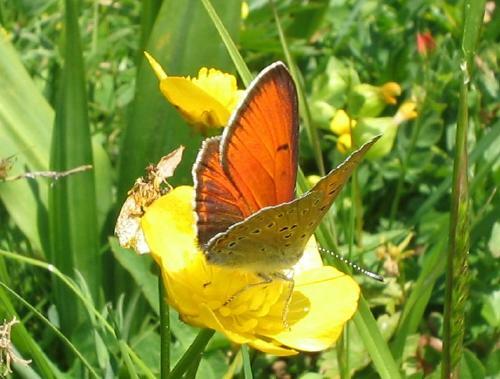 Purple-edged copper flying in Gryon. 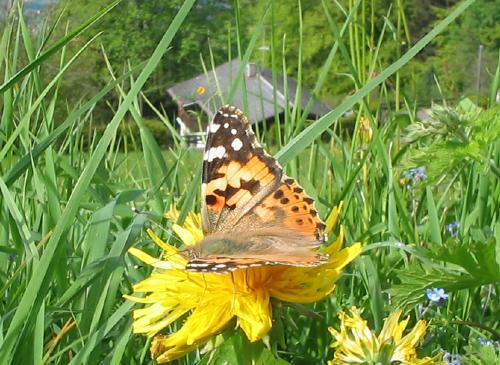 Red admirals around, as well as painted ladies. 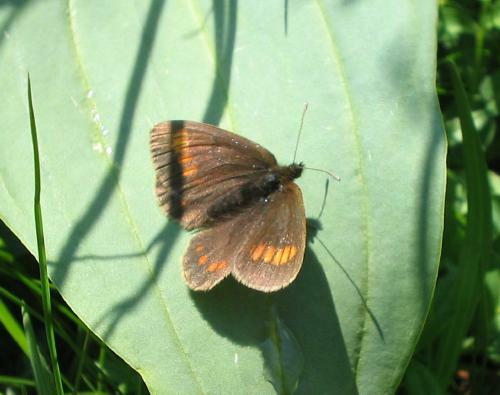 Large wall browns commoner now and female sooty coppers frequent. 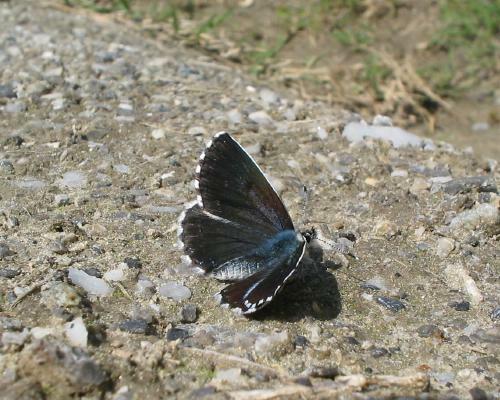 First Osiris blue of the year, at a new site. 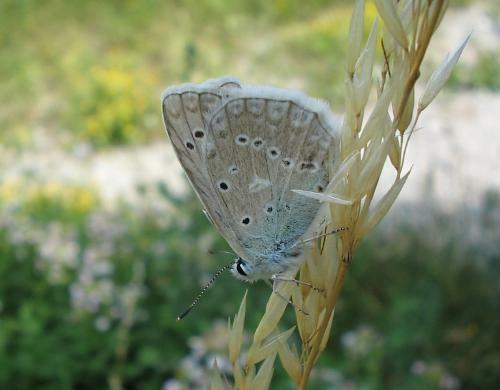 This one was a female and I was initially a little unsure that it wasn't a large female little blue. Here is another picture. 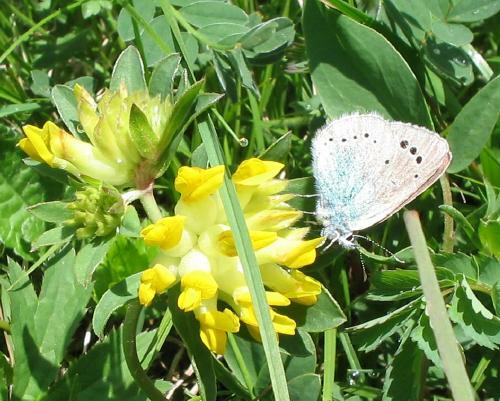 However, the discovery of males at the same site on 13th dispelled that doubt. 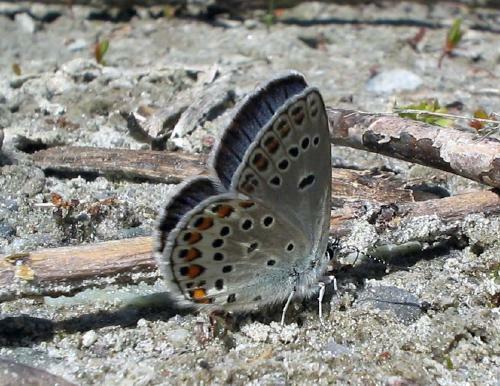 13th: Male Osiris blue in site discovered yesterday. At lunchtime a single male was cruising around in what seemed to be aggressive defence of his territory. By the time I came home from school in the early evening there were several males, even more restless, rarely stopping for long. 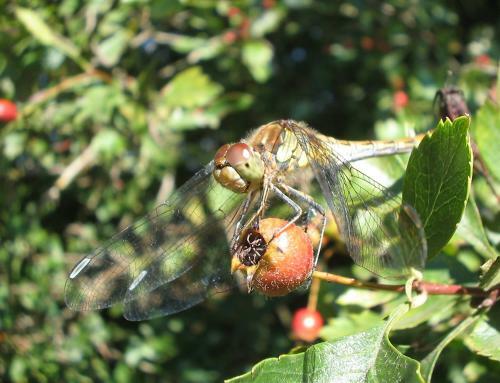 Here is one of them during a brief pause - not long enough for me to get in really close. It wasn't me that was making them twitchy and restless. Even when I stood at a distance and watched they hardly ever stayed in the same place longer than a few seconds. 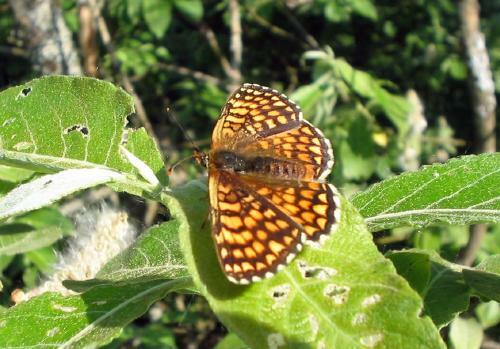 Earlier in the day saw a single small-pearl-bordered fritillary in woods near Gryon. 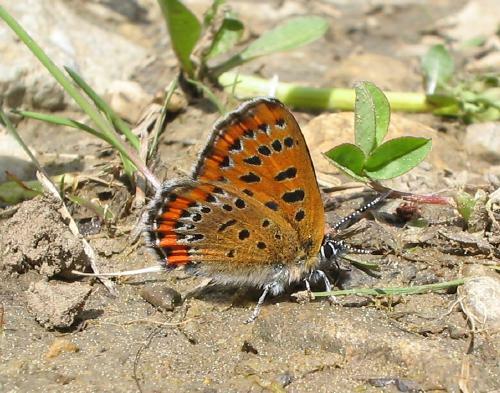 Purple-edged copper now numerous around Gryon. 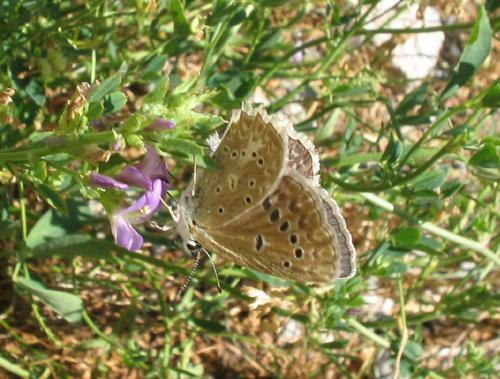 14th: In early evening, but slightly later than yesterday, at yesterday's osiris blue site, there was not a single osiris blue. 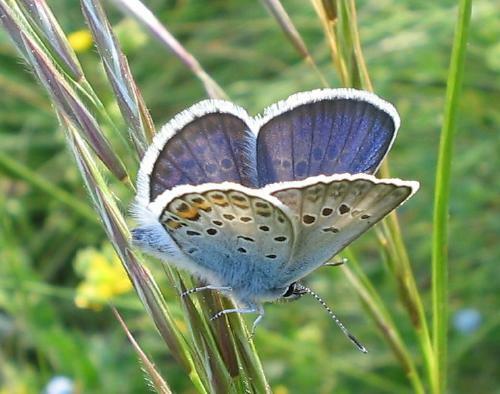 Instead, lots of silver-studded blues and little blues, as well as mazarine blues and an adonis blue or two. 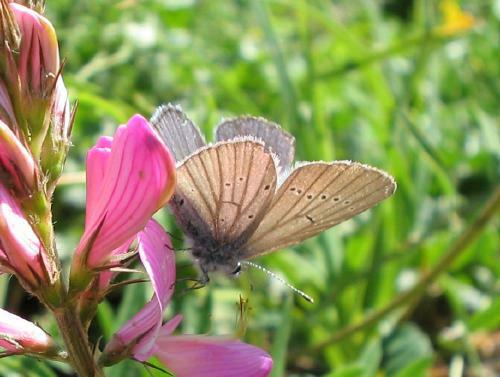 Yesterday it was almost exclusively osiris and little, with geranium arguses too. Saw no osiris blues anywhere today! 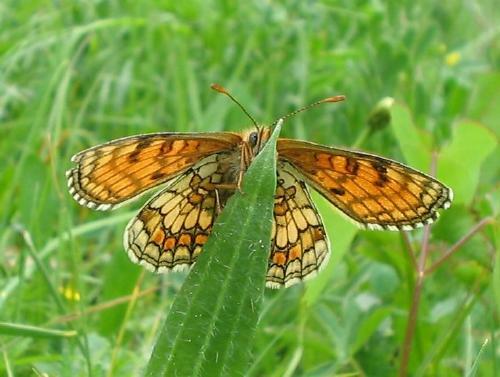 First false heath fritillary of the year flew past and I saw two heath fritillaries, this male and this female. 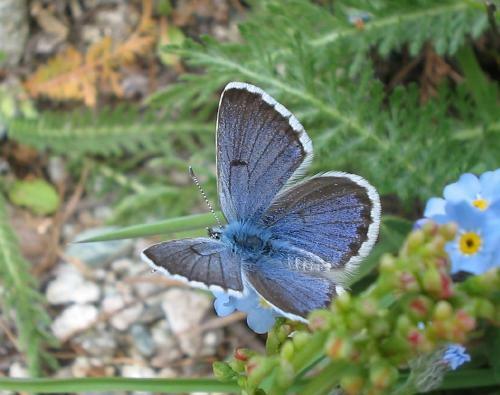 In my garden, silver-studded blues were suddenly common but it was striking that they were all rather large and entirely without silver studs, except for a scale or two (literally) on one or two individuals. 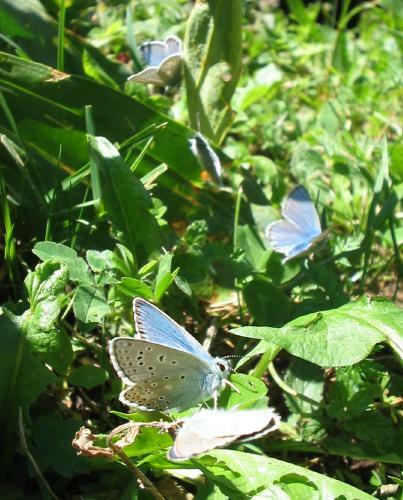 Here are some silver studded blues from my garden (all different individuals): here, here, here, here, here and here. 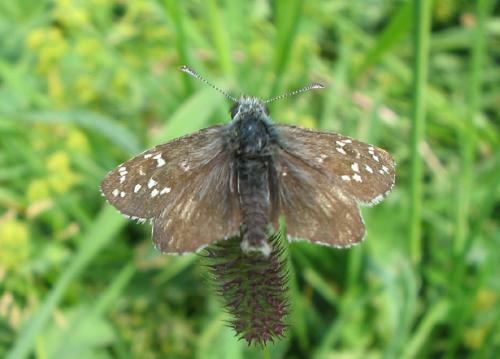 Also had a brief appearance in garden of this female large grizzled skipper. 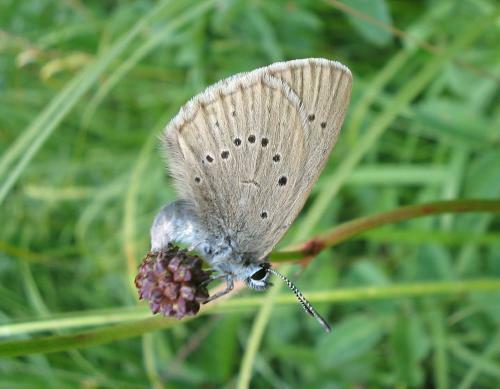 Initially I was unsure about its identity because of the reduced forewing markings but careful study of the books makes me believe it must be this - Higgins and Riley in particular mention that reduced forewing markings are common in the female. It was strikingly large and very powerful too, cruising around at speeds almost impossble to follow with the eye. 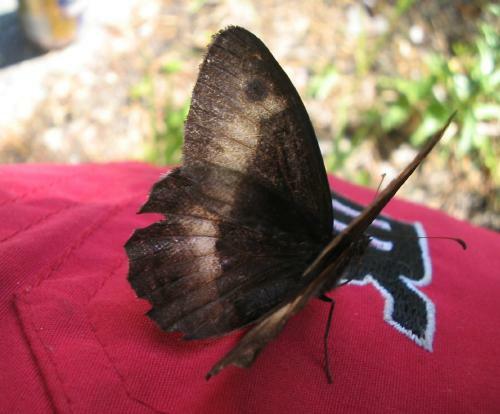 It never showed its underside but held its wings rigidly and purposefully out flat when it stopped. 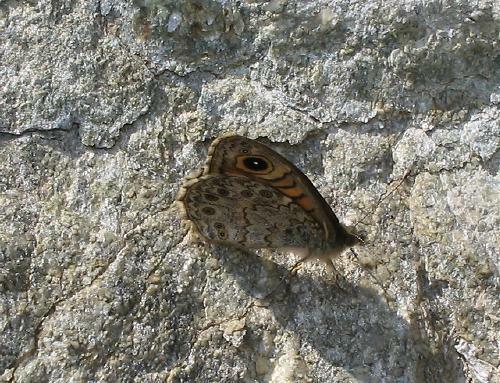 Large wall now common, including females. 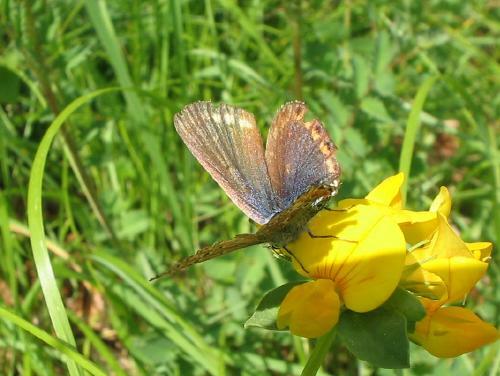 In the evening, this geranium argus posed for me beautifully (and here). 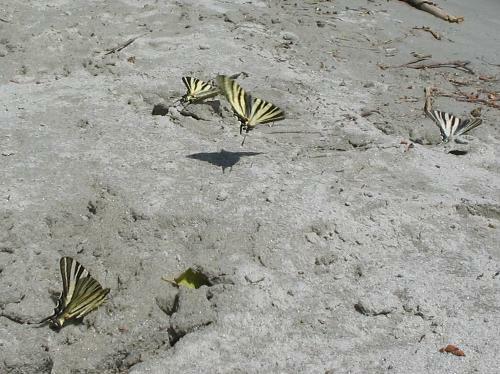 15th: Osiris site active at lunchtime, with several males disporting themselves conspicuously. Here is one. When I returned in the evening they were still in evidence. 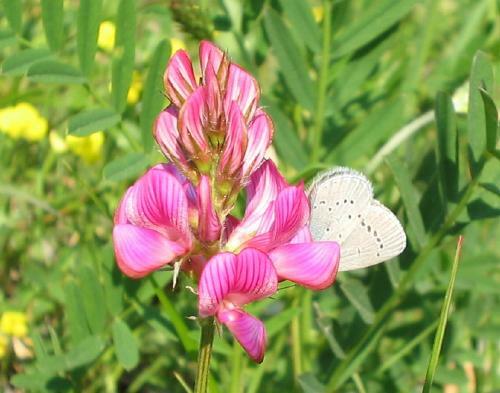 Here is another enjoying a head of sainfoin. 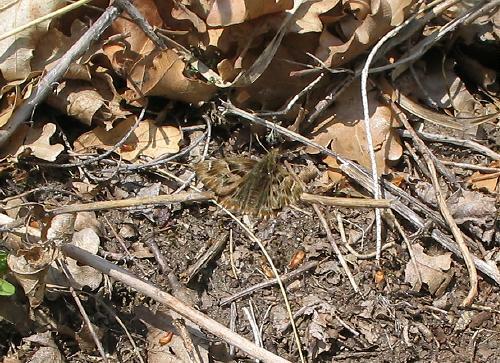 In the afternoon I finished early and zoomed off to check a woodland brown site but there was nothing flying there. A couple of large walls had me excited for a millisecond... 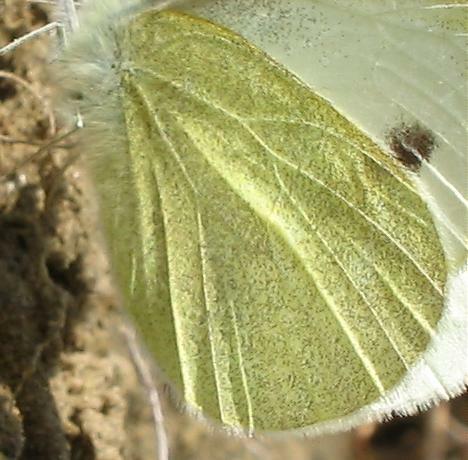 I haven't mentioned large whites much recently but they are having a good year. Here is a male. 16th: Dull but warm in morning, brightening up in middle of day. In the late afternoon I visited my nearest iolas blue site. As I arrived it was overcast and even raining a little, but I found this male (I think it was a male - I only saw it flying silhouetted against the sky) anyway. Before I could get a better picture I fell over. 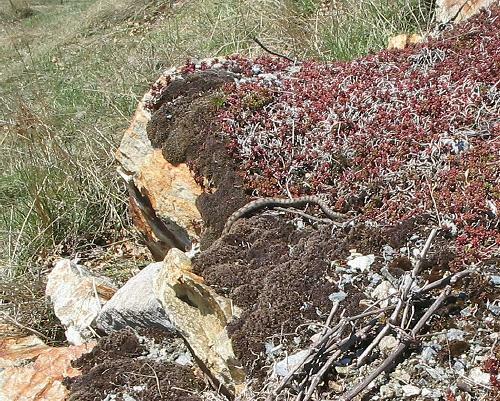 The site is a 45° slope on loose rocks with thistles, thorns, prickles and spiny things everywhere. Later, the sun came out and the iolas blues became very visible. I saw at least 4-5 males and probably 2 females, at a conservative estimate, but in practice I was seeing iolas blues almost constantly. It seemed they had all overdosed on coffee because they settled for seconds, then zoomed off at remarkable speed to the next 1km grid square. 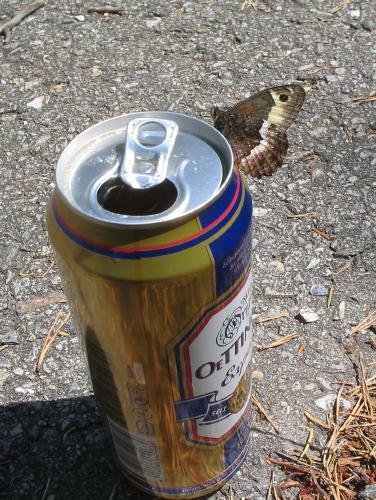 I think this might be Europe's fastest butterfly. 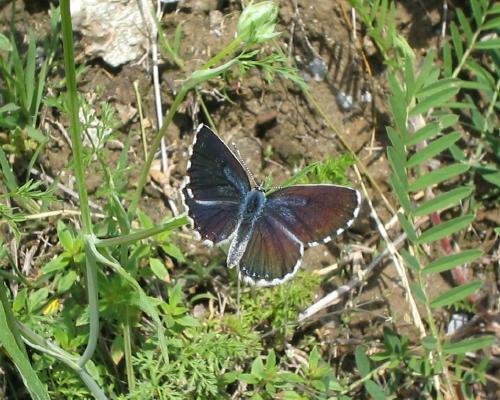 All this had nothing to do with me disturbing them - I stood at a distance and watched (the best way to see this butterfly). 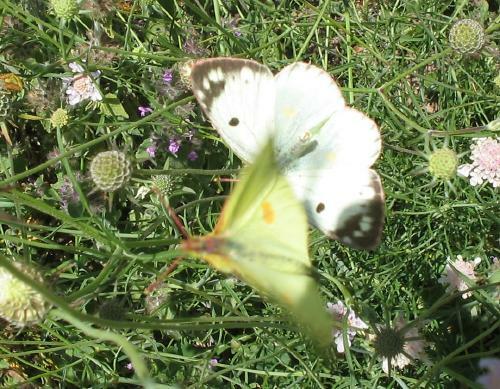 Photographs were well-nigh impossible because of the sheer energy of the butterflies in the evening heat. I did get this further picture, for which the male iolas cunningly secreted himself the other side of the leaf just as I was focusing. 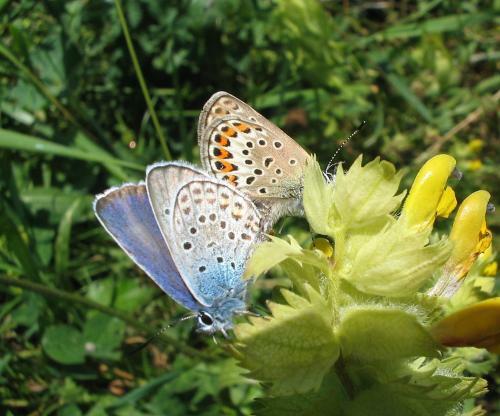 Best of all was watching a male and female flirting, the female flying ahead with very rapid wing beats. 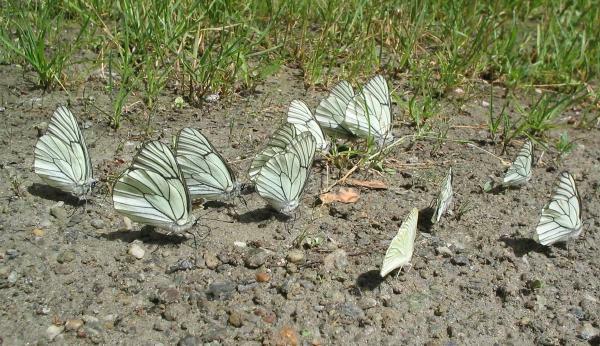 I thought they might settle within reach but a second male joined in and the whole lot left for France. Iolas blue is quite unlike any other European blue for its sheer size and power! 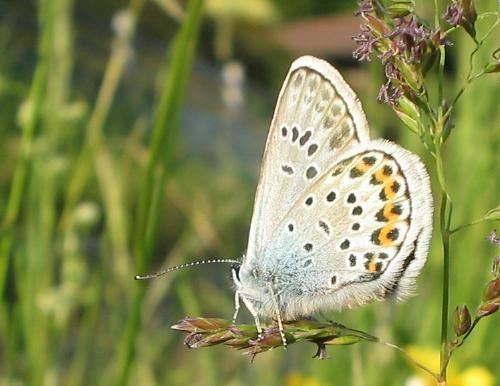 At the same site was a high brown or niobe fritillary - it never settled within sight either - and plenty of other normal blues, moseying around in pedestrian fashion, including holly blue (lots), common blue and adonis blue. 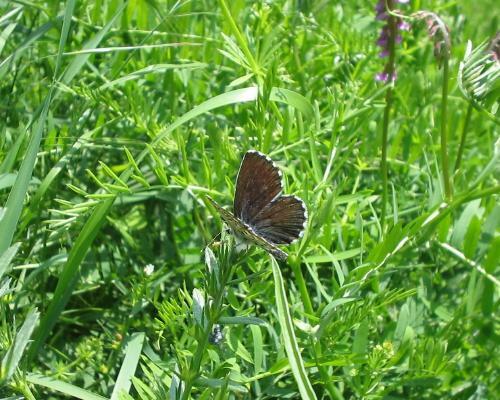 There was also a single apollo, a single scarce swallowtail, some false heath fritillaries, Berger's/pale clouded yellows and some whites. 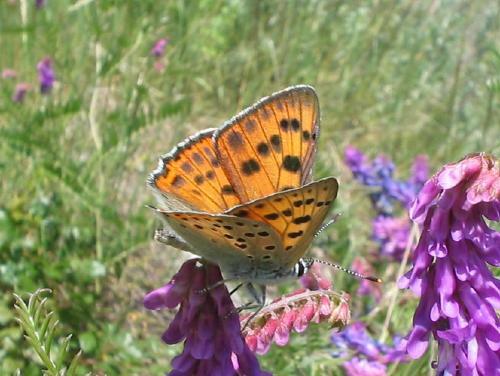 18th: Trip to Provençal fritillary site in Rhône Valley with Matt Rowlings, then going a little higher up a subsidiary valley. Plenty to see! 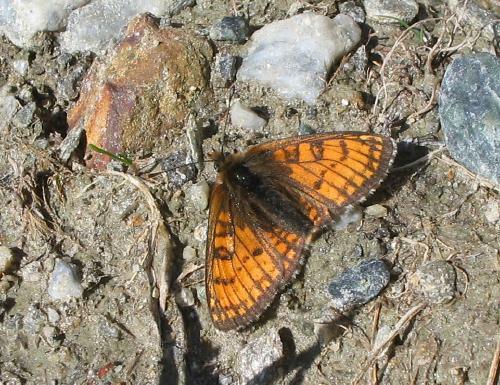 Wall browns were present but not really common. 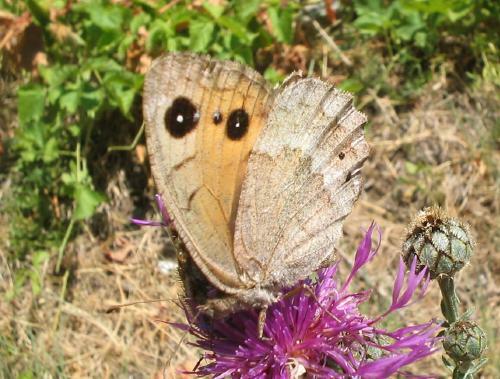 Large wall browns occasional and northern wall brown at one of the higher sites (at least two individuals). A few commas. 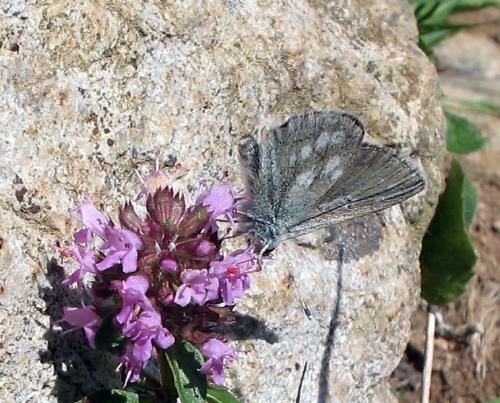 Zephyr blue common, as last week; safflower skipper still common too; first small skippers on the wing, as well as plenty of large skippers; knapweed fritillary (several); a single ilex hairstreak; black-veined white (now common, and gathering in quite large numbers at certain water spots - but note the nearest white in this picture is a southern small white); small tortoiseshell around; large tortoiseshell now on the wing for the summer brood (just one found); high brown fritillary (several probably - just one formally identified); lots of Provençal fritillaries - by far the commonest Mellicta/Melitaea at the site. 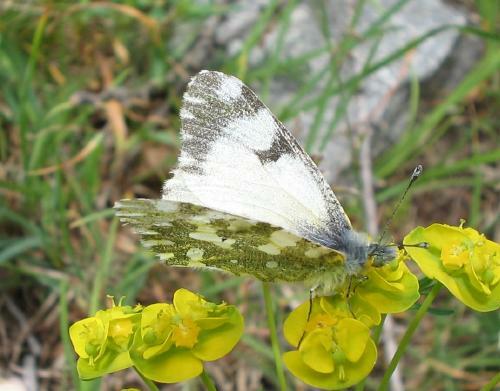 Here is another male upperside, male underside and a male on the foodplant, toadflax. 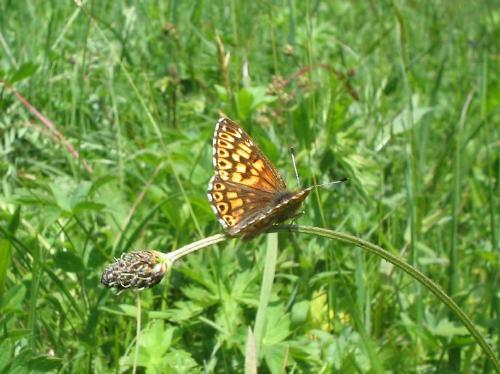 Unlike last week, the fritillaries were stopping regularly today. 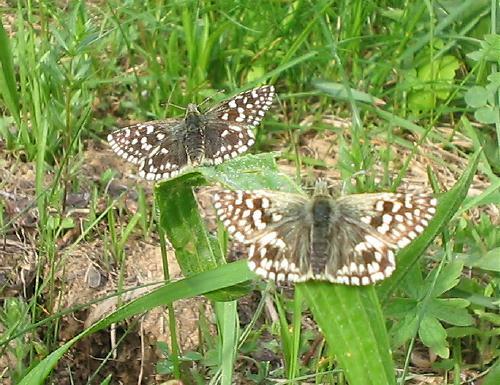 They were flying with knapweed fritillaries, from which they were easily separated by smaller size and much gentler flight. 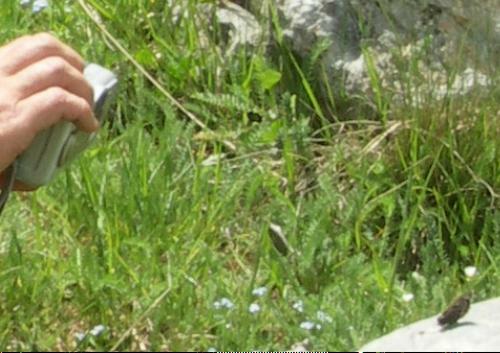 Apollo (quite frequent, including this freshly emerged specimen on Matt's hand); scarce swallowtail (a few); swallowtail (a few, including this one drinking with the black-veined whites); southern white admiral (several, very conspicuous locally); northern brown argus (one or two); southern small white; green-veined white; small white; large white; Bath white (just one); mountain dappled white (here is an underside shot); orange tip; baton blue (two or three, at relatively high altitude and in very good condition); Alpine grizzled skipper (here is another individual); Alpine heath (butterflies in this region are often intermediate between the Alpine heath, gardetta, and Darwin's heath, darwiniana, but for the individuals we saw today I tend towards gardetta. 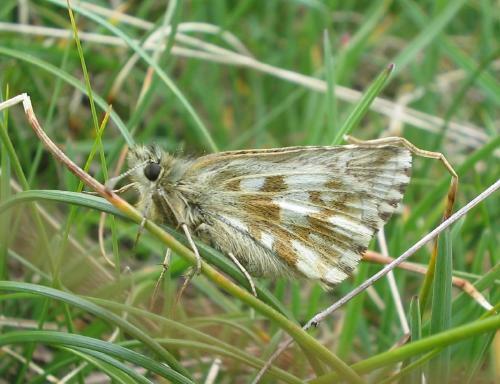 Quite probably we saw a single olive skipper but it got away and I still have yet to get this species without any possible doubt! 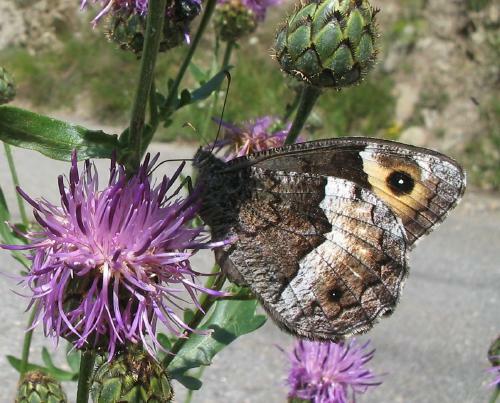 Best butterfly of the day for me was a single Alpine grayling, seen near the end. This was a life tick. Sadly, my batteries gave on the digital camera exactly as I took a wonderful picture. 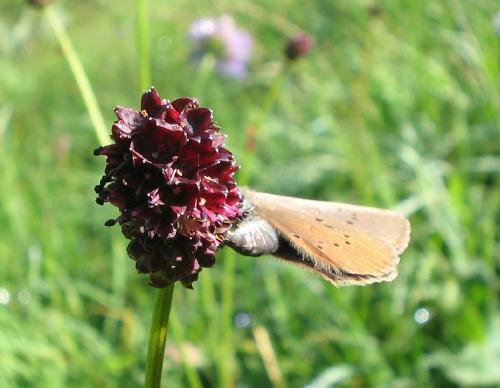 However, Matt did get this picture of me photographing it, of which a detail just shows the buttefly... This was the most exciting moment of 2006 so far so I am glad there is at least some record of it! Thank you, Matt! An interesting observation on 18th. 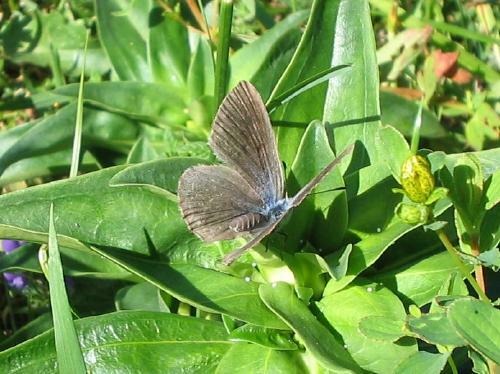 My dog, Asha, was standing and barking at the water's edge, some 5m or so away from a zephyr blue that Matt and I were watching. Asha wanted us to throw sticks into the water for her; the blue wanted a peaceful mineral-supping session. 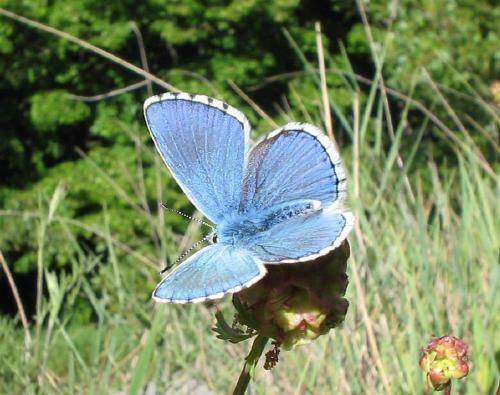 The blue's wings were closed over its back but at frequent, irregular intervals it would flash them momently wide open and closed again. Suddenly it dawned on me (and presumably Matt at about the same time) that the flashes coincided precisely with my dog's barks. 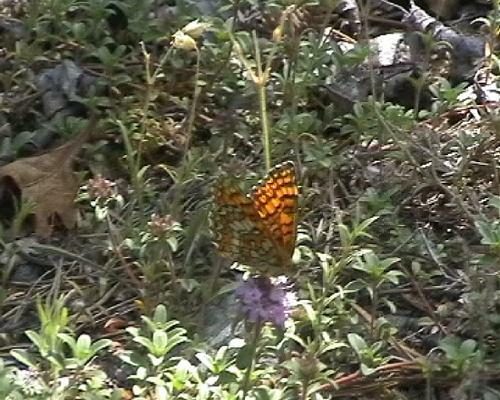 Instant reaction - no apparent delay at all, so it looked as though the butterfly were barking. Furthermore, it was every bark, without exception - an automatic and instantaneous transmission of noise into flashes of blue. 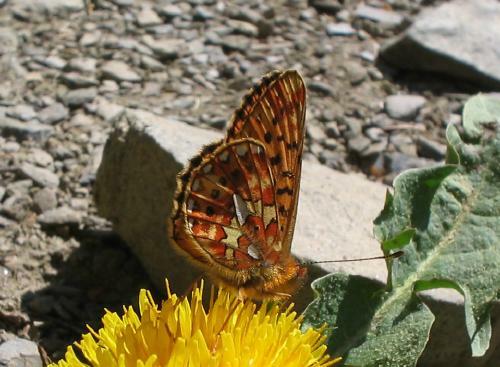 19th: Titania's fritillary appeared today in Gryon and round about - I saw several all of a sudden. 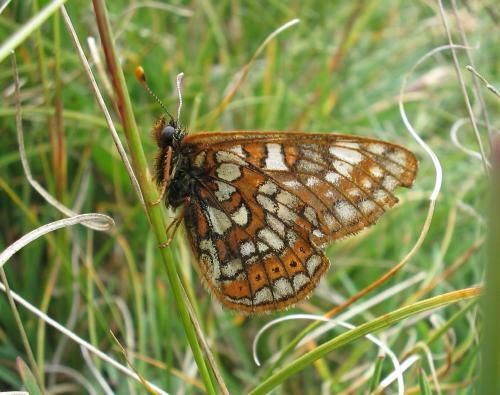 Also saw my first marsh fritillary of the year - very fresh, large and bright and impossible to get a good picture of. This was on a quick cycle ride taking me a little higher up the mountain. 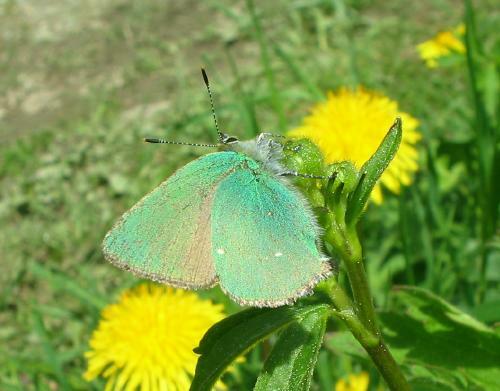 I also saw my first bright-eyed ringlet on the same walk, as well as plenty of dingy skippers, this lovely swallowtail, loads of silver-studded and other blues, whites, orange tips, a few chequered skippers, this rather tatty green hairstreak, pearl-bordered fritillaries (commonly) and several yellows. 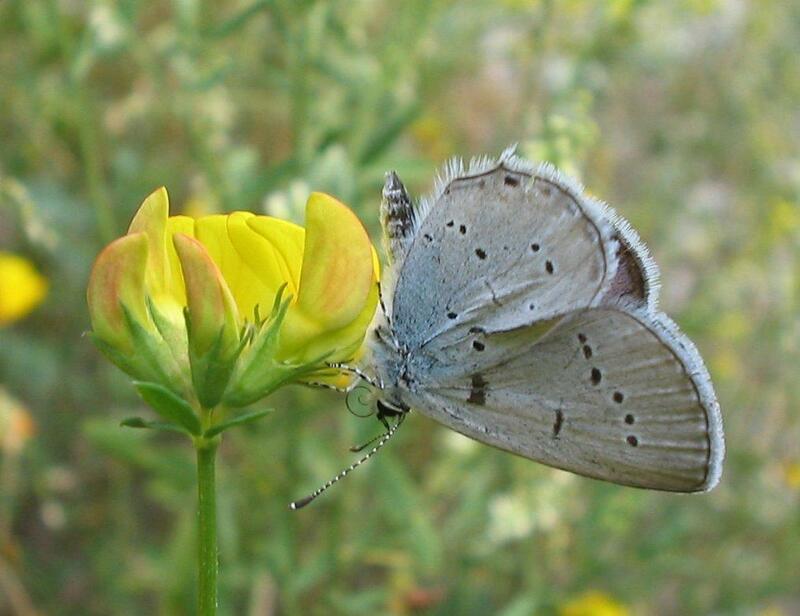 On my return at about 5.15, a single osiris blue was flying at the osiris site, together with lots of silver-studded blues and some mazarine blues. 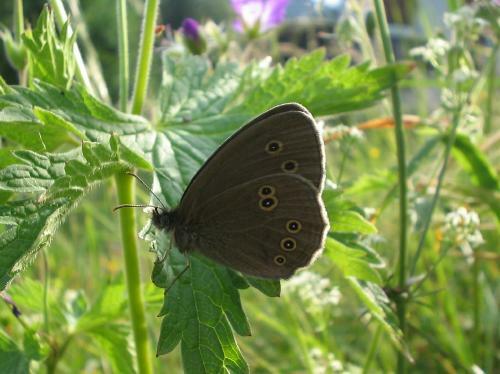 In the evening, my first ringlet of the year appeared in the garden. 20th: An interesting day, though I didn't get anything new. 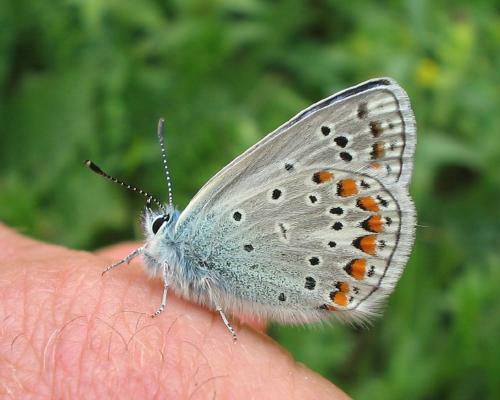 The Osiris blue/silver-studded blue site of last year suddenly started producing - there were none of either species there yesterday. 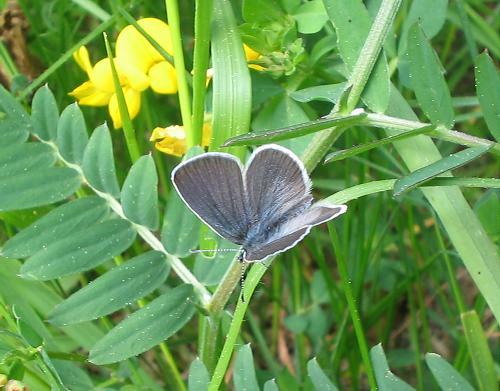 Today there were many silver-stdded blues and a single male Osiris (at least). 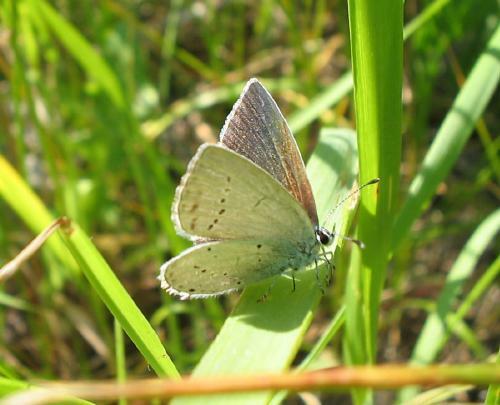 There was also this male green-underside blue (and here) - the closest I have ever had this to where I live (I thought it didn't live up here on the hill before this year). 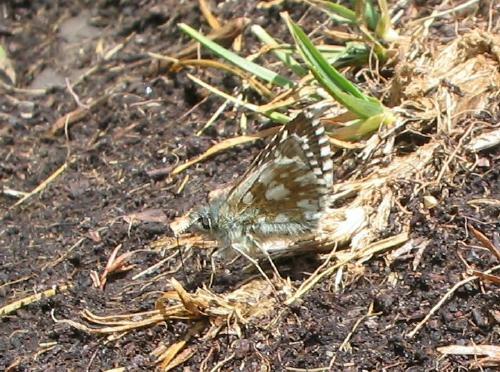 In my garden I photographed another Pyrgus skipper, this time a male. 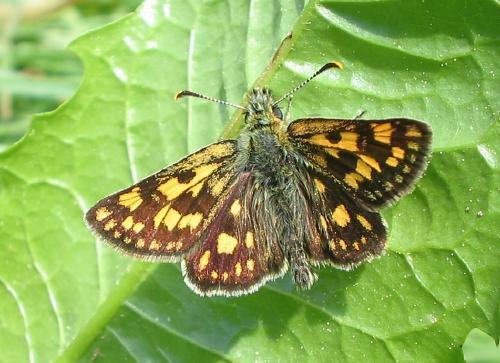 Tim Cowles had cast doubt on my previous large grizzled skipper from the garden, suggesting that it was a carline skipper. 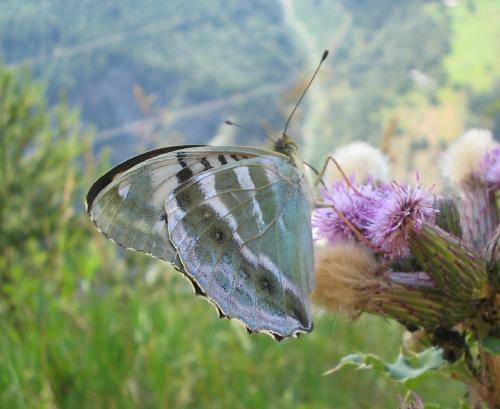 I was in two minds, because it was very big and didn't behave like carline and was also very early and rather low down (1300m) - but I had no underside to check. Here are two photographs of the male from today - here and here. I did hesitate again, believing it might be carline, but after studying the books have come down again on the side of large grizzled. 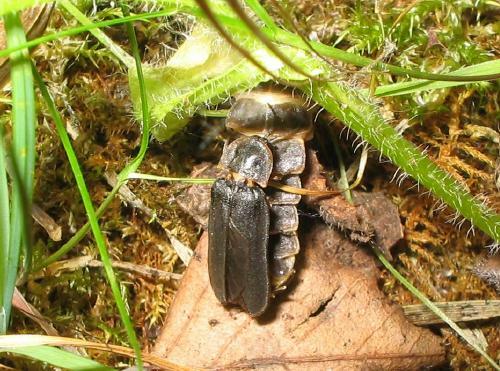 Any clarification from someone who knows these insects well would be gratefully received! 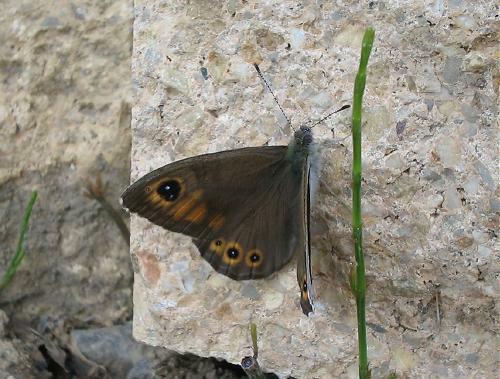 Also managed to photograph this female large wall brown, which posed well under dark skies as a storm moved in. 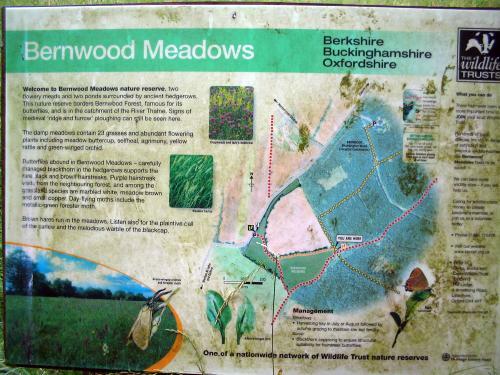 Visited a woodland brown site but there were none there yet - it is still a late year. 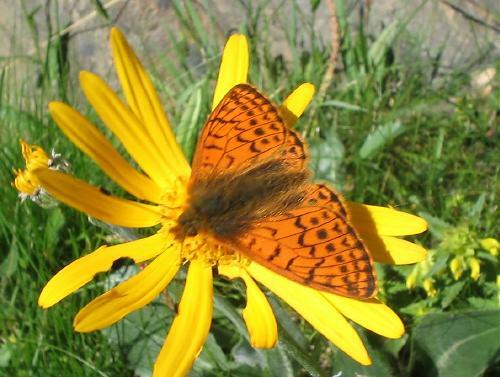 Pearl-bordered fritillary unusually common everywhere. 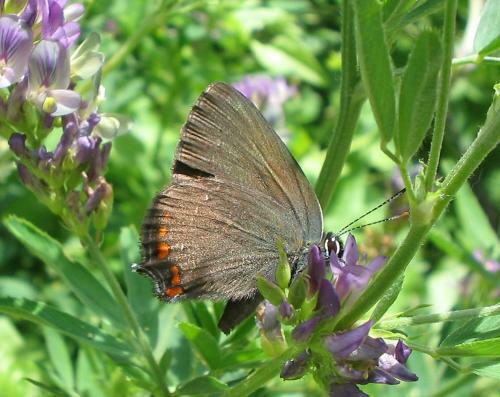 21st: Going down with a nasty cold, so butterfly-watching restricted to sitting for half and hour in the garden with a cup of soup. It was worth it, though. 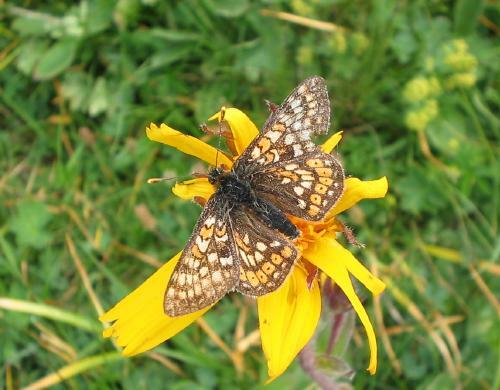 The first lesser marbled fritillary of the year came through, accompanied by the second. 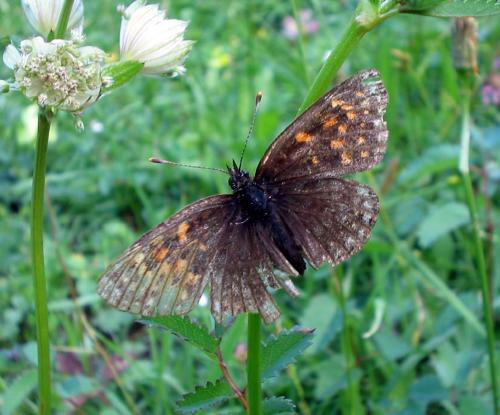 A tufted marbled skipper set up his territory too - this is always a welcome sight. I see them here every year but in such low densities I always wonder for how much longer they will remain. Here is a close-up of him. 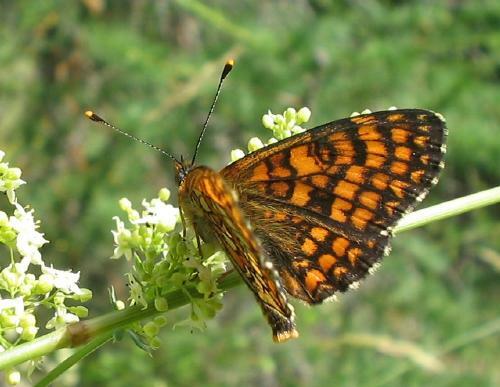 This heath fritillary was quite accessible too. 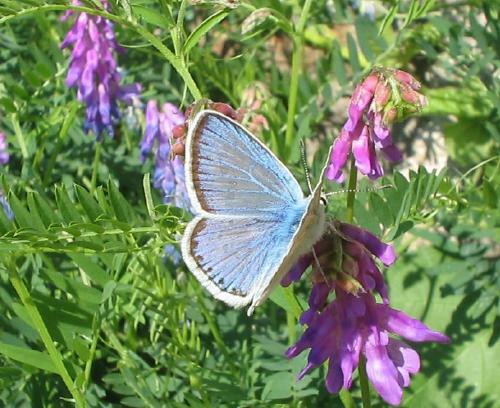 The garden was alive with silver-studded blues, adonis blues (now rather old), common blues, mazarine blues, whites, yellows, dingy skippers and more. 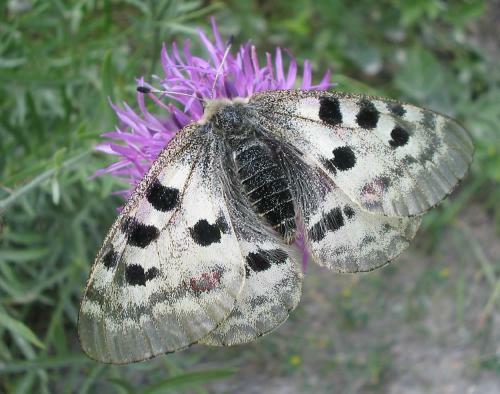 There was one highly mutant Mellicta fritillary that passed through - but I couldn't photograph it. 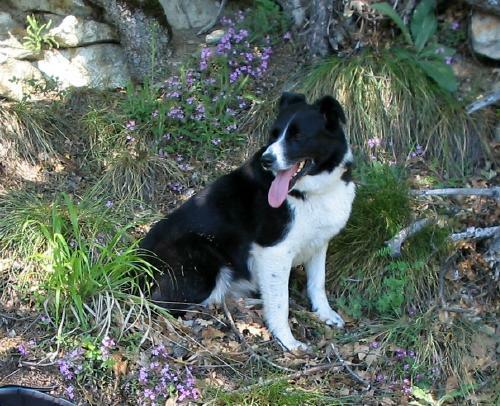 Actually, being ill doesn't relieve me of dog-walking duty, and I took Asha out in late morning. 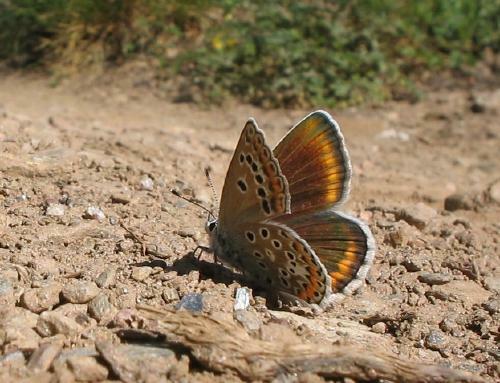 Saw a single female osiris blue on one site and lots of silver-studded blues. 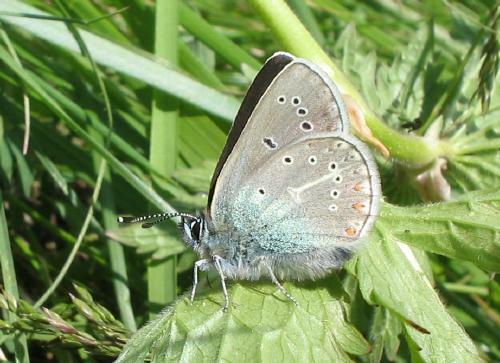 Bizarrely, a huge blue flew through this site, which I took at first for a large blue. 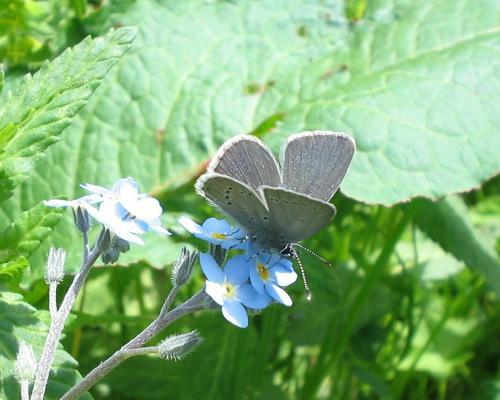 It settled for a moment, revealing clear blue ups with a narrow border and smooth, dark cream uns. It then bounced away in a single leap. 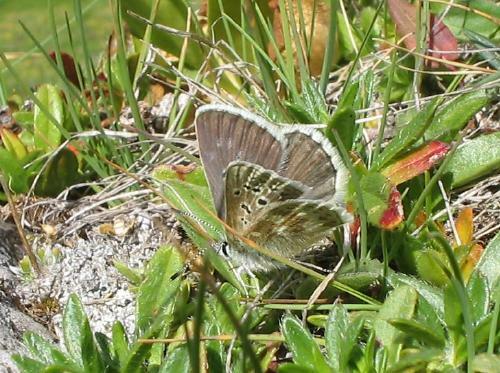 There are only two possibilities: iolas blue, which I have never seen up here before (nor have I seen the food-plant), but which it most resembled by size, pattern and behaviour; or mountain alcon blue, which it didn't really resemble in the brief view I got but which does fly on hillsides around here. Quite possibly I will never know. 23rd: Have been ill for last three days. 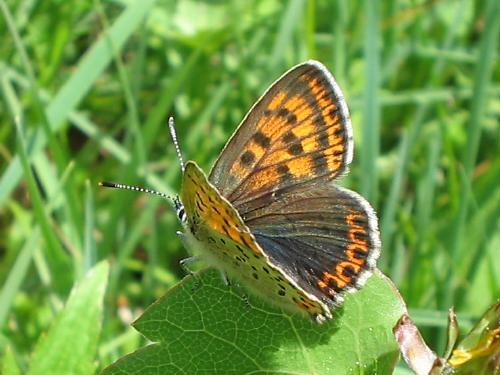 But in brief ventures outside photogrpahed this slightly variant heath fritillary in the garden (not as strange as one I saw recently but could not photograph - and I don't think it is a meadow fritillary) and this obliging male purple-edged copper. 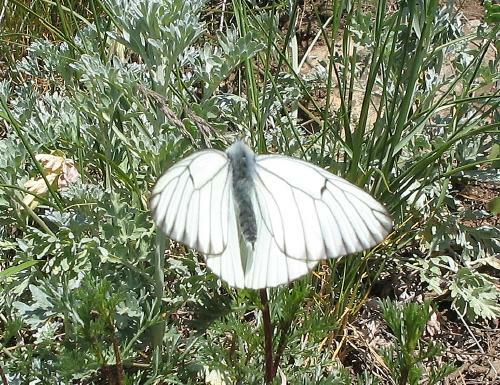 Here is a summer brood small white. 24th: Still ill, but the weather too good not to pause a little outside (and dogs need walking anyway). 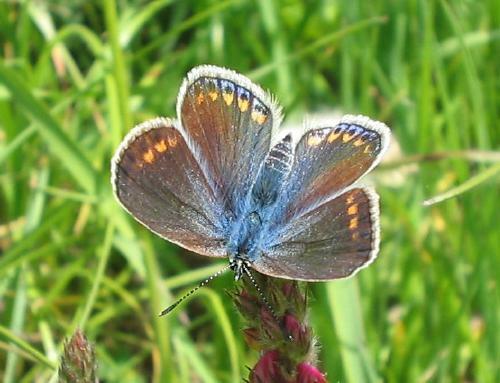 Here are a false heath fritillary, a large blue supping on sainfoin, a pair of silver-studded blues in my garden (unusually, for my garden, with visible silver studs) and a freshly emerged small tortoiseshell with brilliant blue trimming. 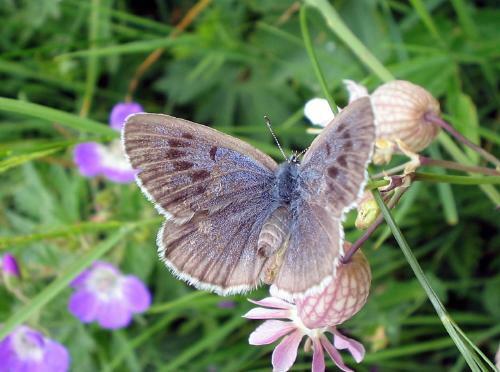 Blues and fritillaries abound in the meadows, with purple-edged coppers, black-veined whites, yellows and skippers all there too. 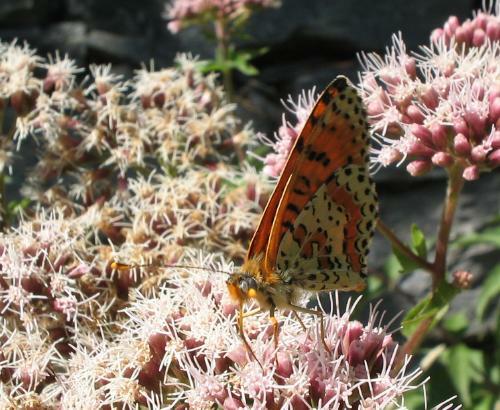 It is a remarkable time of year in the mountains. 26th: In Oxford for a conference. 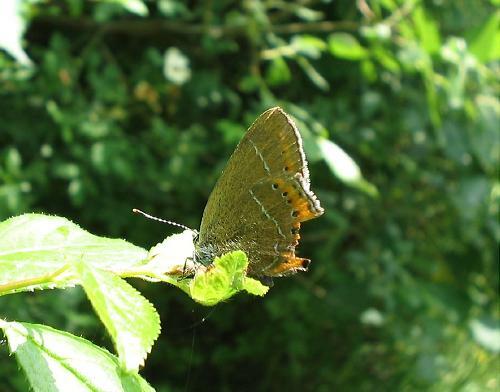 So cycled out to my old black hairstreak haunts, despite persistent rain, to identify present best sites. 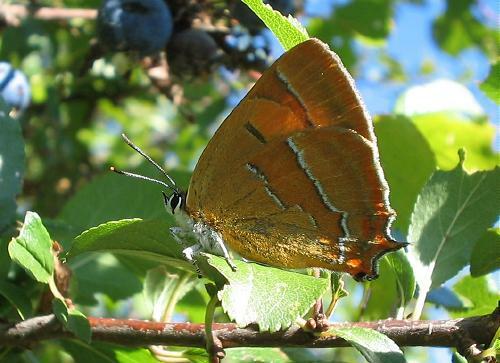 This seemed not to be difficult, as there were signs in the woods with large pictures of black hairstreaks, confirming I had hit the spot (these signs were not there when I was a student!). 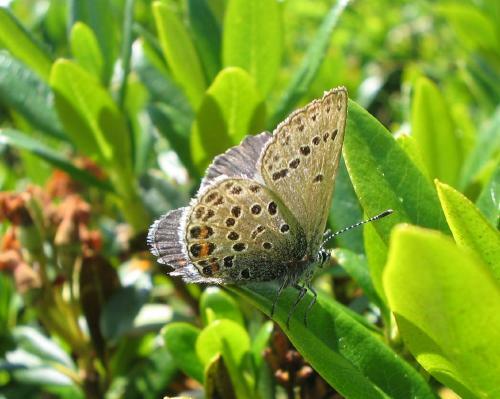 But the weather precluded any butterfly-watching. 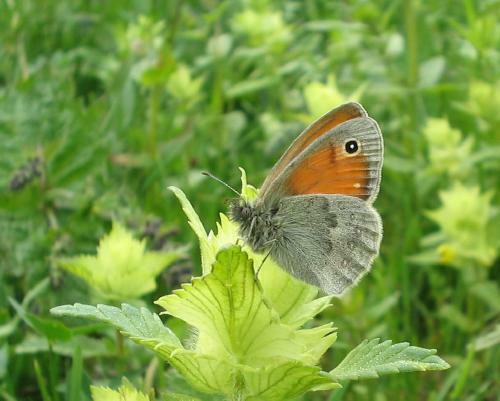 A few ringlets were braving it (it was warm) and a meadow brown or two too - my first for the year. 27th: Slightly warmer, and no rain, but no sun either while I was at the relevant sites. 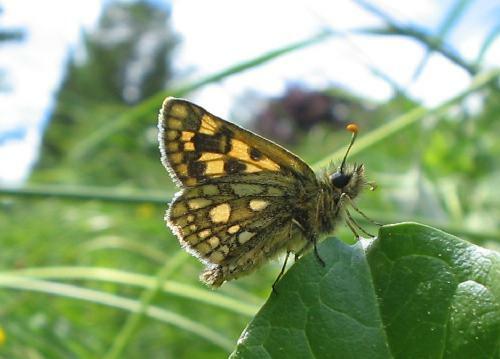 More butterflies were flying though, including several large skippers, a lot of ringlets and meadow browns, several speckled woods and two white admirals, again my first for the year. 29th: At last some sun - and the conference was finished so some time too. 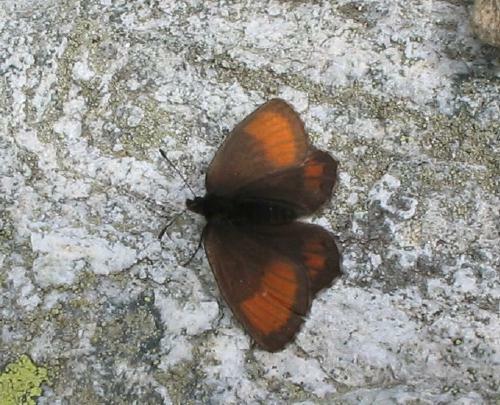 Five hours at various Bernwood Forest sites produced 8 sightings of black hairstreak, of which two were good close views. But none stayed put long enough to get even a bad picture. That will have to wait for tomorrow. The day was successful in other ways though. 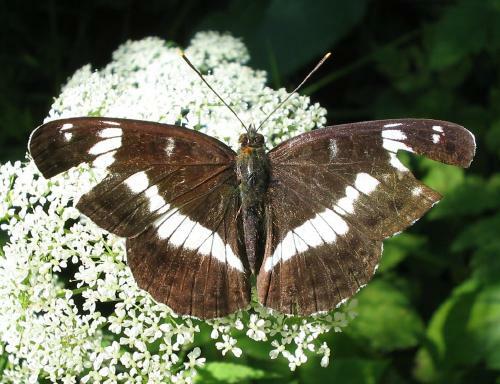 I have never seen so many white admirals in a UK site, though they too were incredibly restless and none settled even a moment. 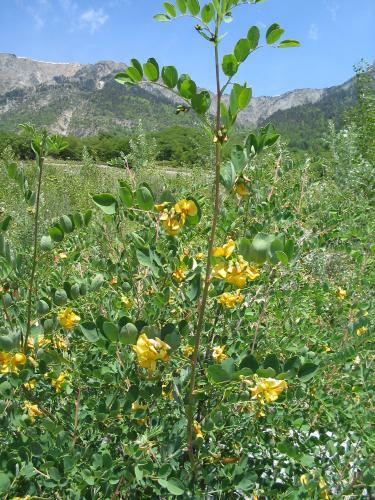 Honeysuckle is abundant in Bernwood and at least 5 admirals were visible at once around this patch of honeysuckle, forever flying, never resting. 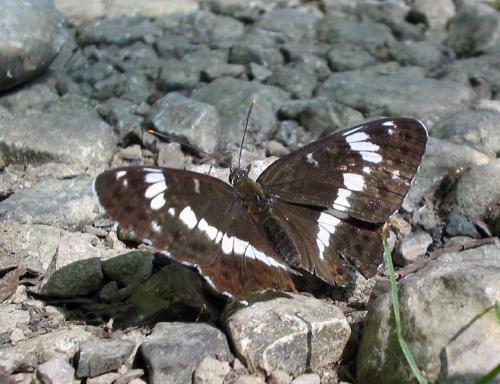 A great joy was a male purple emperor at about 11.30 am, crusing back and forth along a ride and flying around my feet at one point. He never settled EITHER! This freshly emerged hutchinsoni comma did play the game, so I got one nice picture out of the day. 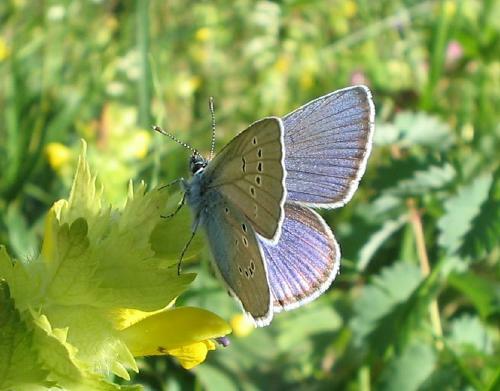 A single common blue was my only blue of the day. 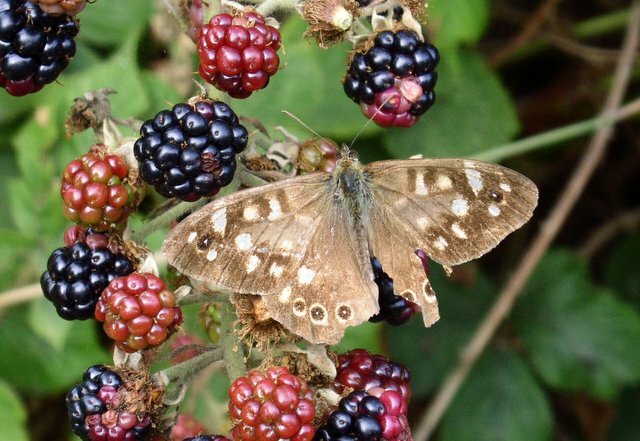 Otherwise, satyrids ruled - meadow browns, ringlets (by far the most abundant butterfly), marbled whites and speckled woods. 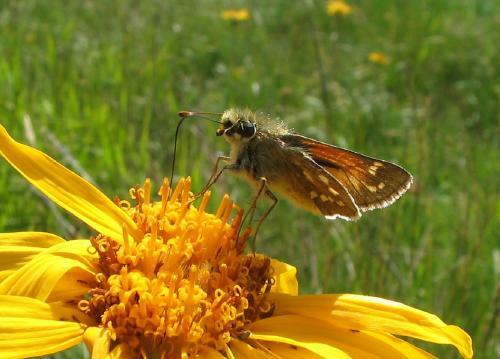 There were also many large skippers and a few large whites. 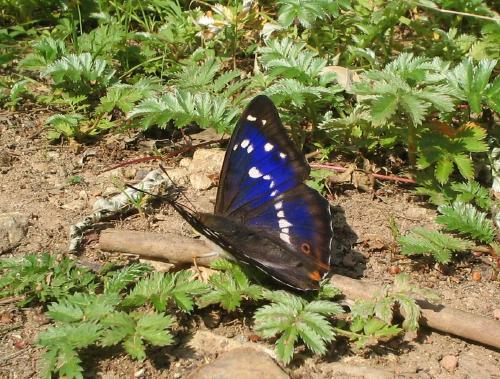 A single red admiral put in an appearance, and commas were numerous and conspicuous. In the late evening I and a friend watched glowworms within the boundaries of Oxford - something I had never expected to do! 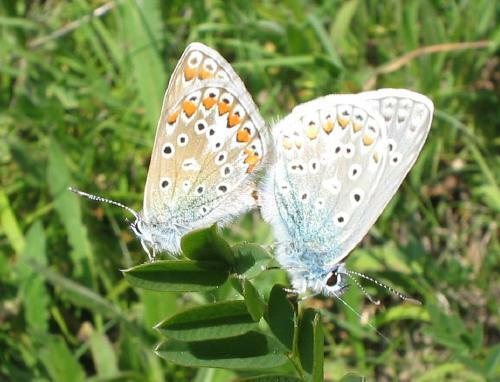 Here is a picture of a pair mating. 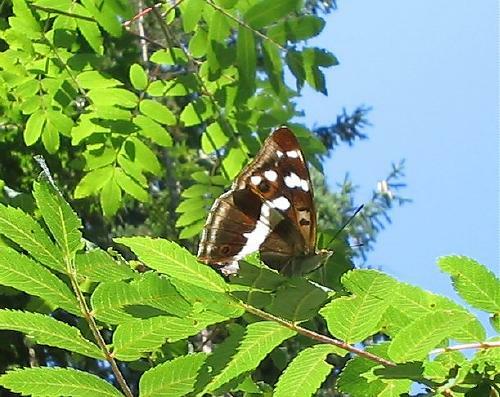 30th: The day started auspiciously with this purple emperor gliding up and down a woodland ride at about 9.45am. He was still there at 10.30am. 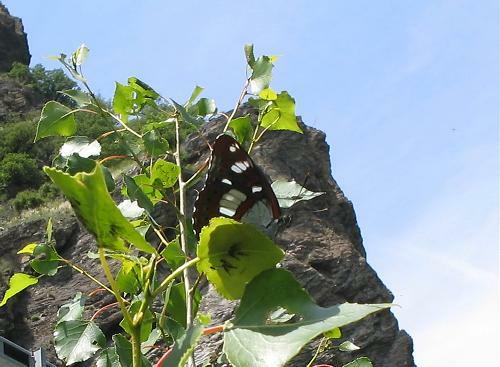 This white admiral doing an acrobatic trick was nice too. 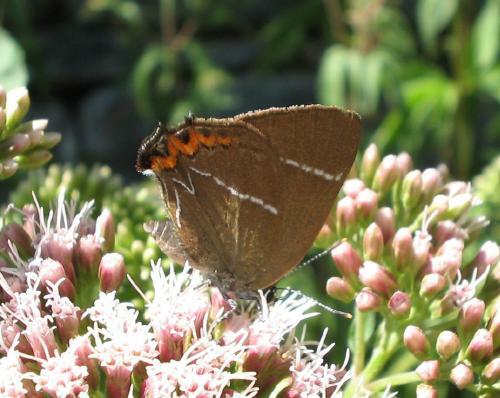 After many more hours searching this and different woods I eventually cajoled a black hairstreak or two into staying put long enough to be photographed. Here is another picture, of a rather more tatty one. My impression was that this was rather after the peak of the season - more were tatty than fresh. 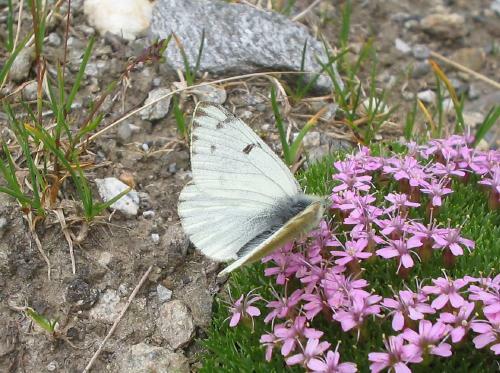 I also enjoyed watching wood whites. 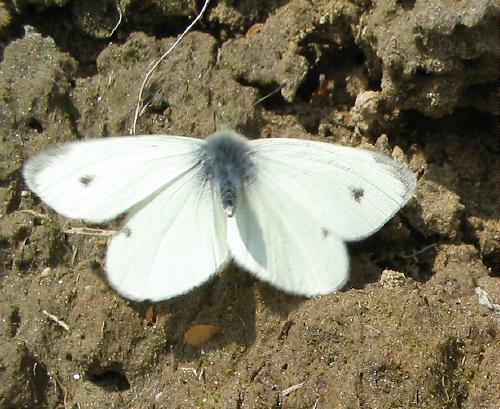 Both wood whites and black hairstreaks are scarce British butterflies - there are only about 30 colonies of the latter remaining in England, in a band from Oxford to the East Midlands. I was certainly privileged today. 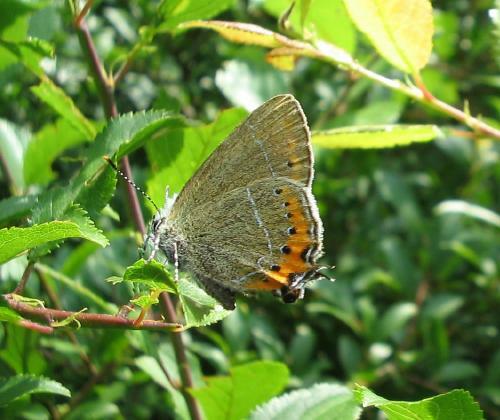 2nd: Hunted for my former white-letter hairstreak sites near Woodbridge, Suffolk. 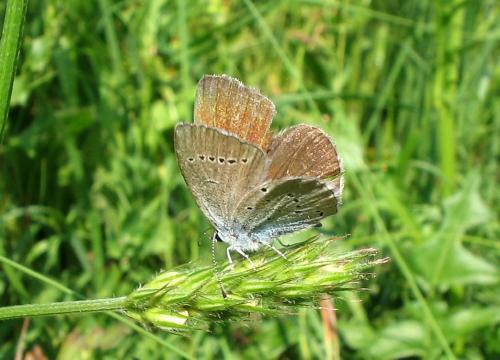 Although I didn't see any hairstreaks - it is still very early - the habitat was intact and in places improved. 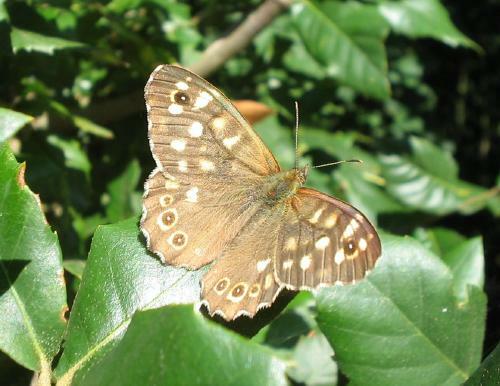 Meadow browns, ringlets, painted ladies, red admirals and speckled woods were the predominant butterflies. 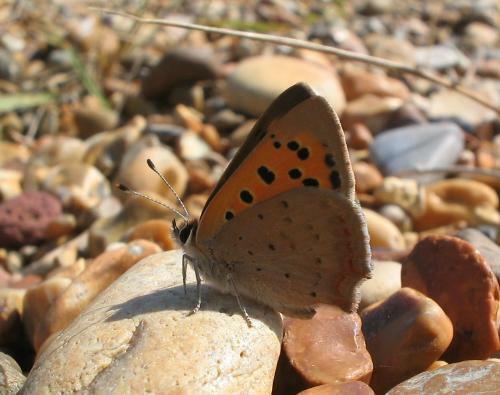 Had my first small copper of the year at Shingle Street on the coast. 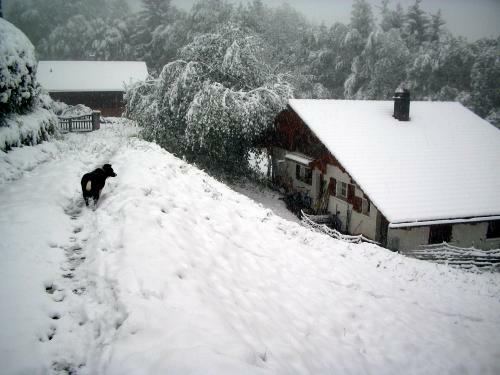 3rd: Began return journey to Switzerland with my parents, driving through France. 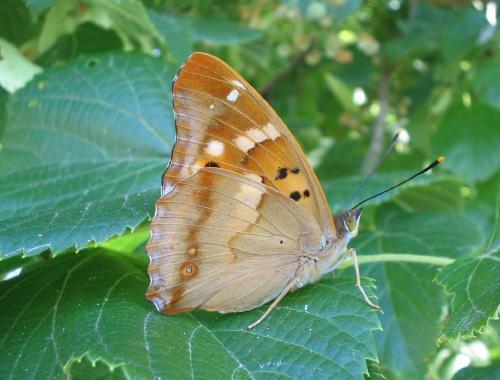 At a layby off a main road in France a lesser purple emperor was hanging around the lavatories, paying particular attention (unfortunately) to the ladies'. 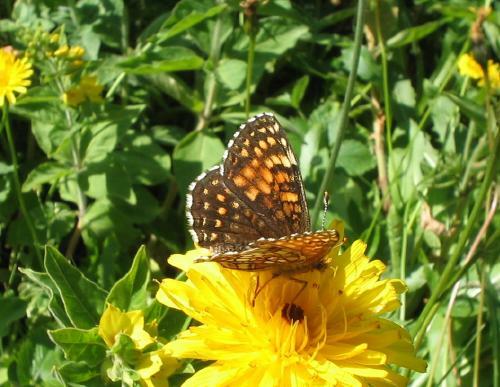 It was very difficult to get good upperside shots of this butterfly but here is one slightly out of focus and here is another I took without looking through the camera (the butterfly was perched above eye level) so I chopped off half of it! 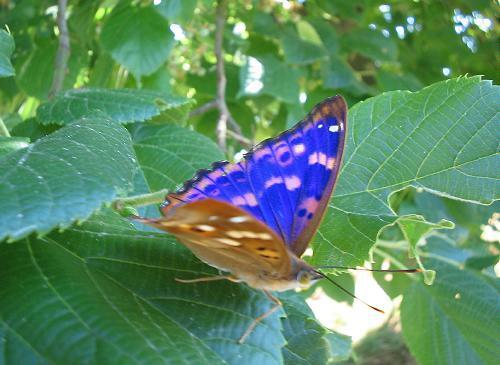 4th: In woodland near Troyes lesser purple emperors abounded. At one point there were many feeding together and they seemed very restless when I approached and I couldn't get a picture. I soon discovered the reason was that they loved the smell of sweat on me. 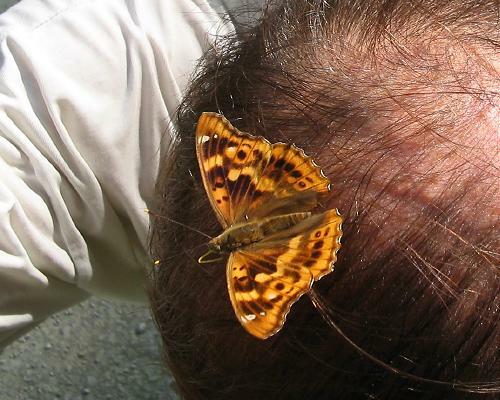 Here is one that landed on my bald patch! This really was a matter of luck - I held the camera above my head and clicked on the shutter. 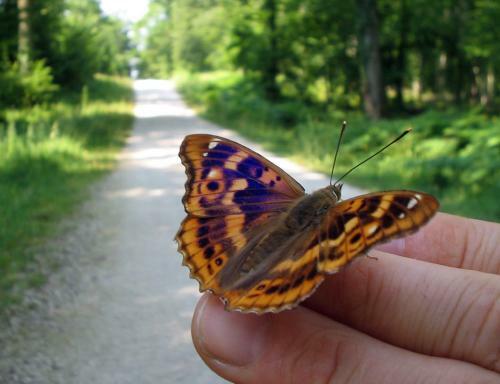 I soon worked out that I could place my hand over my head, attract the lesser purple emperors to my hand and photograph them on that. Here and here are a couple of pictures. 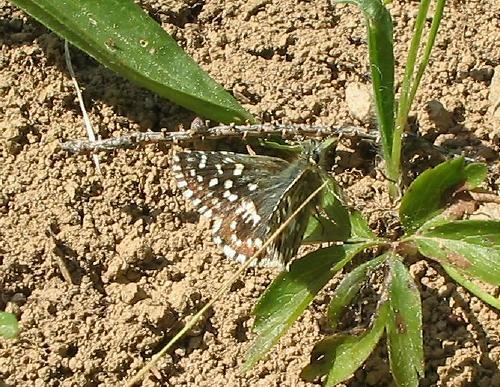 Lesser purple emperors seemed to be the butterfly of the trip - they popped up everywhere we stopped. 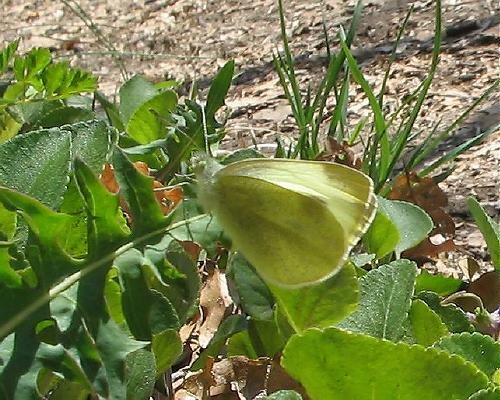 But white admirals were also common and at one place I found many brimstone. 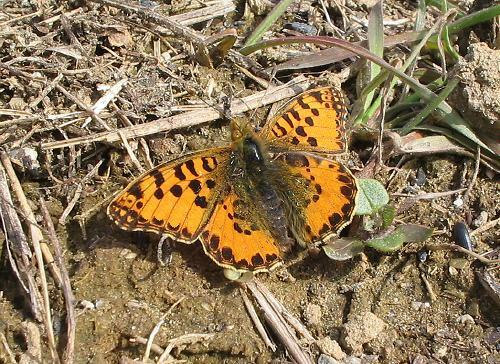 Other butterflies common in central France as we passed through were peacock, red admiral, meadow fritillary, marbled fritillary and (less so) large tortoiseshell. 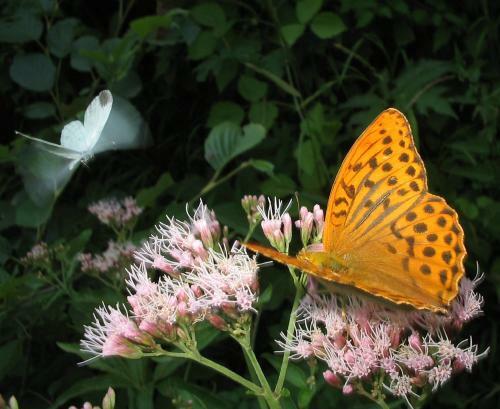 My first silver-washed fritillaries of the year were flying in one wood. 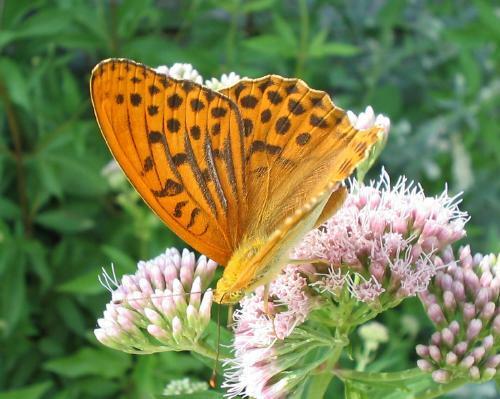 5th: Silver-washed fritillaries and small skippers flying in my garden in the morning, as well as a Fabriciana fritillary which didn't stop. 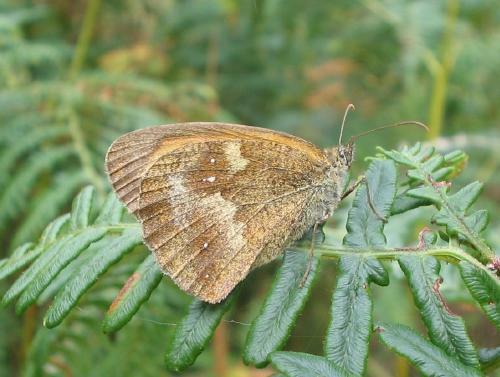 In the early afternoon a walk in local woods produced a mass of Arran browns, as well as a single woodland brown. 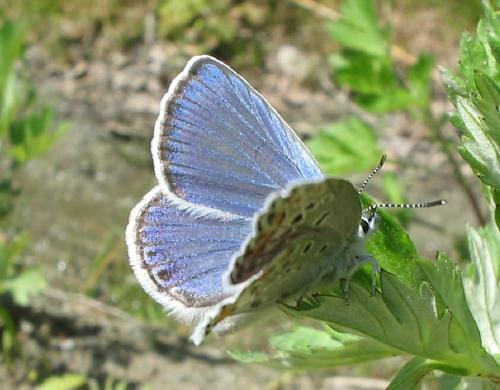 This last was very welcome because I used to see this species some years ago in these woods and had not for a few years now. 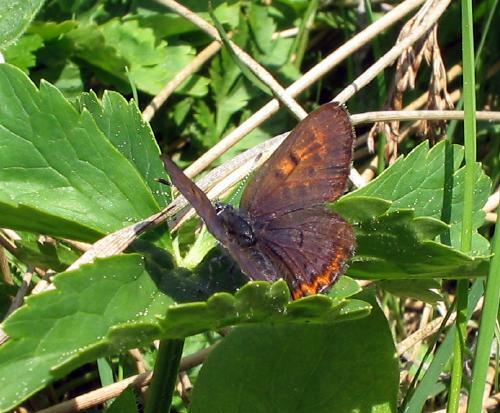 The woodland brown never descended from high bushes and a storm set in soon after I found it, but for the record, here is a long-shot. 8th: Mixed cloudy and sunny day. 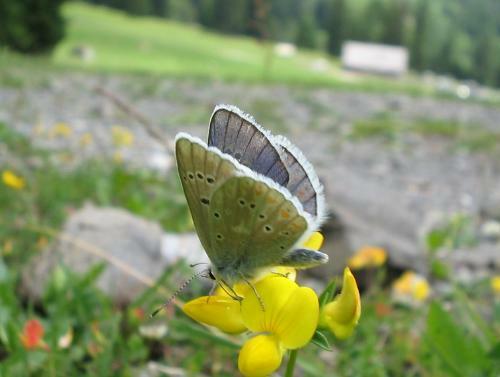 In mountains near Villars my first chalkhill blues of the year were flying and I had brief views of mountain clouded yellow and shepherd's fritillary between clouds. 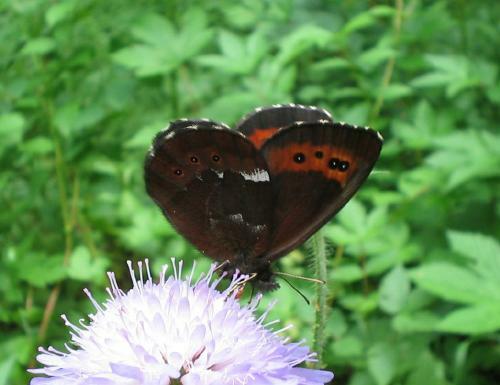 Bright-eyed ringlets were common and also some woodland ringlets - these seemed to be the only ringlets around. 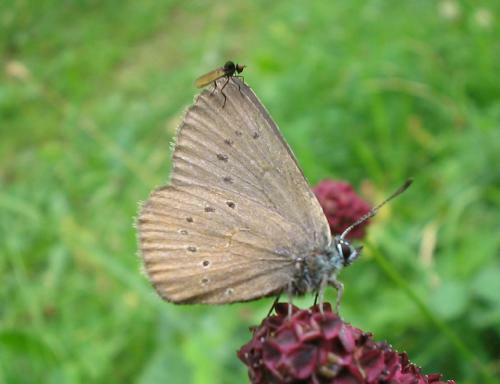 I might have seen manto ringlet but I couldn't be sure before it flew off. 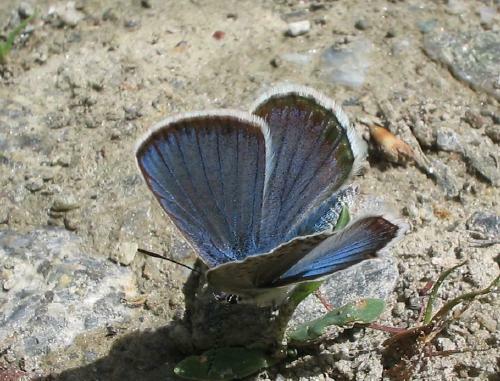 Here is a pair of mazarine blues mating. 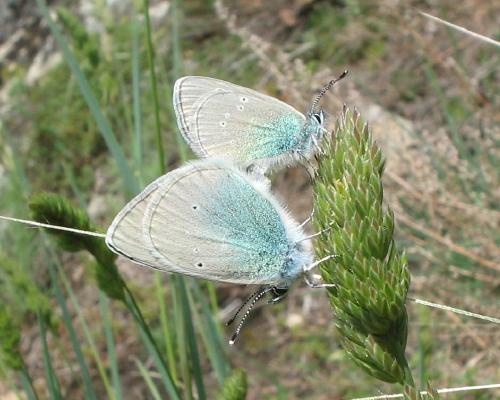 Alpine heath common and silver-studded blue fresh and also common. 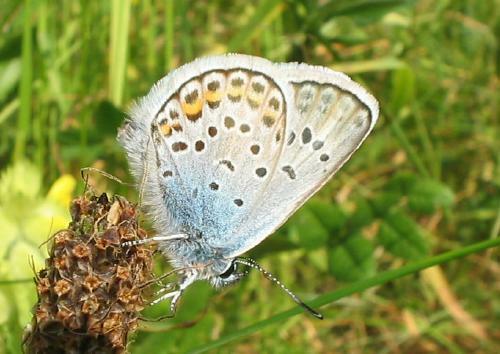 A single, rather tatty, female large blue was nice to watch and on the way down I found Titania's fritillary very common. 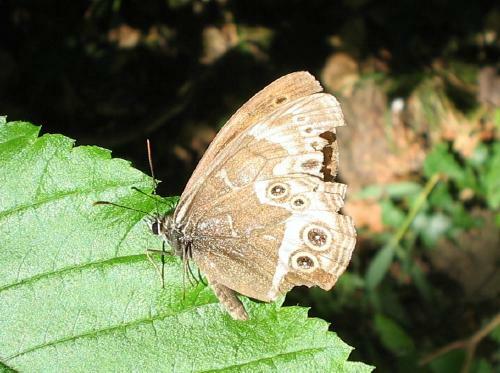 Because of the weather, many were sitting around so the undersides could easily be photographed (and here). 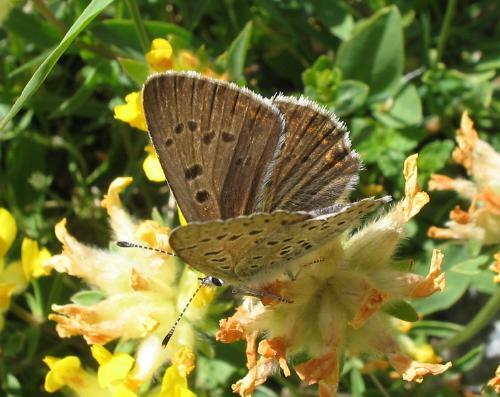 Up in the mountains it still seemed early for most things, with none of the usual Erebia on the wing, like dewy ringlet or blind ringlet, but the weather made it difficult to draw firm conclusions. 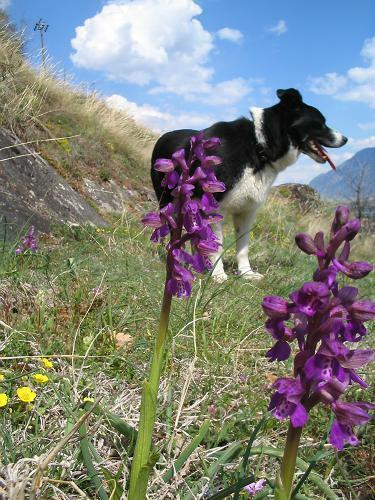 10th: A walk in the mountains near La Barboleuse. 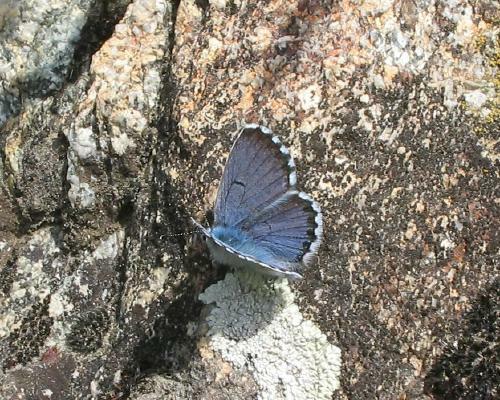 Mountain alcon blue was abundant at the same place as last year. 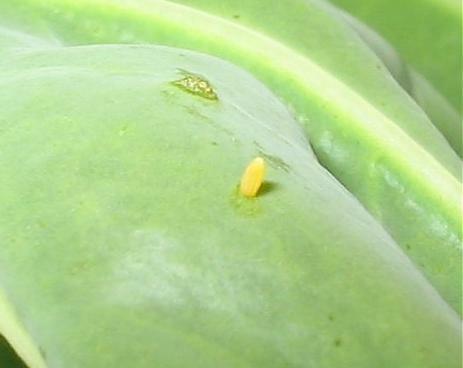 Here is a female sitting on the foodplant, with eggs clearly visible on the plant. 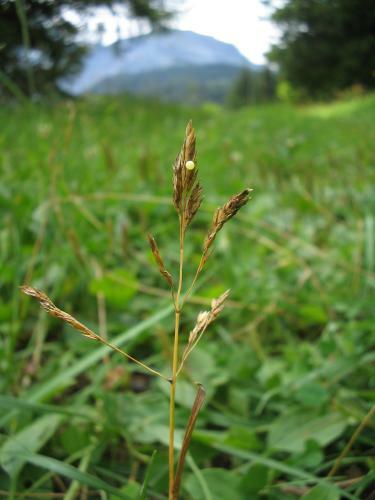 In fact, most of the visible foodplants had good numbers of eggs on - here is an example. 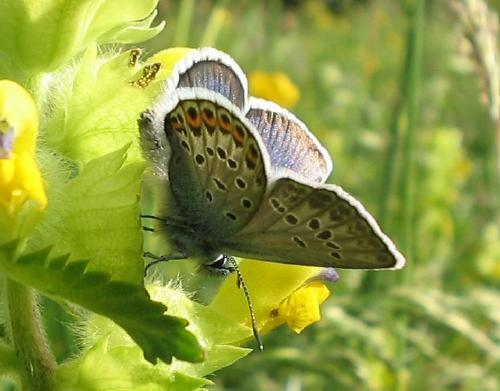 Eros blues were abundant too. 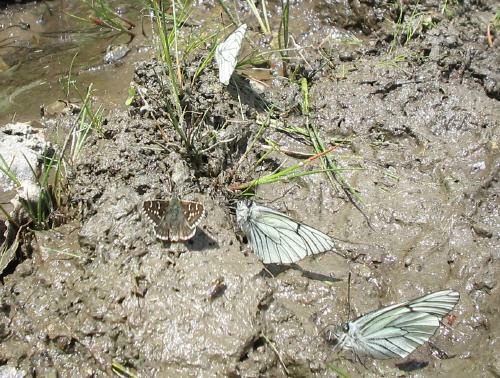 Here is a picture with at least 5 adult males on vegetation. 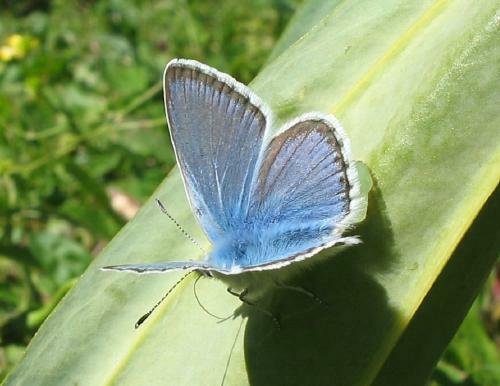 A single turquoise blue - brilliant and freshly emerged - was a pleasure to watch, though I couldn't get a picture. 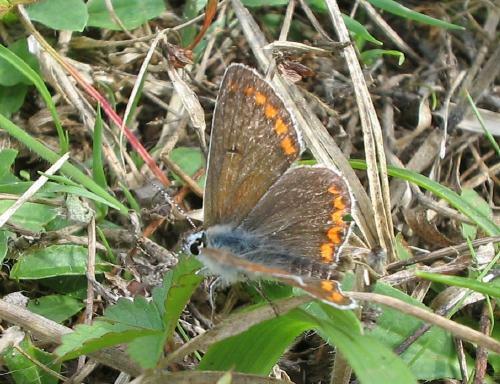 A single damon blue was more amenable - here he is with a northern brown argus. 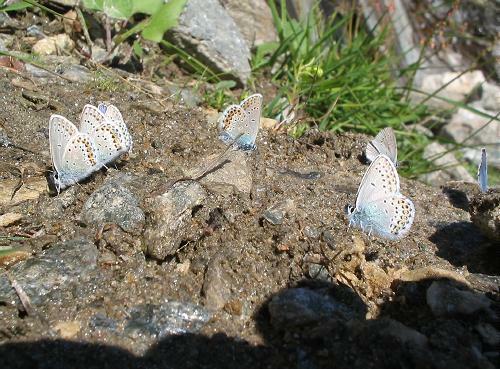 Silver-studded blues were abundant but rather worn. 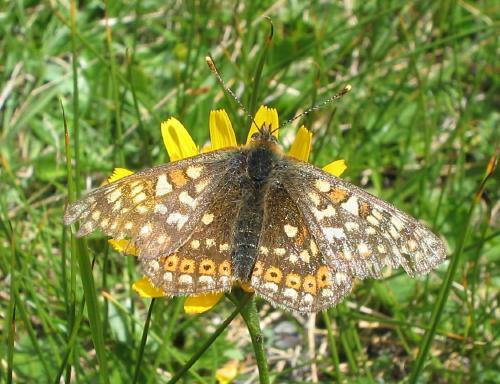 My first dark green fritillaries of the year were flying, and also my first lesser mountain ringlet. 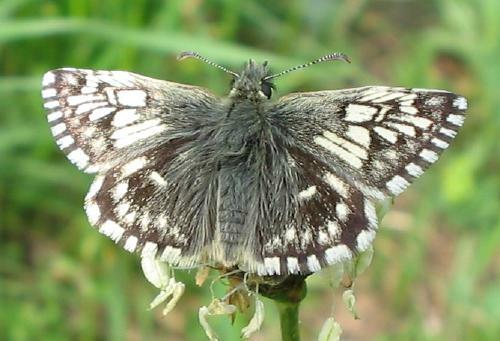 Orange tips were still on the wing. 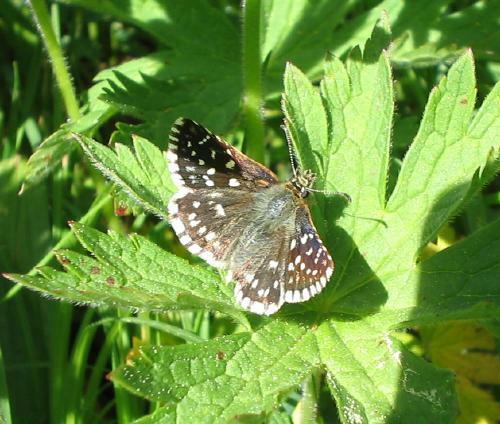 Plenty of dingy skippers, meadow fritillaries, lesser marbled fritillaries, a few marbled fritillaries, Titania's fritillary, common blues, mazarine blues, a single large blue, a few little blues, false heath fritillaries, various whites, painted ladies, a red admiral, large wall brown - in short, butterflies were abounding today!! 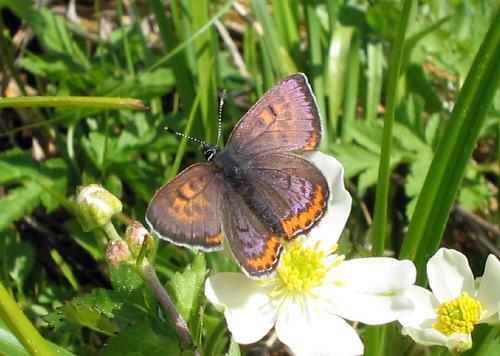 Oh, and a single alpine argus, a male, that I couldn't get a picture of either because he flew off over the meadows... 11th: Walk up to a local high spot. 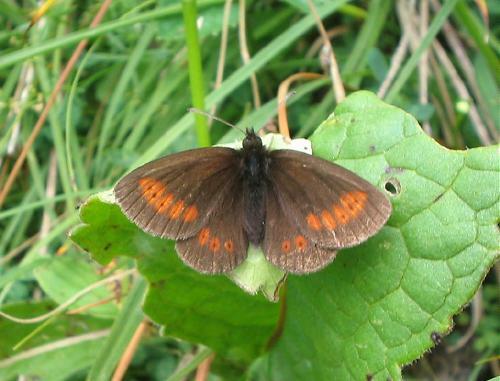 Couldn't spend that much time butterflying, because with company, but found my first blind ringlets of the year, as well as my first definite carline skippers. 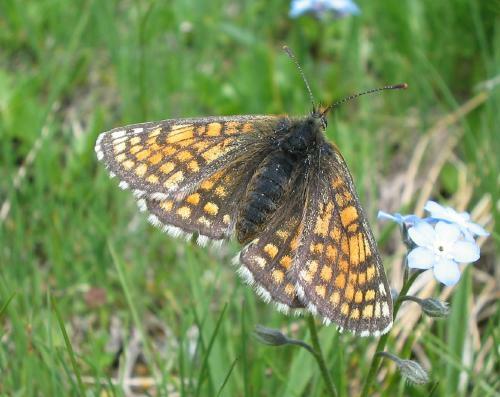 The form debilis of marsh fritillary was flying and there were plenty of swallowtails hilltopping. 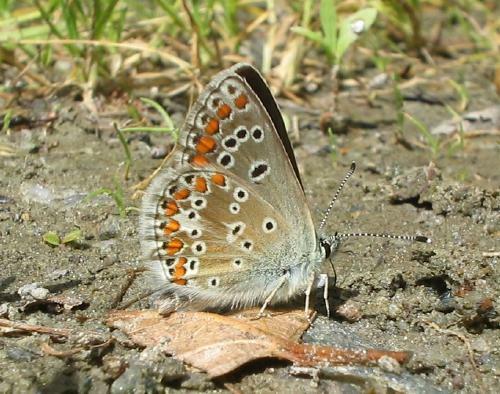 Eros blue present, and also alpine argus. 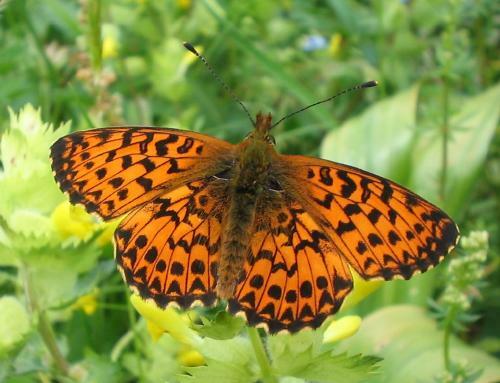 Lower down, dark green fritillaries now quite prominent, and Titania's fritillaries still around in good numbers. 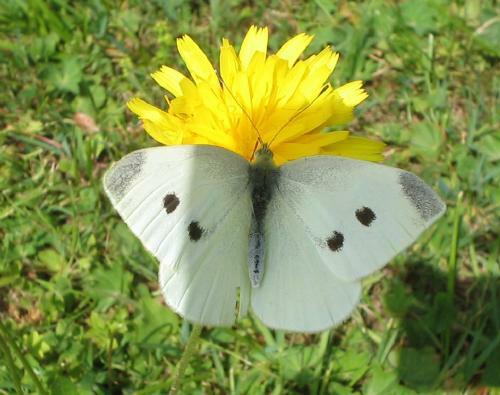 Black-veined whites and clouded yellows around. 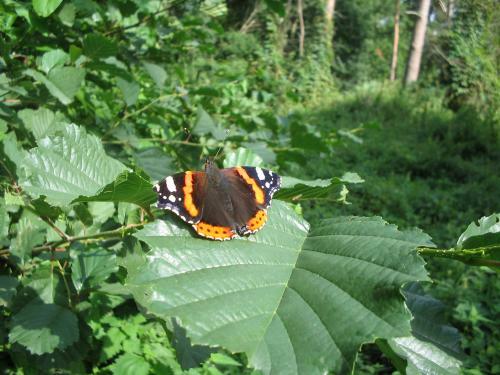 Red admirals having a good year, as are large whites still. 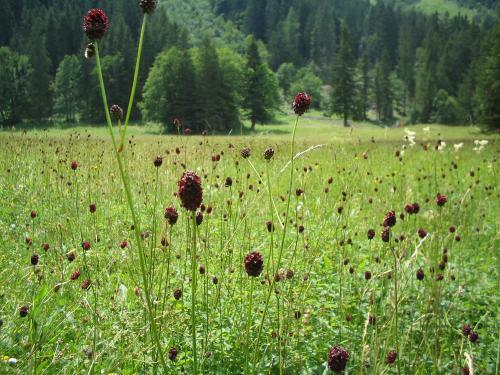 13th: Walk around Les Grangettes in afternoon, while a thunderstorm approached! 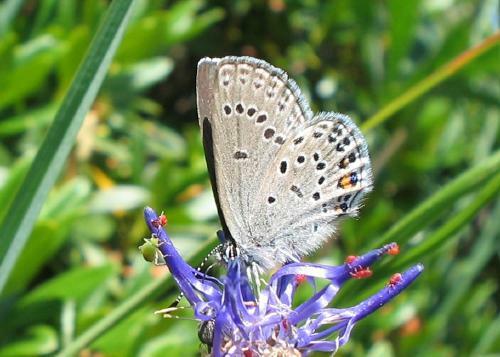 Saw quite a lot of Provençal short-tailed blues, all males and all looking very smart and fresh. 14th: Today was a good day for blues. 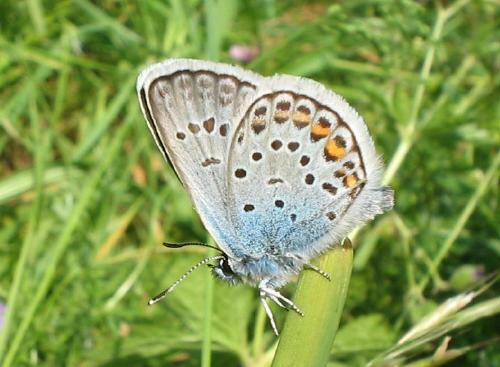 In quite a long walk, taking me up to two local high points, I saw little blues (quite common, especially higher up), common blues (a few), Chapman's blues (several, in vicinity of high, late-flowering sainfoin), osiris blues (at least three males, on their last legs, high up - females difficult at this stage of the season with little blues and mazarine blues around and everything rather tatty), glandon blues (my first for the season, quite numerous, including females, at a colony very high up. 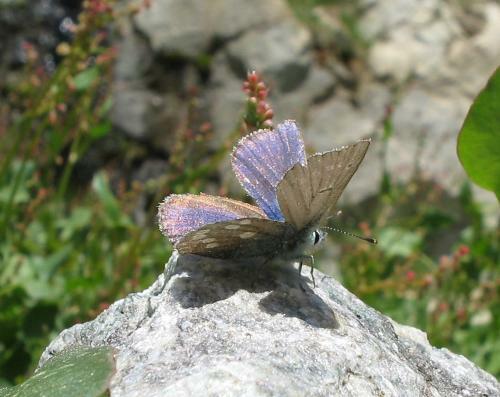 The males were extremely difficult to get close to because they buzzed off at every fly that passed and never seemed to relax), silver-studded blues (very common in a few places), idas blues (my first for the year and my first ever local ones, though I always feel a twinge of doubt with these altitude idas blues, having a prominent dark border. 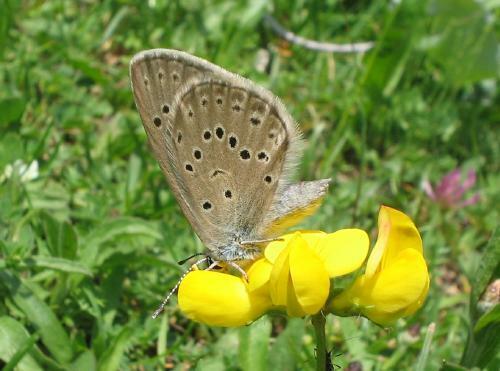 Here is an underside shot), mountain alcon blues (still common locally - where every single gentian plant is now covered in little white eggs! 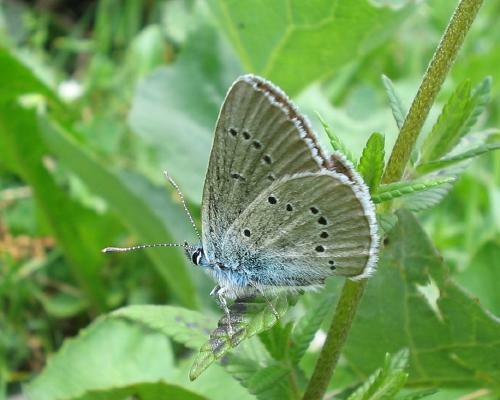 ), mazarine blue (common - some males tatty and large, so I took these pictures, here and here, thinking I was getting a male mountain alcon blue! 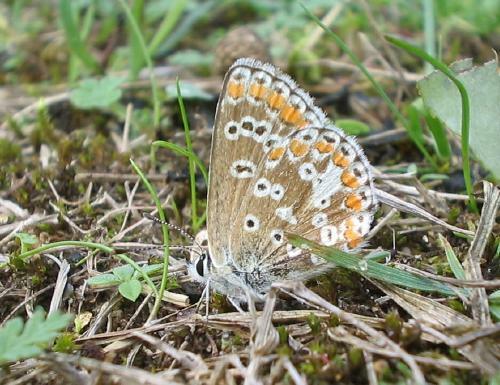 ), turquoise blue (now common in several places - here and here are more pictures, showing the underside), alpine argus (probably just one), northern brown argus (several, high) and brown argus (at about 1500m - so quite surprising). 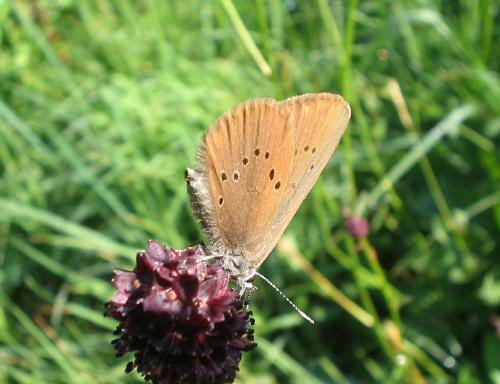 Other butterflies seen today were blind ringlets, water ringlet (just one or two, at middle altitude, but no photographs possible), dewy ringlet (several at altitude but none photographable. This insect has a frustrating habit of drifting around drippily and occasionally settling but never letting staying long enough for a picture. 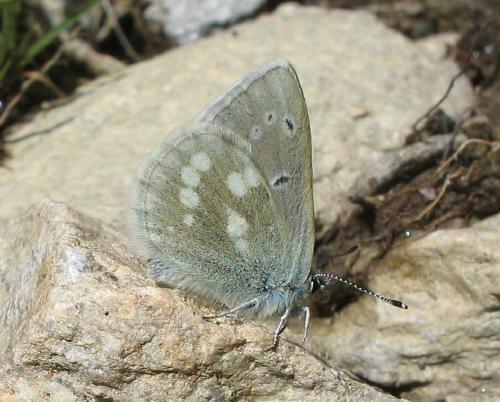 However, with its pathetic flight style and silver-grey hindwing it is easily identifiable even in flight, except in the Pyrenees where the false dewy ringlet flies). 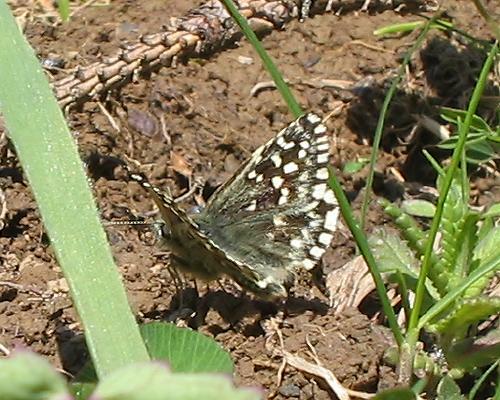 Red admirals, peacocks, small tortoiseshells and assorted whites were common all day. 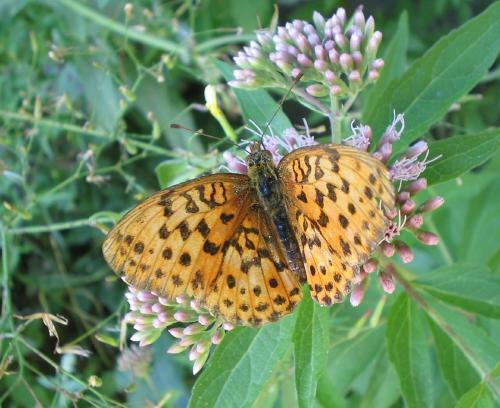 My first Niobe fritillary of the year was flying and dark green fritillaries were reasonably common in places. 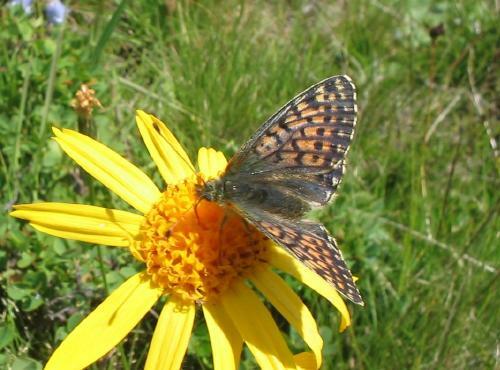 False heath fritillary now very common almost everywhere at altitude, but none above about 2000m. 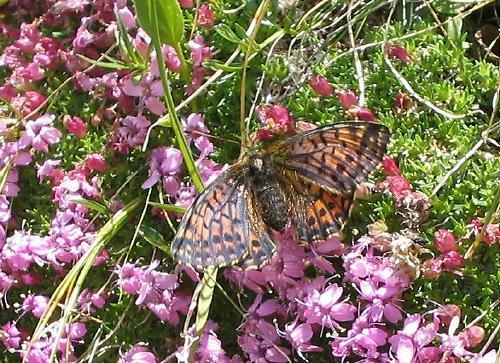 A small colony of mountain fritillary at the local highest point (well over 2000m - I'm not sure the exact figure), including at least one female, permitting identification. 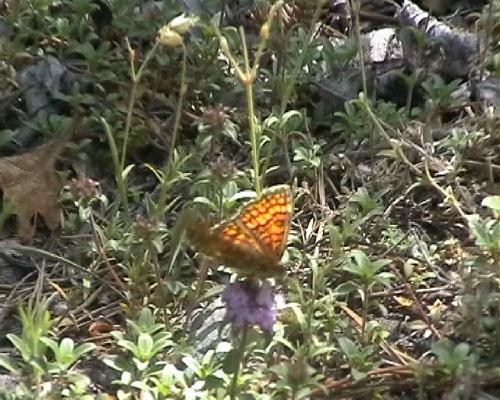 There may have been shepherd's fritillary there too - the males are difficult to identify. 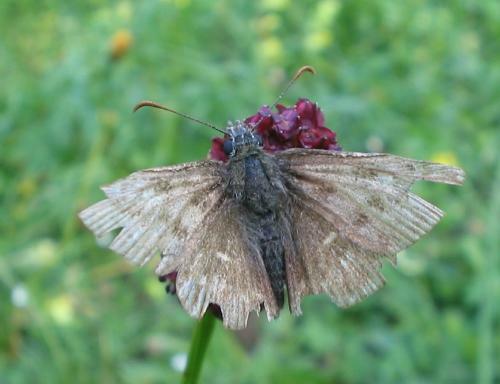 Here is a male carline skipper, and here a picture showing the underside. 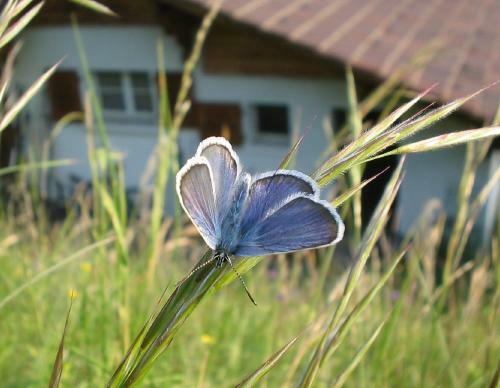 15th: A fantastic day in the Valais, with Matt Rowlings. 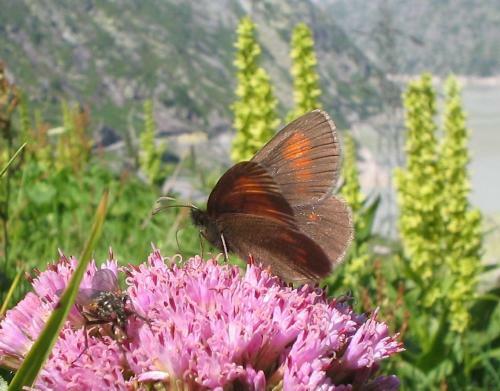 We visited three sites at different altitudes and saw, in roughly chronological order: silver-spotted skipper (my first of the year - two or three in total); large ringlet (amazingly common at all the higher places, even where there were no trees in the vicinity); idas blue (locally hyper-abundant); Swiss brassy ringlet (very common higher up); large grizzled skipper (a couple, relatively high up); mountain clouded yellow (very common higher up); mountain fritillary (the commonest I have ever seen it, at altitude, with many females visible to confirm identity); shepherd's fritillary (common at altitude, often looking very macular by comparison with the ones I see near me in Vaud); Grisons fritillary (abundant at altitude - here is a light female and here a dark one); lesser mountain ringlet (several); silky ringlet (my first ever, and present in small quantities at altitude. At one point where it was difficult to photograph there were two or three together - otherwise I just saw single specimens); mnestra ringlet (again, my first ever - these were commoner than silky and easier to get close to); marbled ringlet (just one); alpine argus (several, including one or two that posed very nicely for photographs); small apollo (yet again, my first ever, and a wonderful species. They were cruising up and down steep slopes as well as over scree. 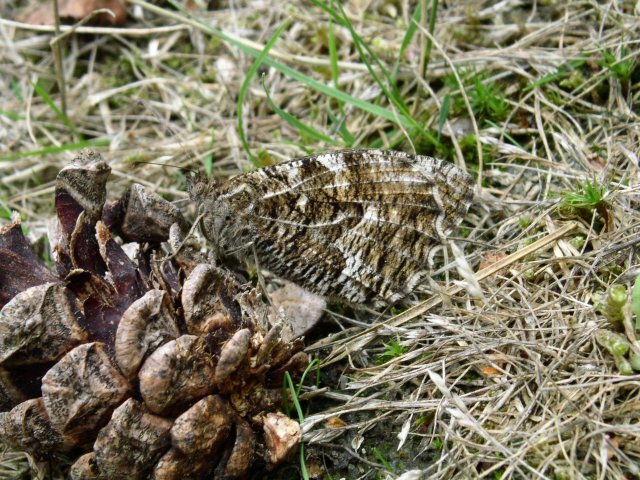 Here is a female); alpine grayling (only two or three - but I was able to get a couple of photographs, at least! 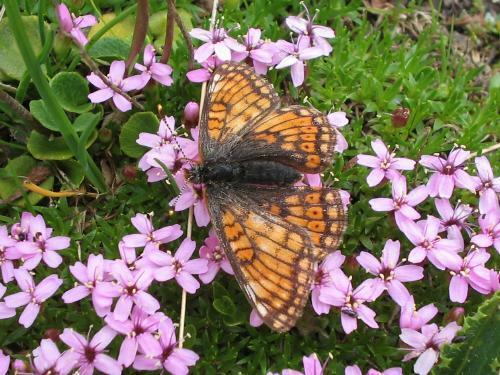 ); small mountain ringlet (quite a few, at altitude); scarce copper (relatively few, in several locations); purple-edged copper (including this dark female); marsh fritillary, form debilis (common in places, high up); apollo (a few at altitude, near the small apollos, and more lower down later); Cynthia's fritillary (these seemed to be near the end of their flight season - this female is also rather tatty! 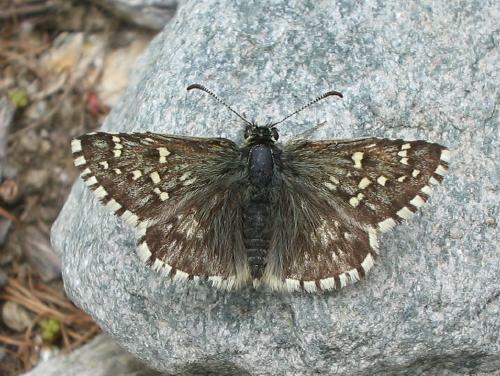 But it was wonderful to see them up in the high grassy gullies, the males in particular looking very distinguished despite being so tired); glandon blue (locally common); silvery argus (just one); Niobe fritillary (one or maybe two); peak white (locally a few - in precisely the same place as I photographed them last year); great sooty satyr (locally very common); dusky meadow brown (a few in hot lower sites - only males and probably fresh on the wing); white-letter hairstreak (two or three at one site, low down, in shade along a very hot path); Scotch argus (just one - the first of the year, at relatively low altitude); silver-washed fritillary (a few - including this one photographed accidentally with a flying wood white); wood white (several); purple-shot copper (several); marbled fritillary (common lower down); spotted fritillary (locally common in very hot places lower down); provençal short-tailed blue (very common at lower-altitude, hot sites); red-underwing skipper (just one); ilex hairstreak (a few); damon blue (just one, relatively low); turquoise blue (a few, lower down); scarce swallowtail (a few); adonis blue (a few, at low altitude); Chapman's blue (a few); Bath white (one or two); zephyr blue (one); Meleager's blue (just one, my first male ever); safflower skipper (just one); southern white admiral (two); holly blue (several, at low altitude, hugging shade); purple hairstreak (a single insect, or possibly two or three, apparently attached to a single, isolated oak tree at low altitude); small whites, green-veined whites and lots of large whites; painted ladies, small tortoiseshells and red admirals... I'm sure I've missed other things out too. 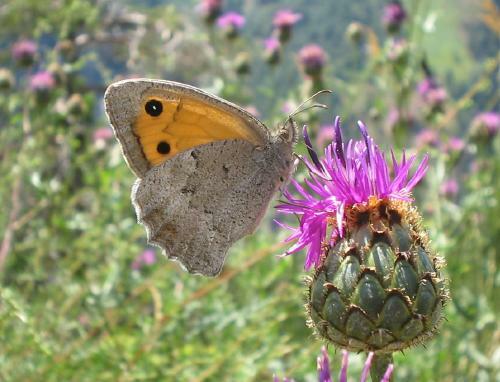 The Valais is a quite remarkable part of Europe for butterflies!! 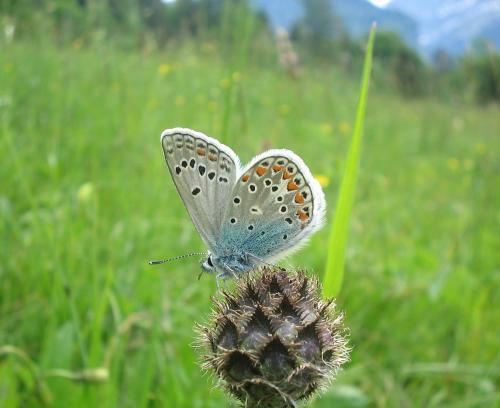 18th: Day trip on public transport to a site in the canton of Bern, to look for scarce large blue and dusky large blue, both of which I have been seeing there for some years now. 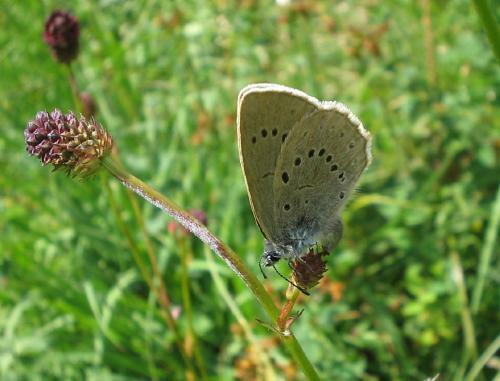 The scarce large blues were looking distinctly end-of-season, being almost all females and very much the worse for wear. Just this one looked reasonably fresh. Nevertheless, their numbers were good. 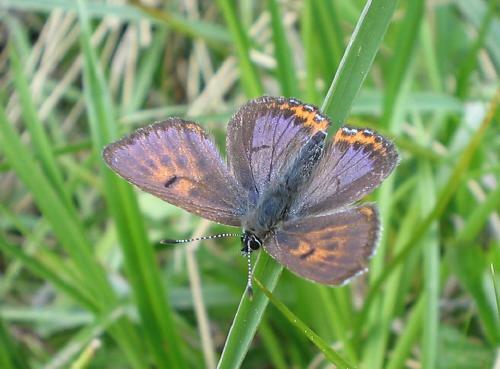 The dusky large blues were on the whole fresher and also in good numbers. 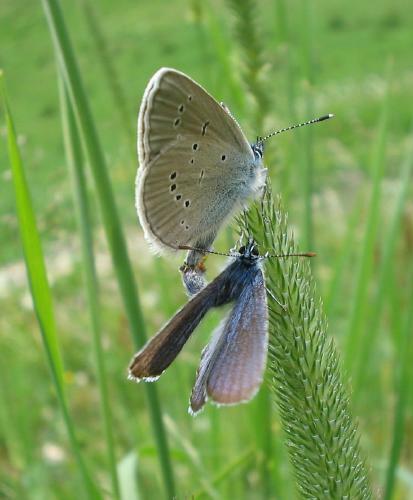 Here is another female scarce large blue laying eggs, and here a female dusky large blue doing the same thing. 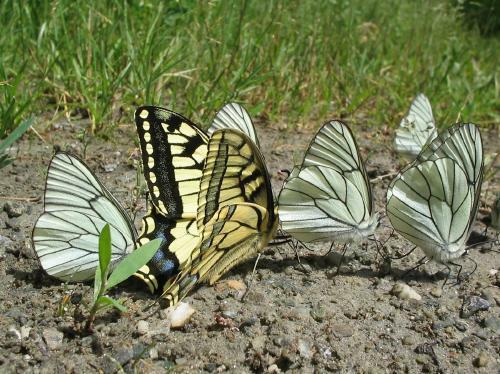 I had the feeling a lot of energy was being invested in the future in these colonies - a lot of egg-laying was going on! 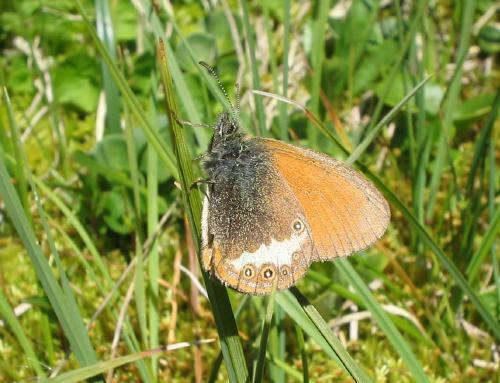 Other species present were manto ringlet, water ringlet, Scotch argus, Arran brown, blind ringlet and ringlet. 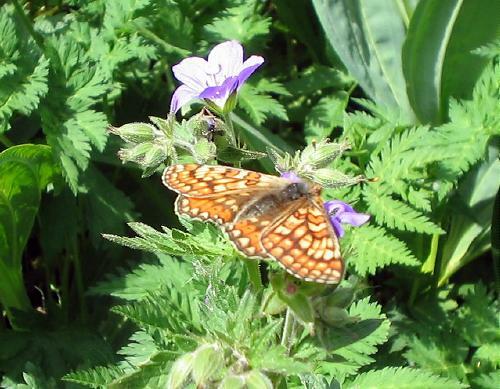 This geranium argus was eligible for a free bus pass and this melanic false heath fritillary had clearly seen better days too. 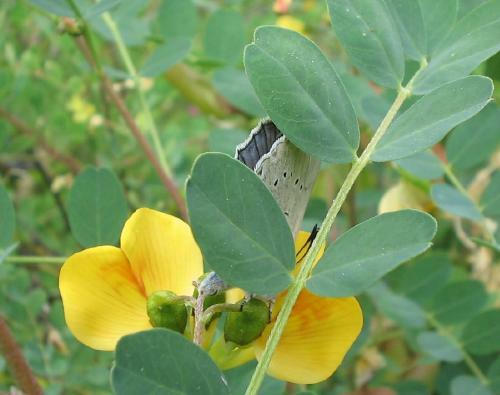 It would have been rather striking when freshly emerged. 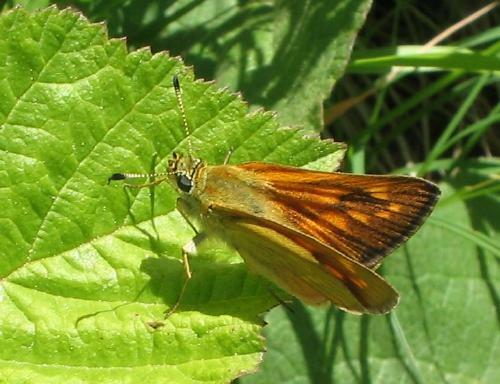 Can anyone guess what this Carcharodus skipper is? 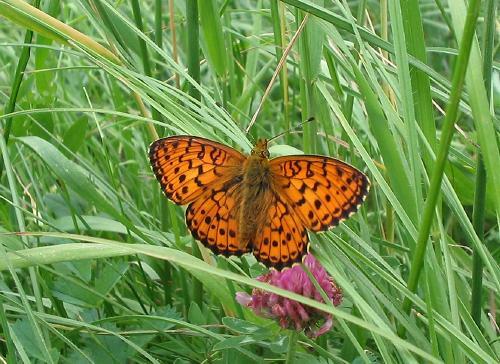 Lesser marbled fritillaries and Titania's fritillaries were abundant, as were large whites. 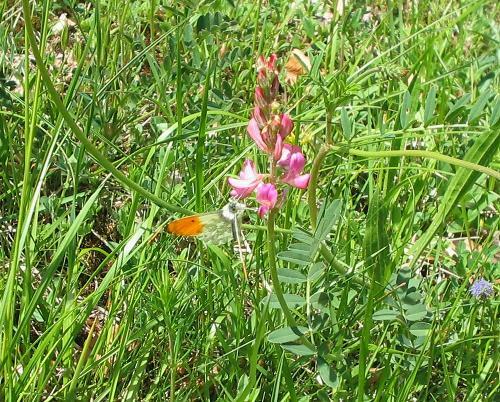 I saw several mountain green-veined whites, both males and females, and meadow browns, oranges skippers, large skippers, dingy skippers, purple-edged coppers, painted ladies, red admirals and more besides. 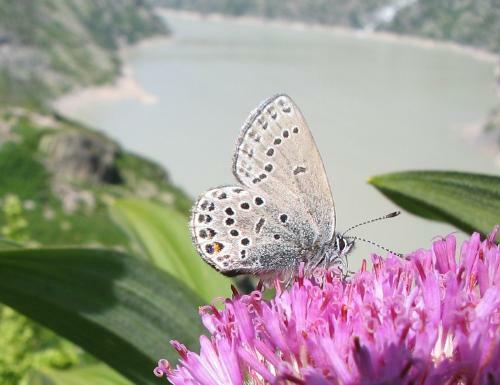 The mountains are alive with butterflies, even though the world-weary state of many of them is a sign that the peak is past. 20th: Went back to photograph the woodland browns of 17th, hoping they would be easier if I went a little earlier in the day. 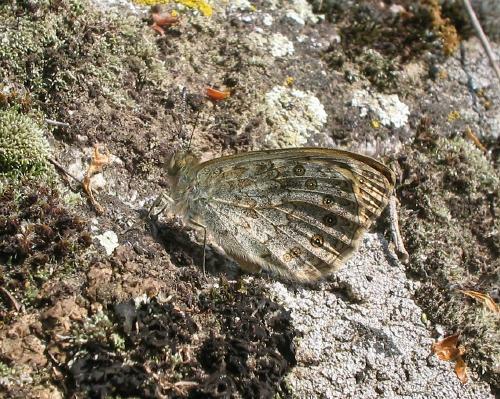 I did get some pictures, but of very worn insects. 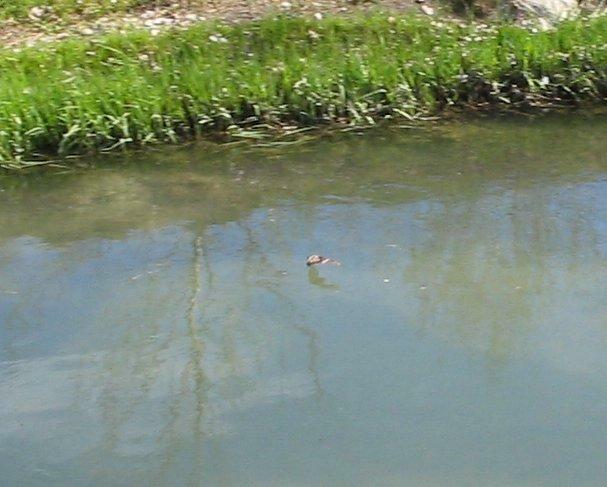 This one was barely clinging to its leaf and this one simply sat in the shade on mud, with no obvious will to live. 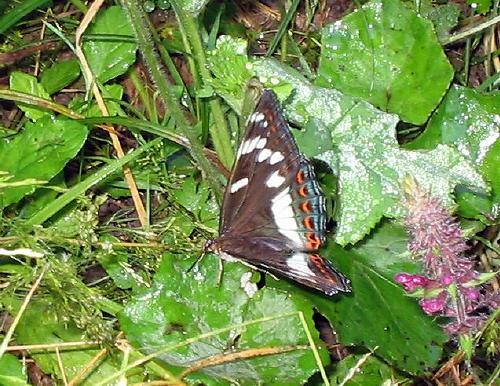 In contrast, this female poplar admiral, the first and only poplar admiral I have ever seen in my life, had a very definite will to live. 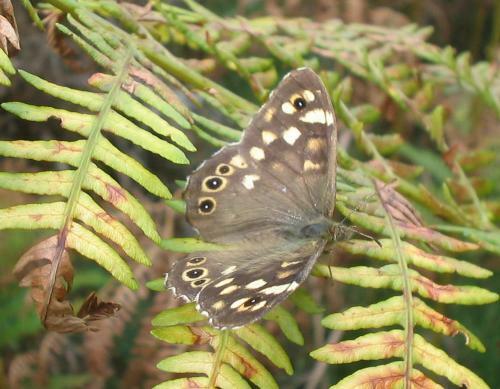 I spotted her among the herbiage and she gave me about 10 seconds to get this clumsy shot (from a distance - I have cropped considerably) then lifted like a kite into the air, paused briefly on a hazel bush, rose majestically, circled a couple of times (like an eagle - or am I getting too poetic? 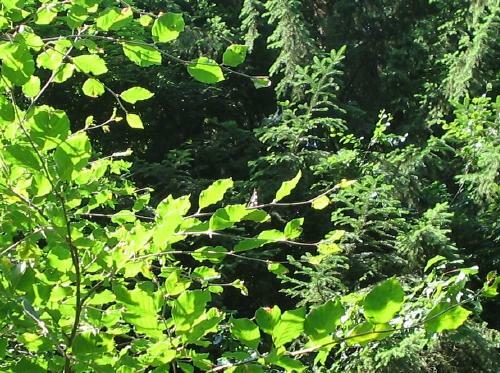 ), then cruised off into the canopy and away, leaving me breathless. Naturally I hoped to see her again but I didn't. 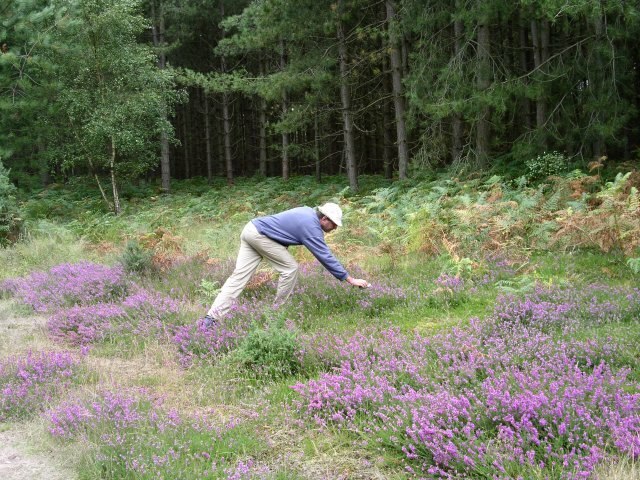 I searched for poplar trees in the vicinity but there were none either. I think I was extraordinarily lucky. 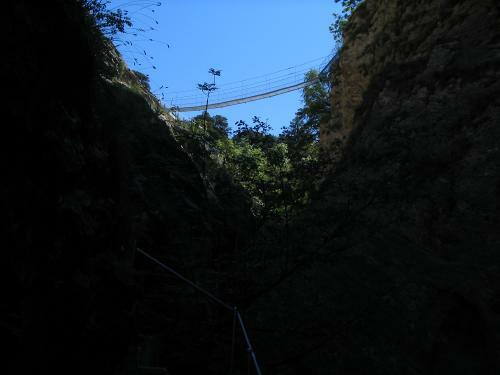 21st: Almost my last day of holiday, so I spent it in the Valais, at a couple of sites that I reached by public transport. I haven't sorted through all the pictures yet, and am up again at 5.00am for my last day of holiday tomorrow (!) but here is a brief report anyway. 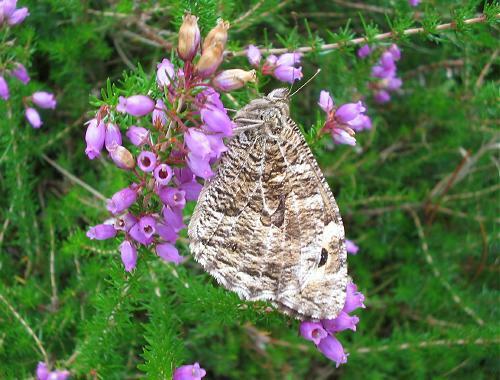 At the first, high, site, Darwin's heath were common. 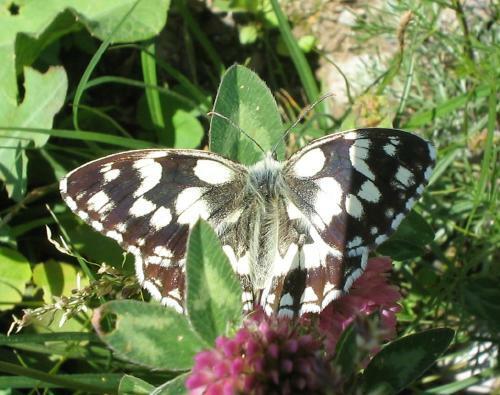 Here is one trying to find its place in Tolman. 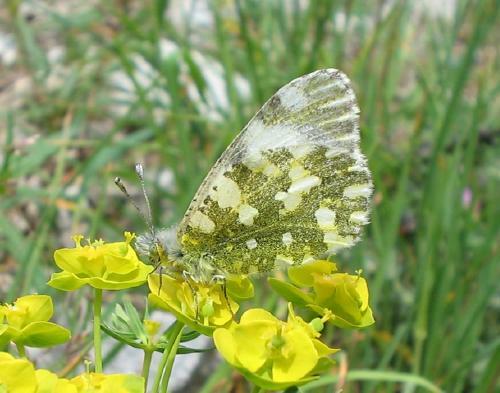 As the day hotted up, moorland clouded yellows became increasingly common, but only really started settling for photos as I was about to leave, at 12.30pm. 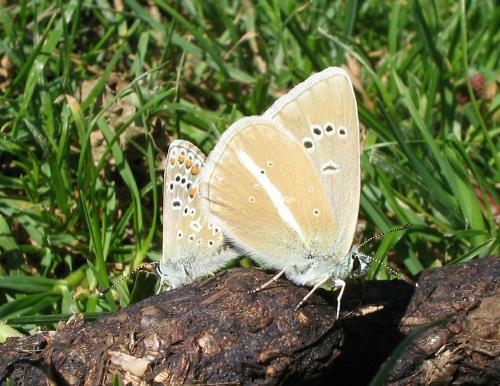 Here is a rather old male, and here a female, taken in unfortunate light. 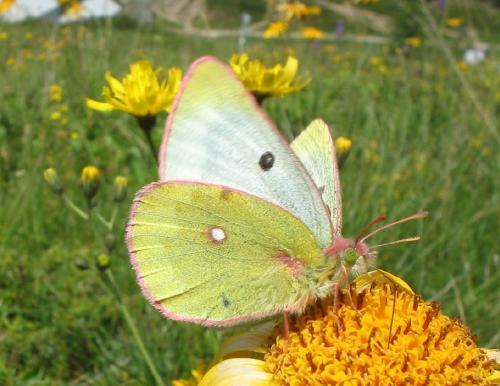 Never mind - they are lovely insects on the wing, quite clearly distinguishable from other Colias species by (in the male) the pale lemon yellow with unbroken borders. 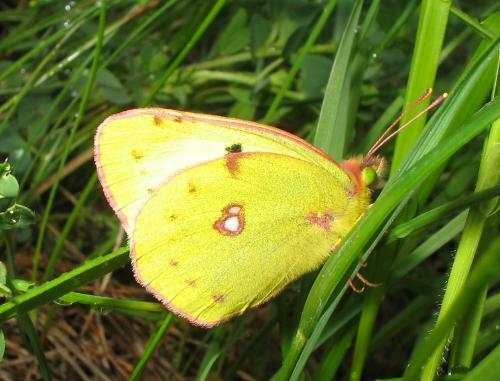 Mountain clouded yellows were also common. 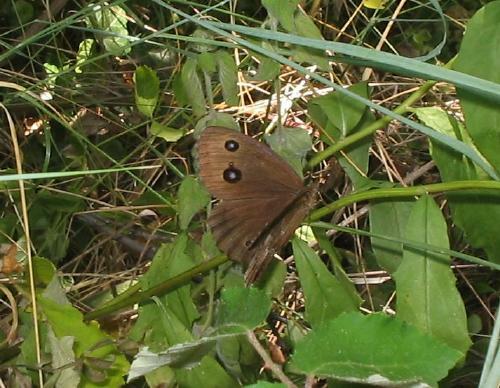 The Erebia species were predominantly large ringlet, with small mountain ringlet, lesser mountain ringlet and Swiss brassy ringlet also common. 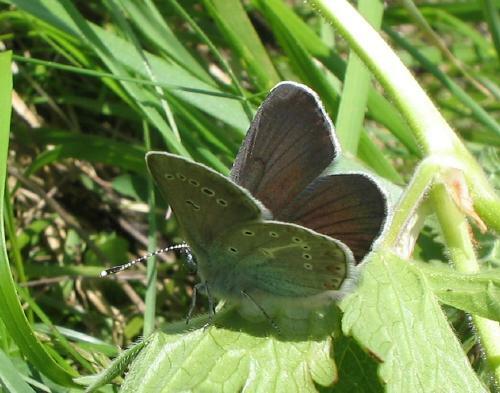 I saw a couple of cranberry blues, both males this time, though unfortunately the pictures are unpublishable! 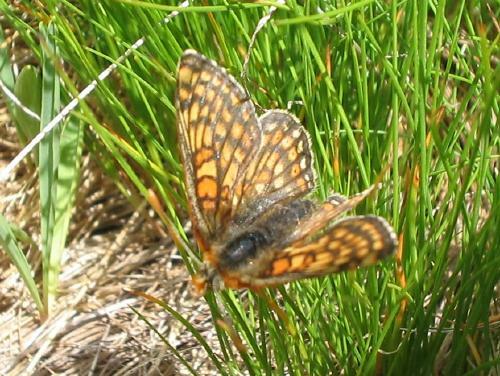 Mountain fritillaries were common (here is an underside of a female, showing how washed-out the colour scheme is as compared with a shepherd's fritillary), as were marsh fritillaries, ssp. debilis. 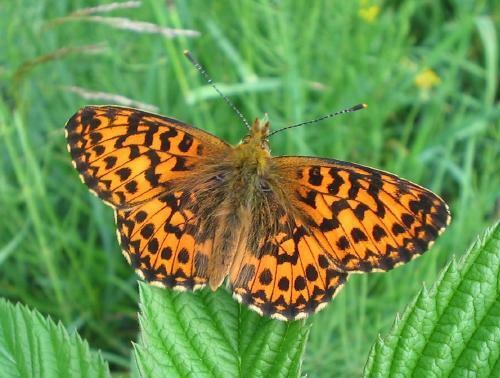 I photographed many fritillaries during the day but I still have to analyse a lot of the individuals as they were frequently extremely tatty. 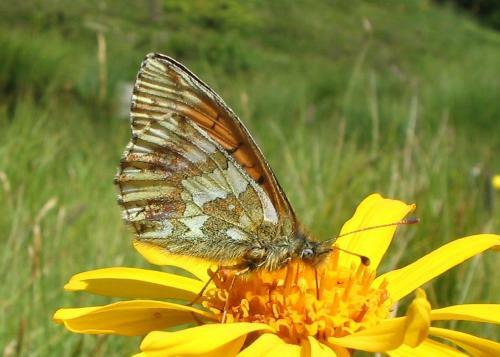 Grisons fritillary was common and a few Niobe and high brown fritillaries were present. 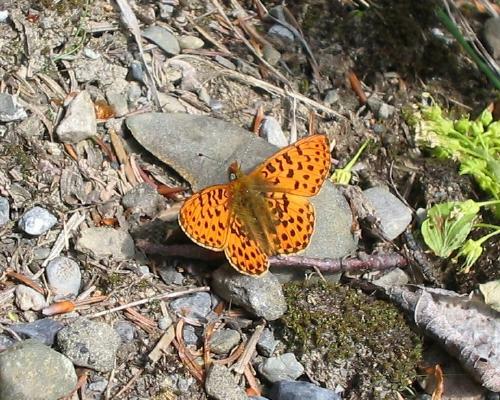 A single pearl-bordered fritillary. 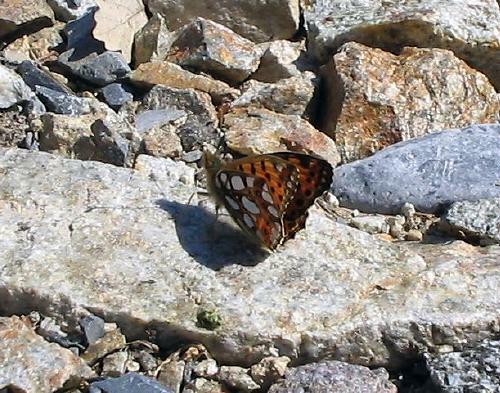 Painted ladies were flying through, as were Alpine graylings, though not a single one of this latter species stopped. 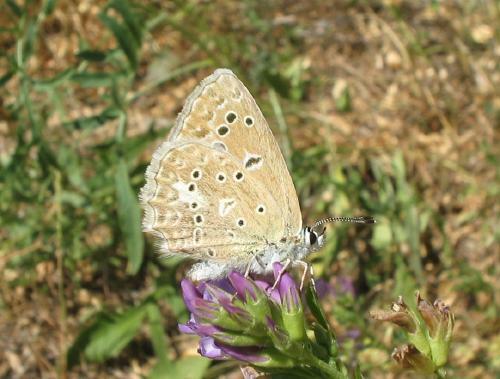 Idas blues were quite common, but all worn. 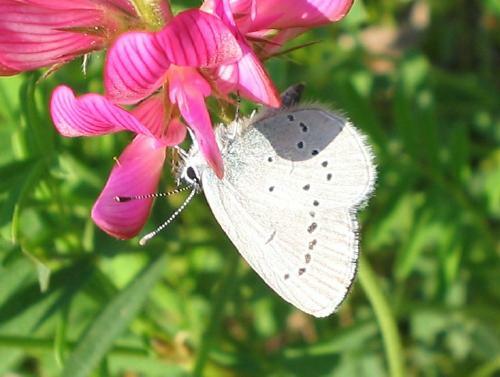 A single mazarine blue put in a cameo appearance. 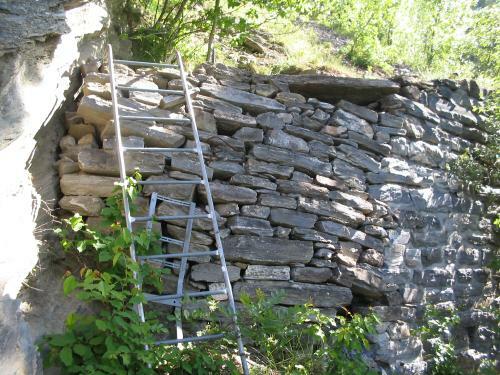 At the second site, somewhat lower down, I found rock graylings abundant and, after a while, very friendly. 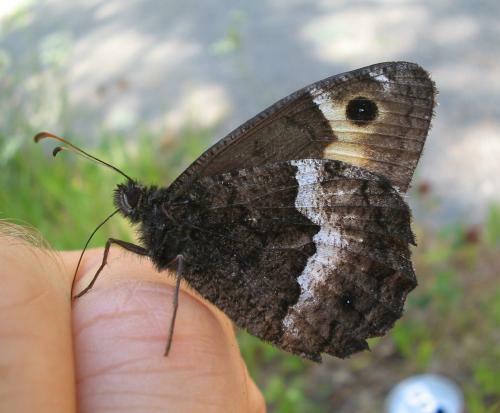 Here is one on my shorts, another tasting my lunchtime beer and finally a shot of Asha trying to discern the difference between rock grayling and woodland grayling. She reckons they have a slightly different smell - something the books fail to point out. 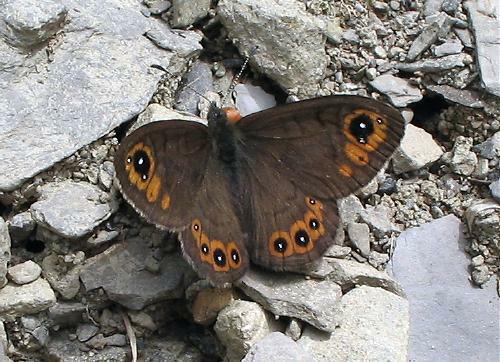 Dusky meadow browns were locally abundant. 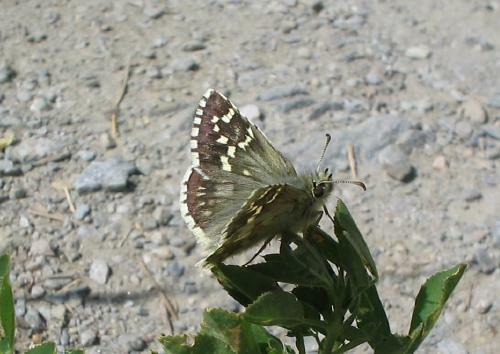 Here is a male. Escher's blues were present and there were lots of great sooty satyrs. 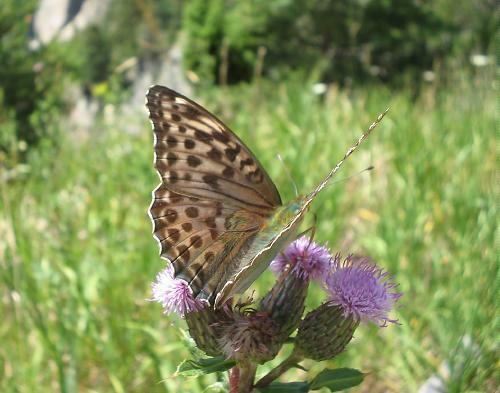 A beautiful silver-washed fritillary, form valezina flew past and settled briefly (here is the upperside) and there were plenty of knapweed fritillaries. 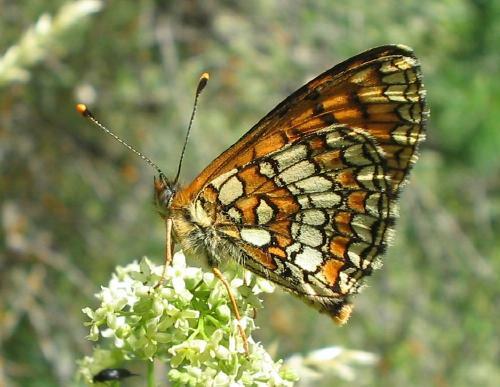 The various Mellicta fritillaries I photographed will have to wait for analysis. 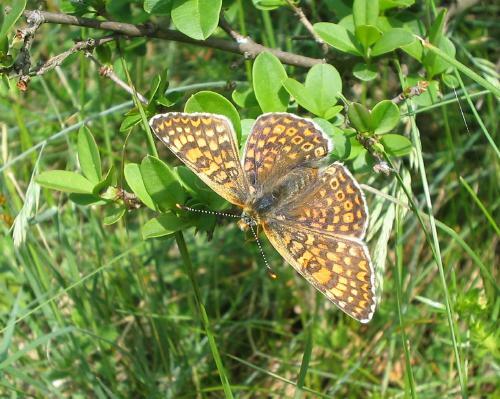 I saw several spotted fritillaries, males and females. All in all a very rewarding day, though extremely hot under a relentless sun. 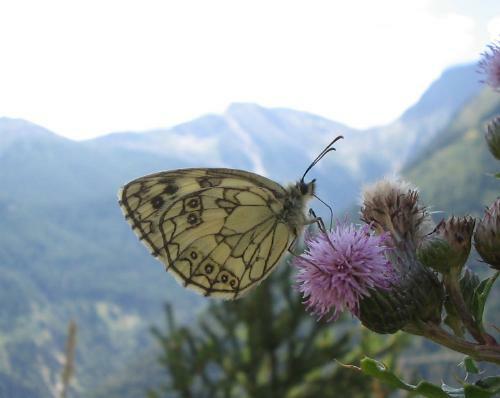 Here is a marbled white against a mountain backdrop and here a silver-spotted skipper (photographed at the first, higher, site). I will post more pictures shortly. 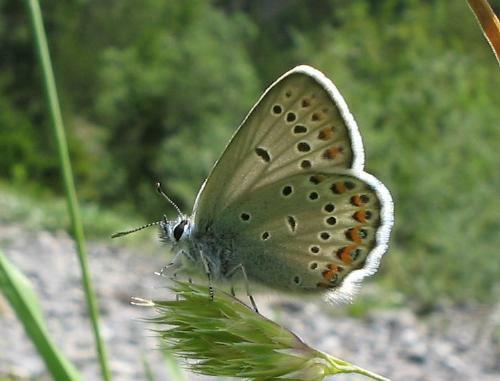 22nd: For my last real day of holiday (for the time being) I took a trip along the Rhône Valley to some of the higher mountain passes with Matt Rowlings, meeting up with some visiting English butterfly enthusiasts along the way. 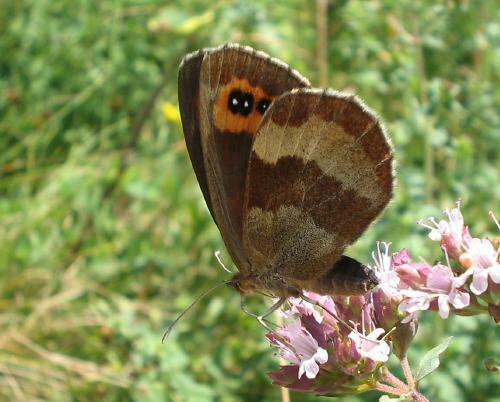 Our target species for the first site was eriphyle ringlet, which duly appeared and though not easy to photograph provided pictures for all. 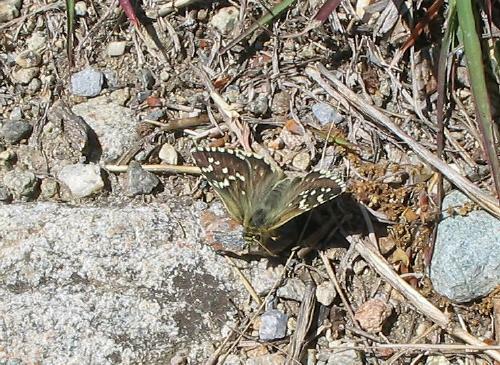 Most had two black spots (very small) on the forewing, like that in the previous picture. But a sizeable minority had none at all, like this one. 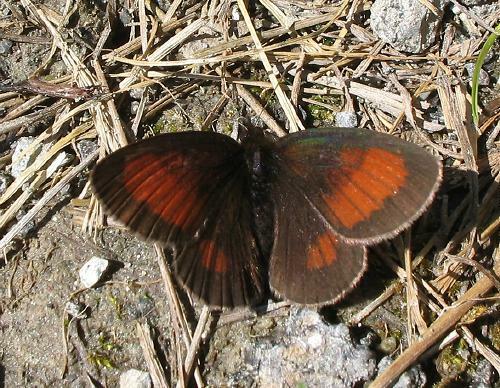 The upperside hindwing of all was particularly characteristic, often having just one orange spot, in space 4, as in this insect. 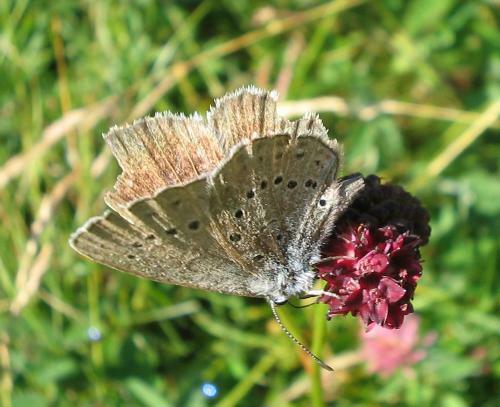 At the same spot were plenty of mountain clouded yellows, moorland clouded yellows and at least one small apollo (whose protective arm is hovering over the moorland clouded yellow in the previous picture), as well as purple-edged coppers and large ringlets. 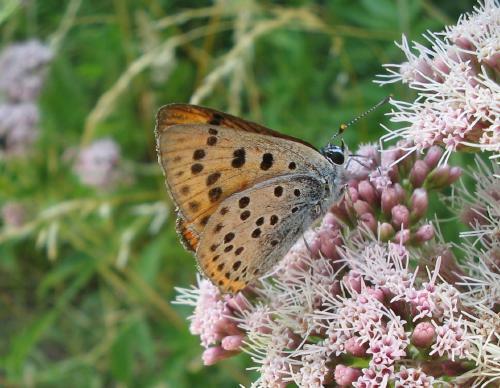 A few cranberry blues put in welcome appearances and idas blues were common there too. 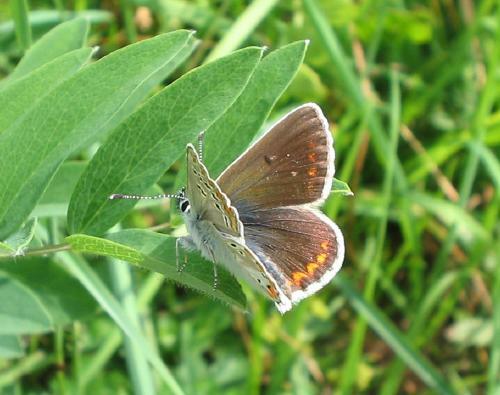 At our next site, in marshy ground near a river, though also quite high up, there were hundreds of Essex skippers massing in mud, together with a few chalkhill blues, idas blues, a turquoise blue, and some very amenable moorland clouded yellows. 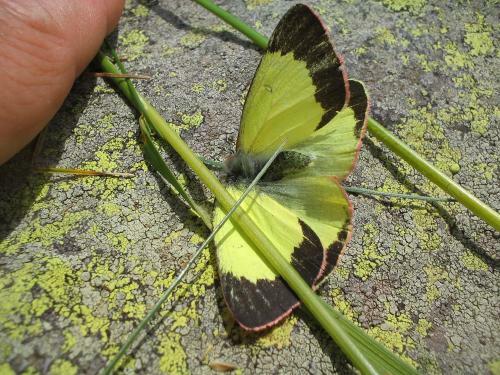 There was, sadly, one dead moorland clouded yellow, which I prised open and photographed just to show how lovely the upperside is, normally only visible in flight. 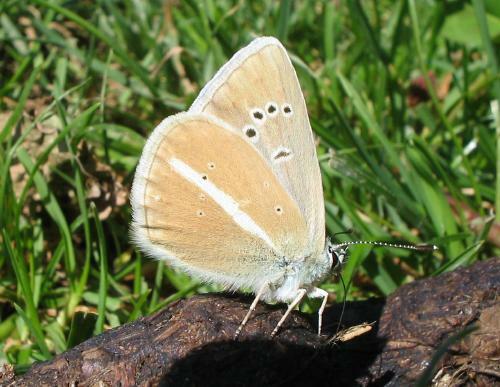 We confirmed the identity of a single almond-eyed ringlet - my first and so far only individual of this species this year - but I was unable to photograph it. 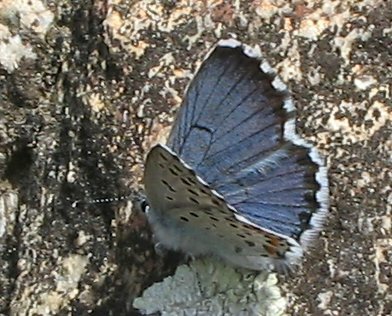 This male cranberry blue was very nice to see. 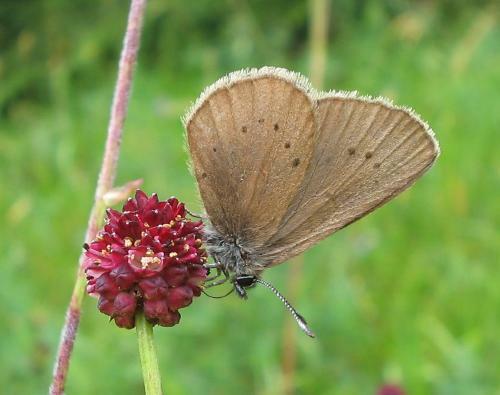 There was a male (probably) mountain form large blue, plenty of lesser mountain ringlets and large ringlets and again mountain clouded yellows, as well as black-veined whites, purple-edged coppers. 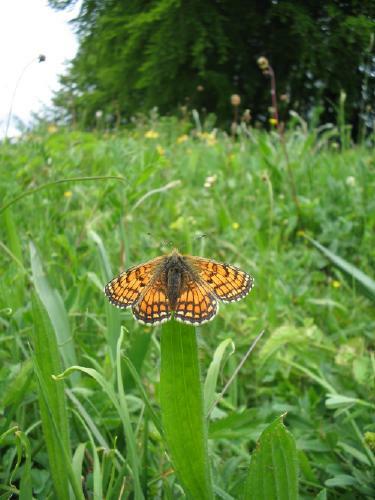 A single specimen of mountain marsh fritillary (debilis) reminded us we were very high up. By the time we reached our next site, at about 2400m, it looked rather cloudy and as though the game was over. However, there were many treats in store. 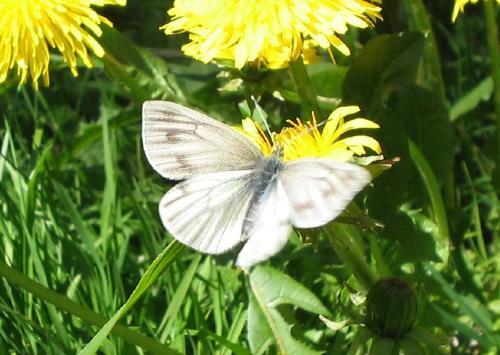 Here is a male peak white in quite good condition and here a dewy ringlet on less good form! 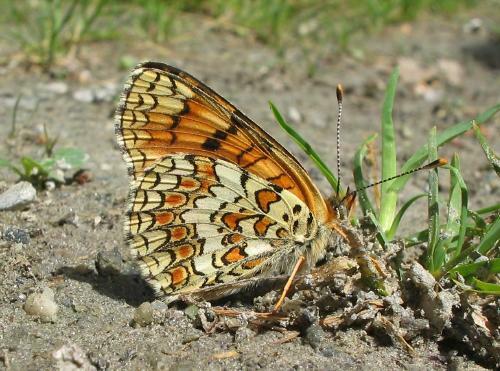 We had marvellous views of both male and female Cynthia's fritillary, including good underside shots. 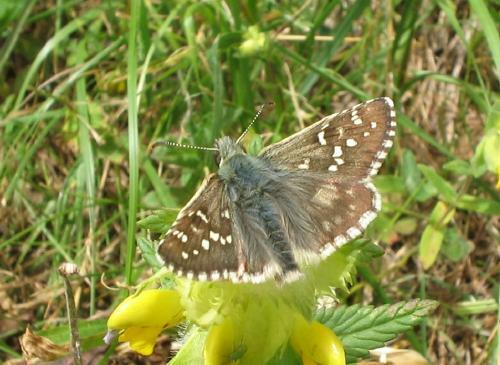 Best of all for me was a single, unmistakeable dusky grizzled skipper, a life first. We weren't particularly looking for this and apparently the group we met had seen others elseswhere during their trip, but it was very exciting. 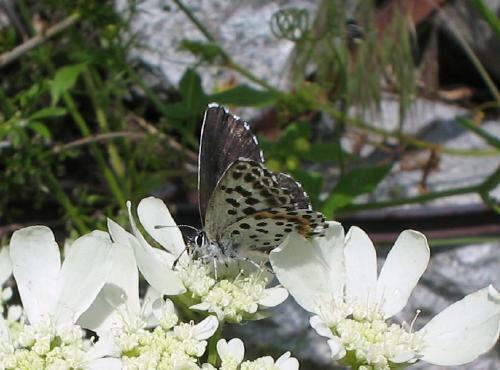 Here it is posing on the appropriate page of Tolman (it is Pyrgus cacaliae) and here is an underside shot. 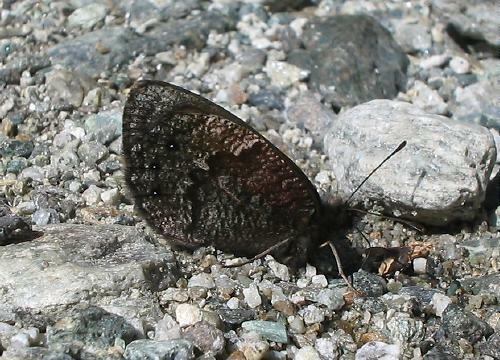 There were also many silky ringlets on the scree, though I was unable to get a good picture. 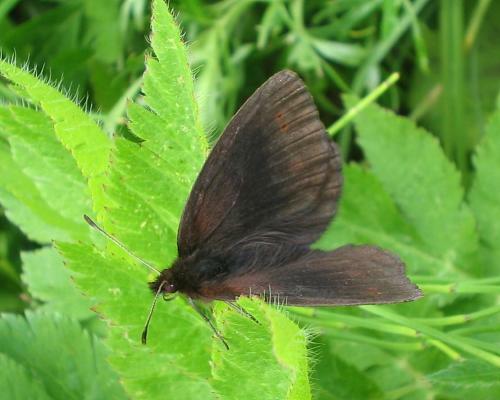 The only one I did take, badly, was somewhat ambiguous and may turn out to be a sooty ringlet, form oreas. 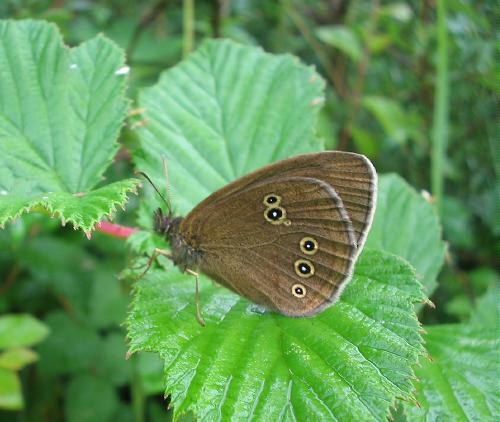 I think not, though - I think it is just a spotless silky ringlet. At about this point a storm set in, accompanied by heavy rain, and we rushed back to cars after a very good day out. 25th: Yet again hot and sunny - allegedly the hottest day in Switzerland so far this year. 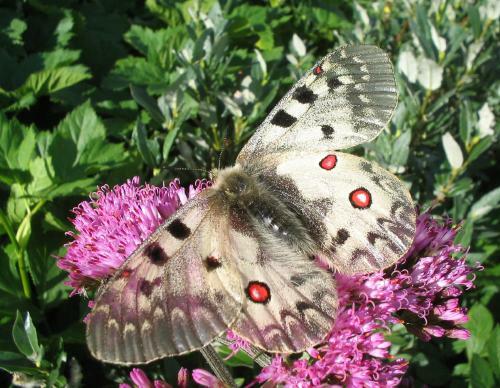 I was back at work but saw some butterflies on my dog walks and in the garden. 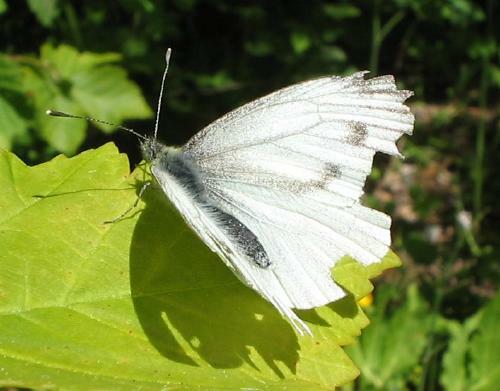 Most surprising was probably a southern small white female in my garden (with other southern small whites and also small whites) - I think this is the first time I have seen them in my garden. I think the heatwave has encouraged this second brood to spread beyond its normal range and climb up the mountain from its valley haunts. 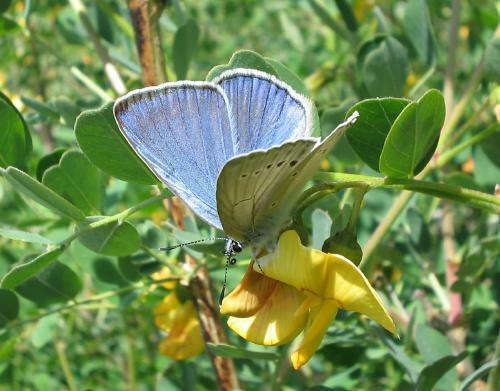 Surprisingly too, a male osiris blue was still flying at one osiris site (the site that began 3 weeks late this year). 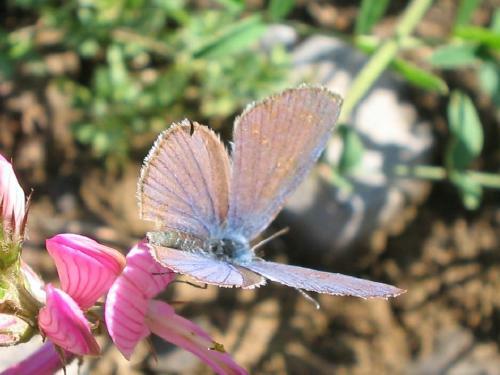 He was worn and very obviously a hanger-on from the single, summer brood rather than a freak second-brooder. 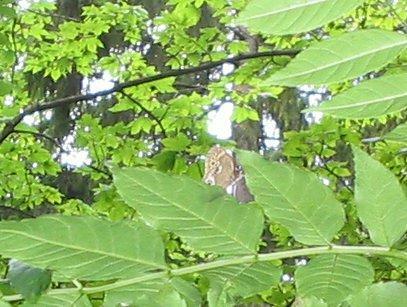 A female purple emperor was flying near a friend's house in Gryon in the afternoon. 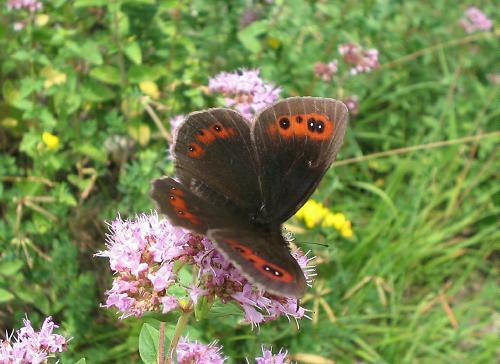 Damon blues are now common, and meadow browns abundant, especially on the oregano in my garden! 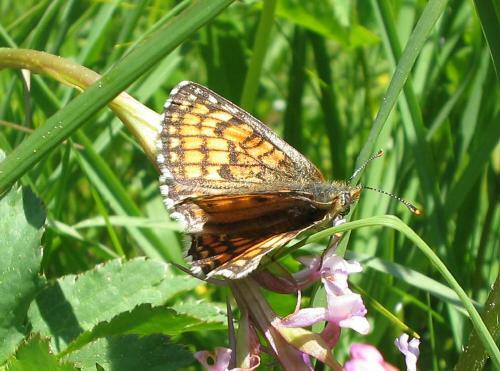 Lesser marbled fritillaries still common, and dark green fritillaries apparently on the increase - they are one of the last fritillaries to remain on the wing in the autumn. 26th: A little more cloud than recent days but still extremely warm. 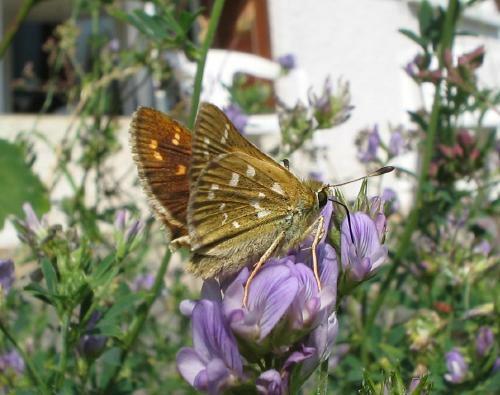 Silver-spotted skippers are now in my garden, coming to the oregano in particular but also other herbs. 27th: Sunny, tending to stormy by late afternoon. 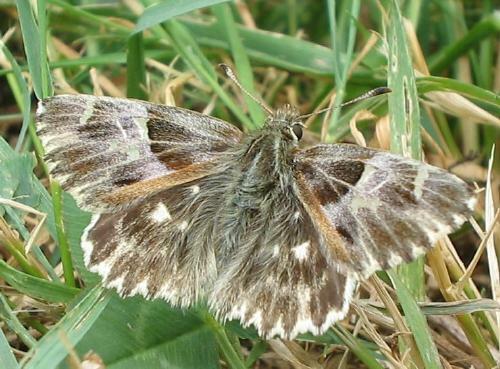 The oregano was alive with meadow browns, small skippers, whites, a silver-spotted skipper, a Scotch argus and occasional blues, while large wall browns came onto the terrace and this late tufted marbled skipper hung on in the grass. When I took Asha for her evening walk, at about 10.15pm, a hedgehog was nosing around on the ski piste - the first I have seen here for several years. 30th: Spent the morning near Martigny. 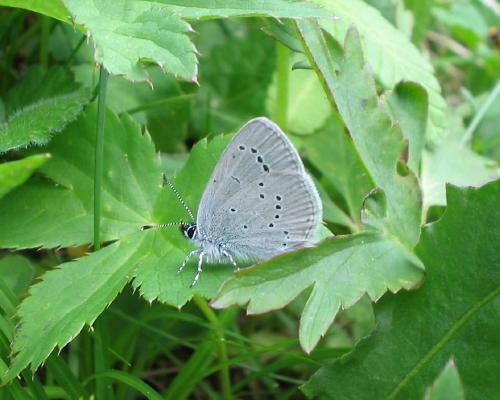 I was looking for blue-spot hairstreaks, which were apparently still on the wing last weekend, but I found none. 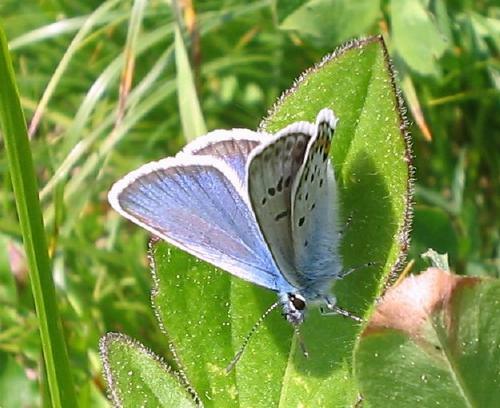 Nevertheless, I did find this female Meleager's blue (and here), as well as plenty of other blues, in good numbers (common, adonis, turquoise, chalk-hill, brown argus). Great sooty satyrs were common but it seemed their numbers might be on the wane; this one had been caught by a praying mantis, but I doubt that was the main cause. 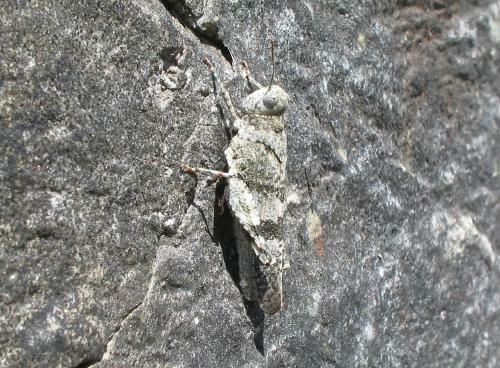 The mantis was not the only thing perfectly camouflaged today - here is a grasshopper with a colour scheme based on lichen-covered rocks. 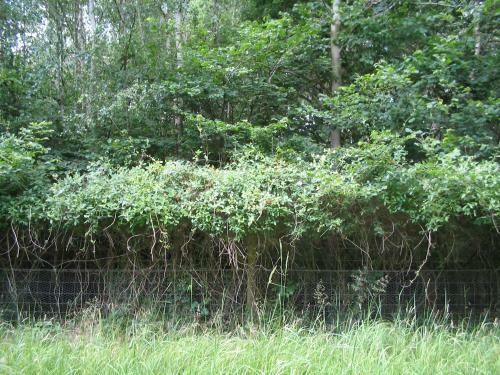 Dryads had emerged in good numbers in some places, as if to replace the great sooty satyrs. 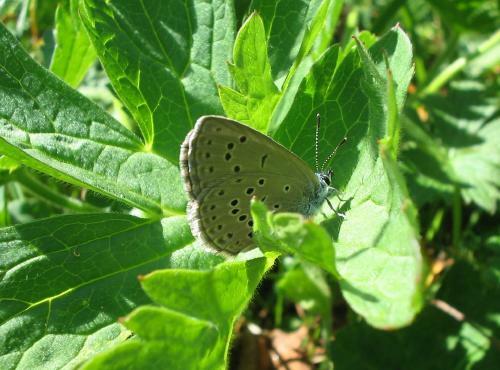 They were very difficult to get close to because they seemed to spend their entire time escaping the merciless heat of the day in the shade of hedges and woodland edges. 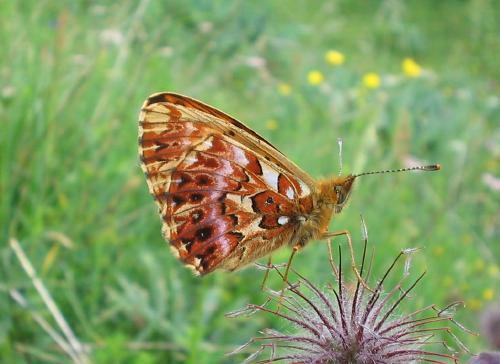 Spotted fritillaries were very common (here is a female), as were Berger's clouded yellows. 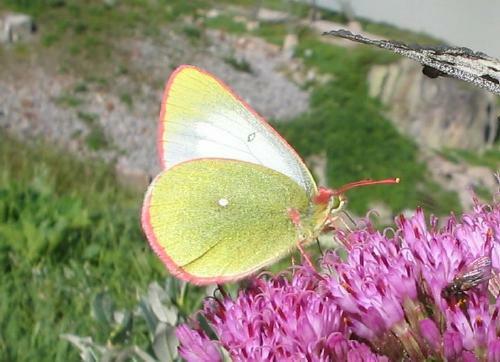 Here is a picture of a couple of Berger's clouded yellows, the female showing her upperside very nicely, and here another (in both pictures, the male is in flight). 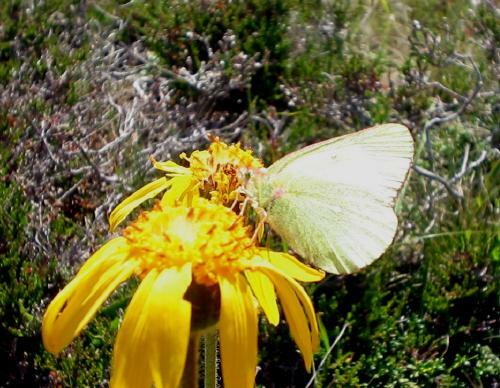 Southern small whites were abundant. 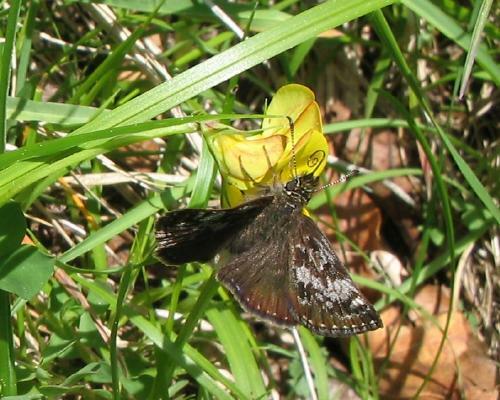 I saw a couple of safflower skippers, which I hadn't expected so late (here is the upperside). 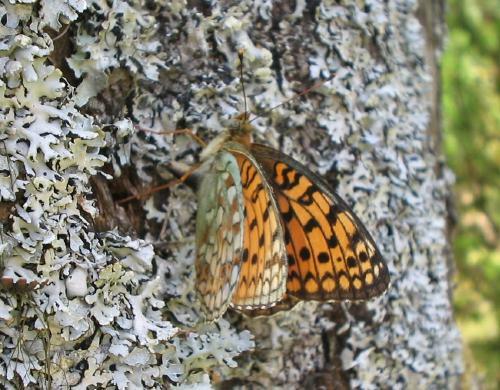 On returning to Gryon I found this female Niobe fritillary laying eggs on the bark of a lichen-covered tree (here is another picture of her). 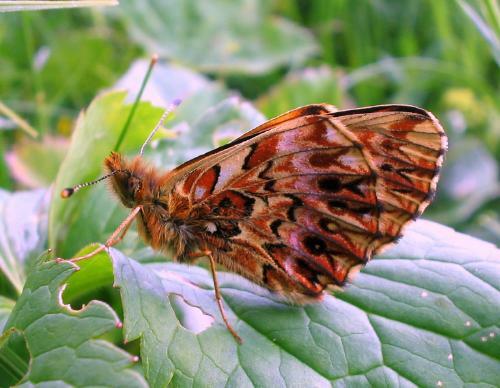 The young caterpillars will feed on violets but there are no violets at this time of year so they must wait until the spring, when they will climb down the tree and munch to their hearts' content! 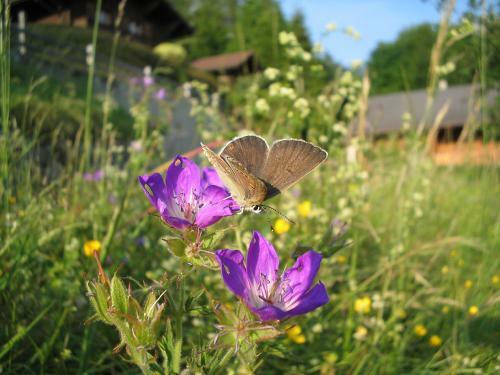 31st: Stayed local, in the Villars region, with Matt Rowlings. 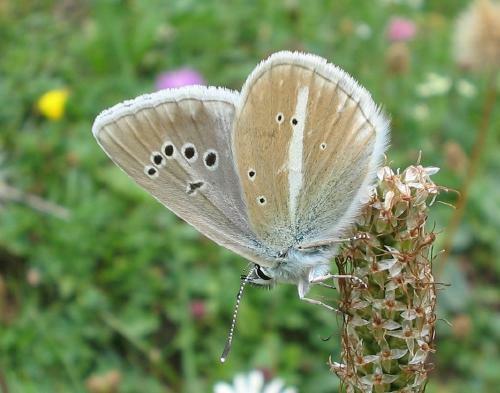 We had hoped for plenty of water ringlets for photographs, but at the site we visited today we found just this one male (for certain - Erebia can be difficult in flight). 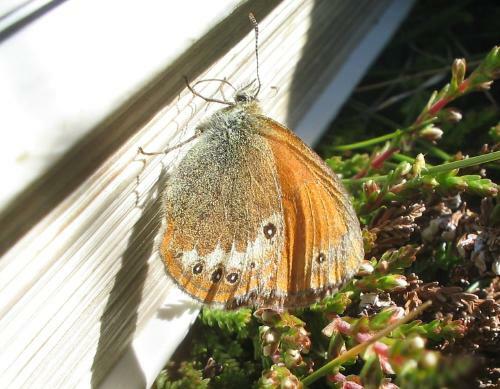 There were plenty of Scotch arguses, lesser mountain ringlets, manto ringlets and Arran browns though! 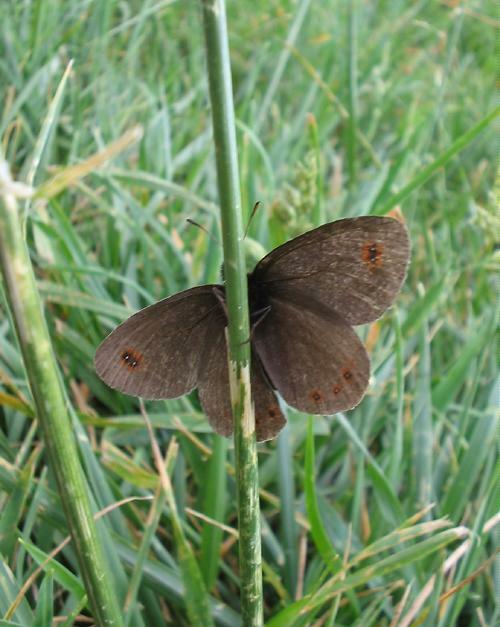 We were lucky to watch a female Scotch argus laying an egg on this isolated head of grass (Agrostis stolonifera I think, though I learnt my grasses in England). 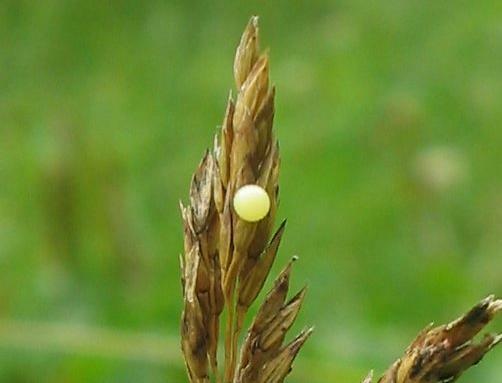 Here is a close-up of the egg. 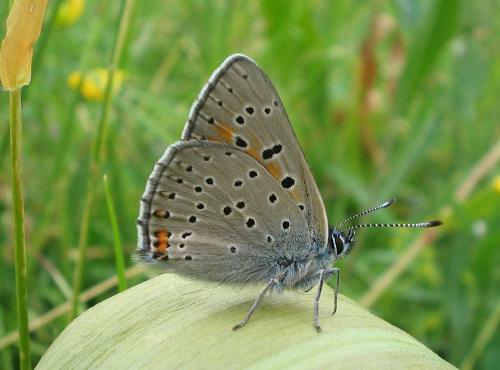 At the same site were also about 10 dusky large blues, living rather precariously (and improbably) by the side of a road. 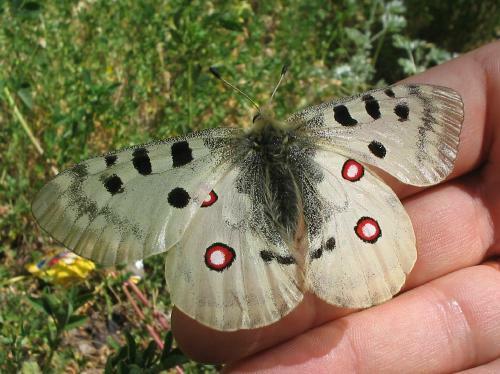 Here is one carrying a hitch-hiker. 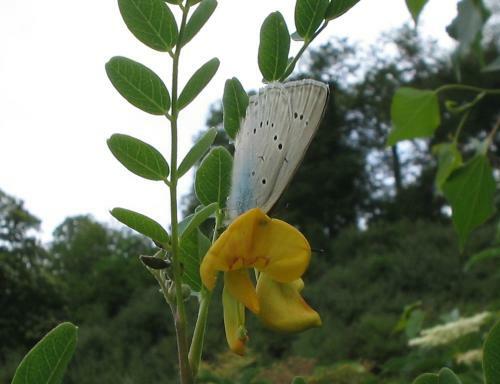 In the afternoon I visited my local mountain alcon blue site, though light rain had set in. 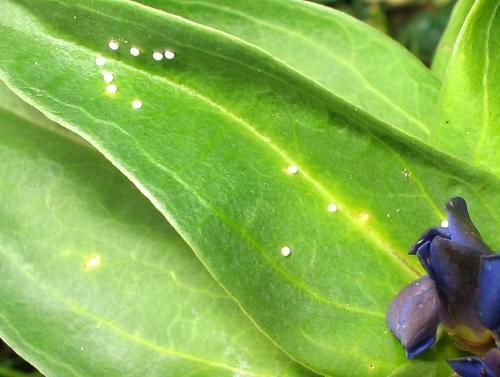 I found that the gentian flowers had blossomed since my last visit and at least some of the eggs had hatched, though many remained on the plants. 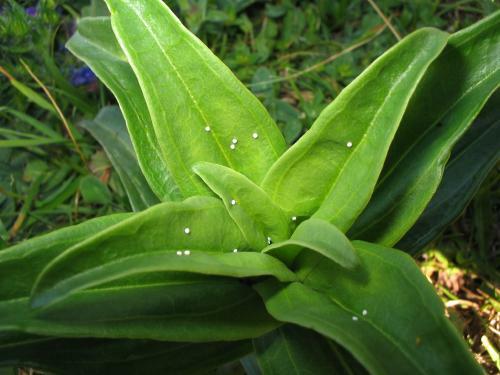 Here and here are some pictures of the eggs (they are the little white dots on the leaves). 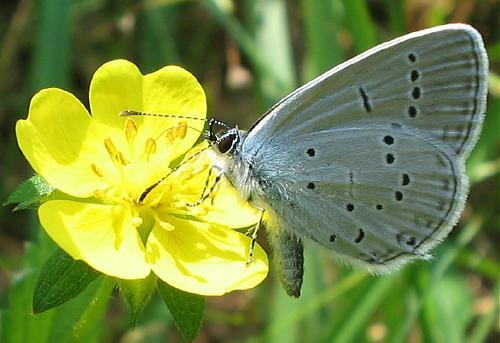 A damon blue was braving the dull weather but little else was flying. 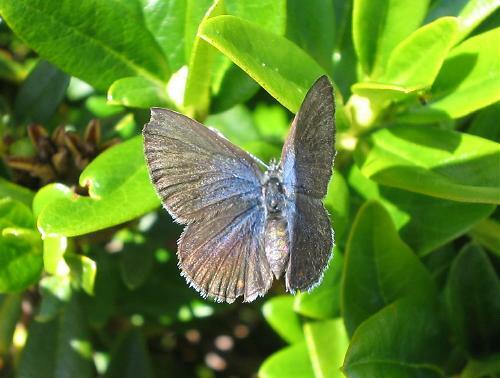 Here is an upperside picture of him. 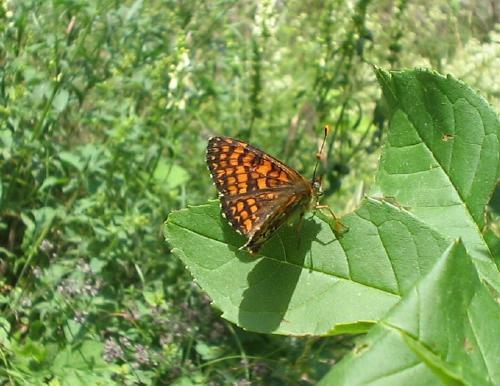 On the way home I photographed this female high-brown fritillary. 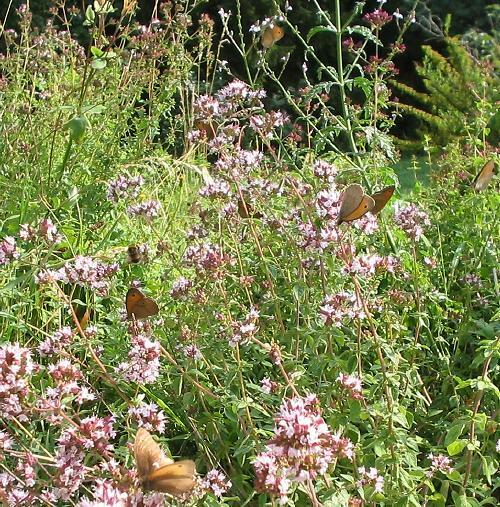 Finally, in the garden, in rather watery sun, were masses of meadow browns, gathering on the herbs. 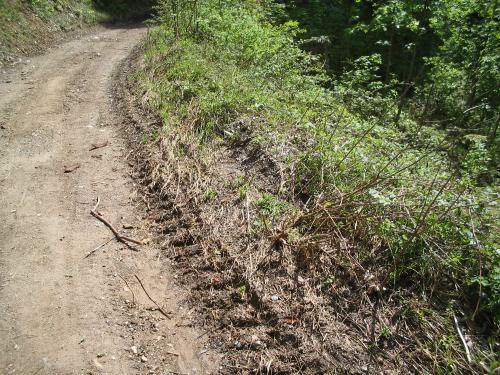 1st-14th: I was working most of this fortnight and the weather was often poor - much rain and frequent storms. 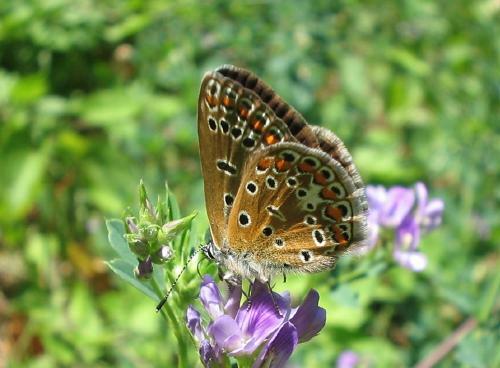 Nevertheless, butterflies flew when they could. 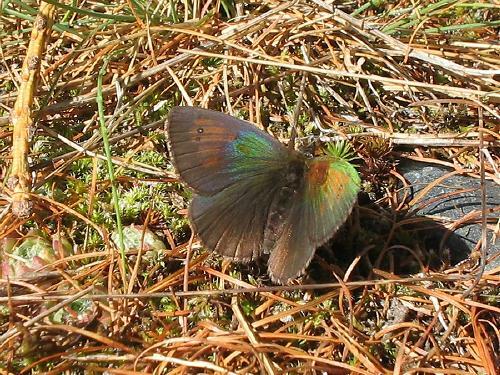 Satyrids were most prominent because of the cloud cover - meadow browns, Scotch arguses and Arran browns were all numerous. 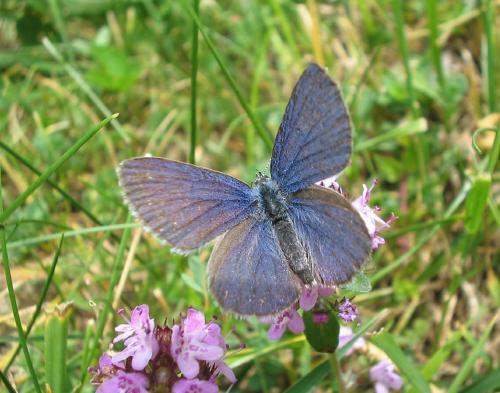 Damon blues were probably the commonest blue in my region but a few mazarine blues were holding on and there were also common blues and Chapman's blues. 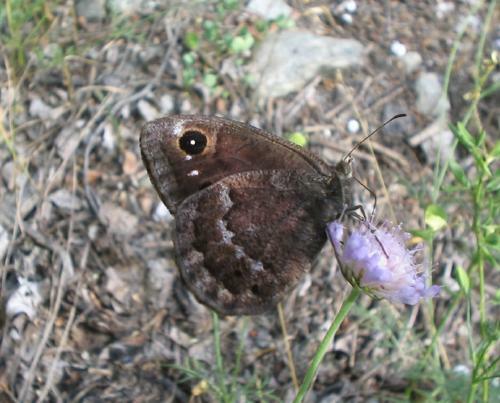 At altitude, manto ringlets became increasingly common and lesser mountain ringlets in places abundant. 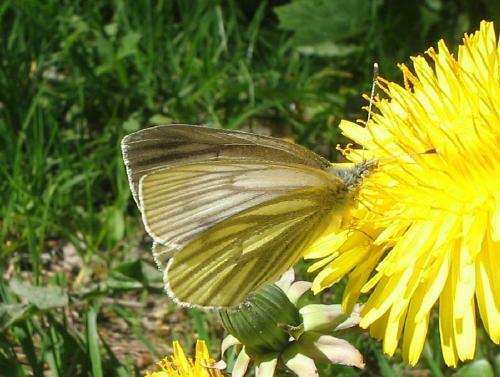 Southern small whites continued to fly occasionally in my garden and silver-spotted skippers became common (fairly, anyway). 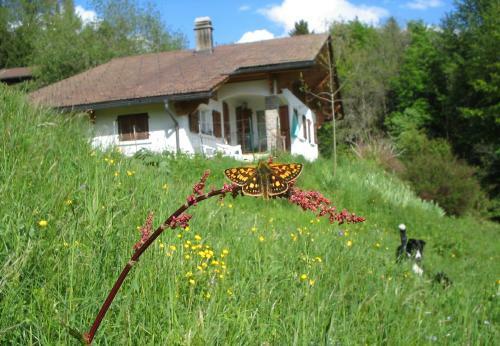 I am out of Switzerland without my own computer as I write - more details and photos are on my computer. 16th: In Suffolk, UK. Bright much of day, with cloud and occasional showers too. 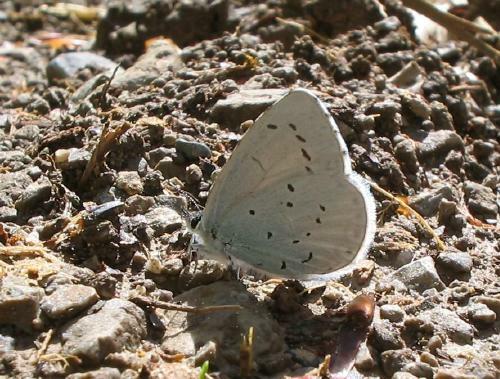 Graylings were abundant at a forest spot. 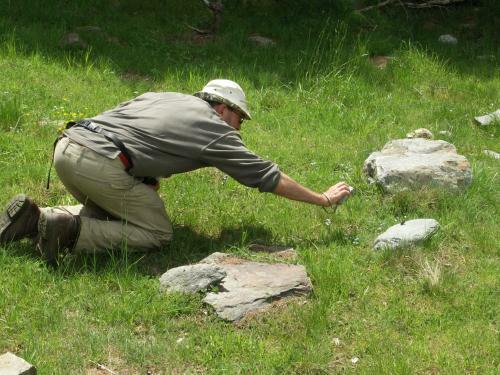 Here is a picture of me photographing one, taken by my mother, and here a well-camouflaged grayling photographed with her camera (I cannot transfer my own pictures here). 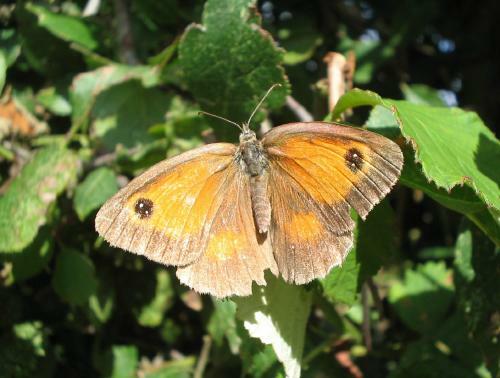 Gatekeepers were also flying, in smaller numbers, as well as meadow browns, small coppers and one or two common blues. 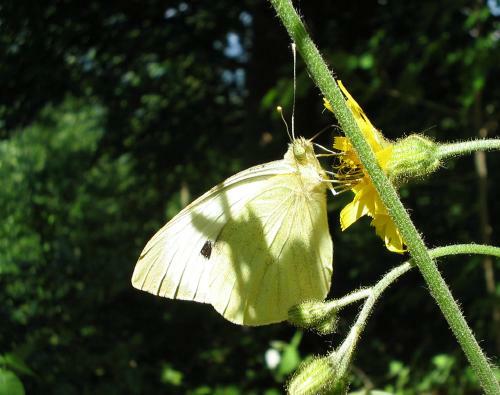 There were small, green-veined and large whites in the garden in the morning. 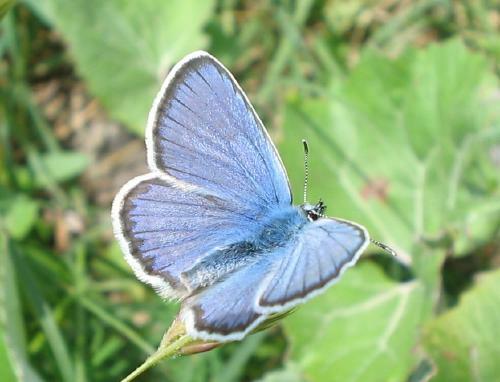 17th: To Minsmere in afternoon. 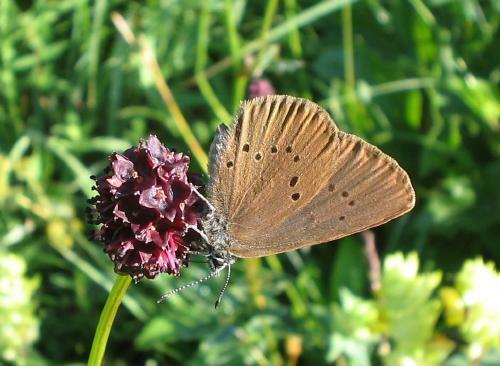 I expected to see purple hairstreaks but there were none. 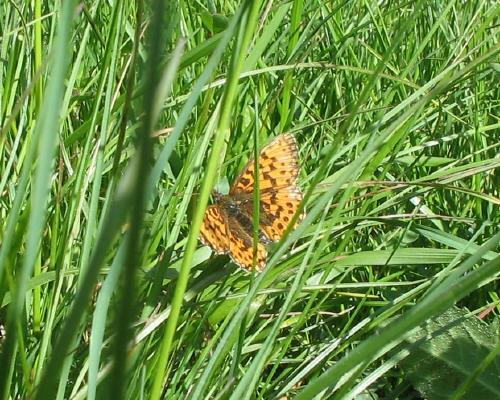 Several commas; gatekeepers and meadowbrowns common; a few speckled woods - but otherwise very few butterflies around. 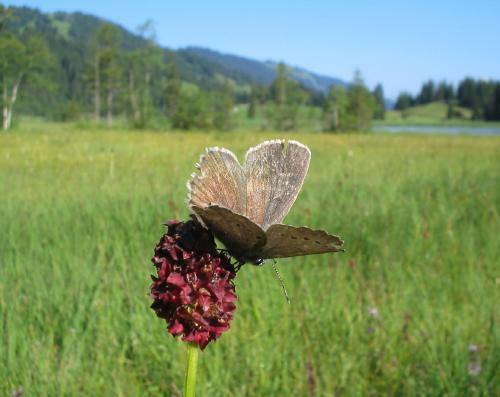 30th August: Back in Switzerland, interesting butterflies are still very much on the wing. 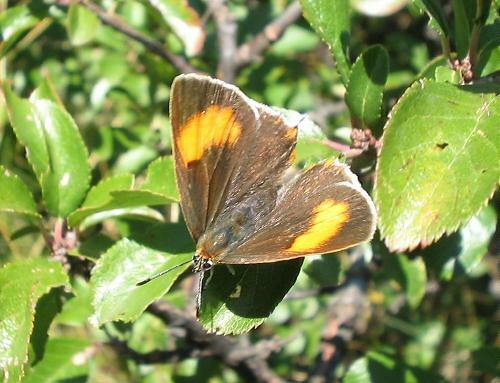 Near Martigny I found a new (for me, that is) colony of brown hairstreaks (here is an upperside shot) and at the same site Chapman's blues, clouded yellows, silver-washed fritillaries and more were flying. 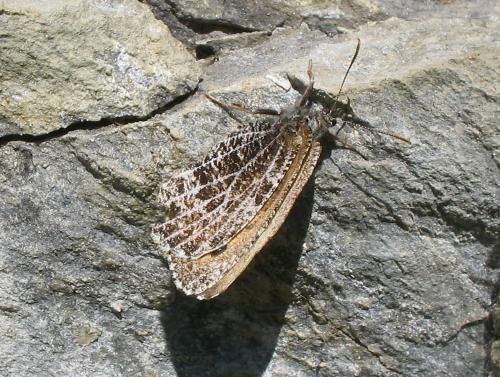 My first tree graylings of the year were basking on rocks and shifting timidly up to sheltered grassland as I approached. Unfortunately, I had relatively little time to spare and so could not search as much as I wanted. I didn't keep up a running record during the last part of the year, but here is a brief summary and a few noteworthy records. 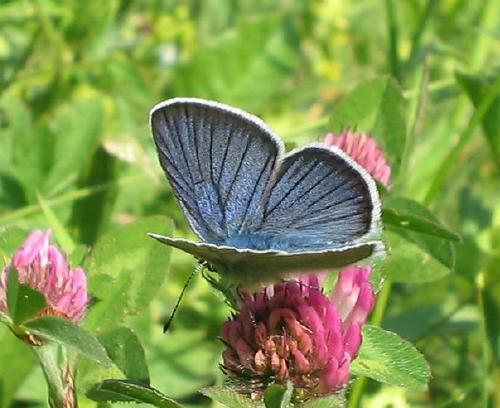 Adonis blues flew well into September near my house, as did Dmon blues. 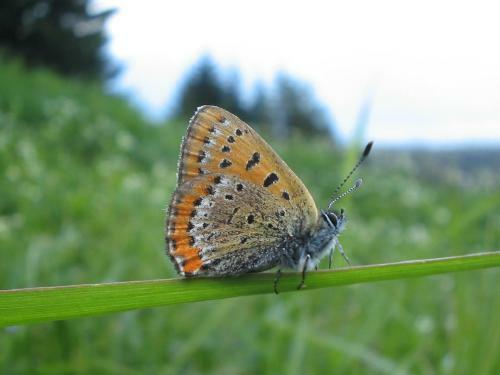 In the valley, as late as 30th September, adonis blues were still flying, tree graylings were common, a single apollo posed briefly for the camera and most bizarrely, a female mountain fritillary was still flying, and at only about 600m! 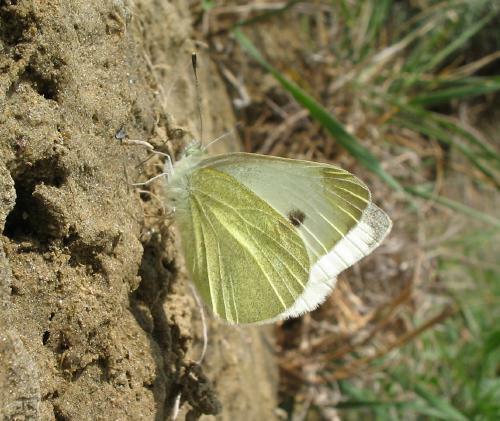 Whites were common throughout the month, with large whites much more in evidence than most years; and yellows too (clouded and Berger's pale clouded). Large walls flew in my garden all through the month. 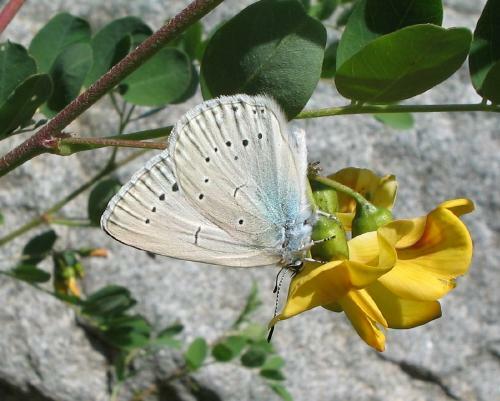 Other satyrids began to decline before the end of the month. 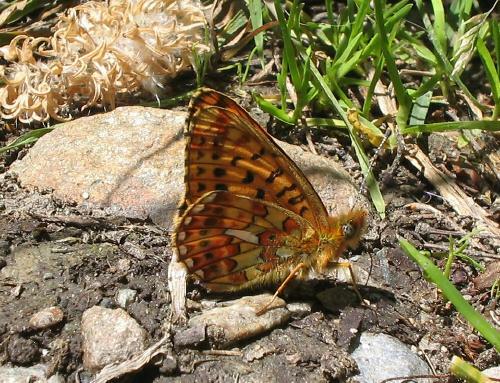 Violet fritillary was the last fritillary to go. 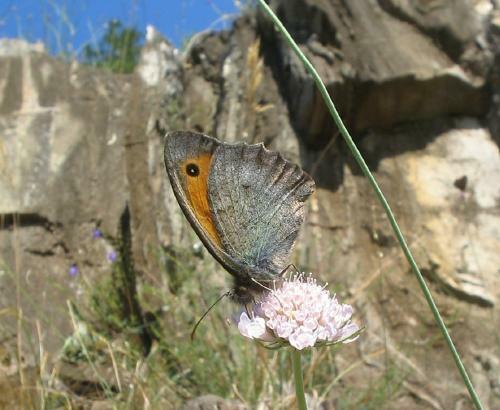 Most species continued to decline through this month, with large walls holding on until about half way through. 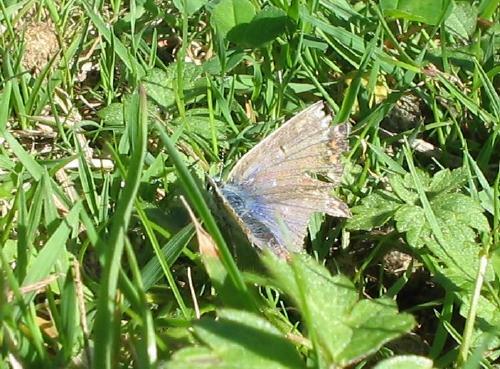 By the end, only painted ladies (numerous), red admirals, small tortoiseshells (really rather few) and Pale clouded/Berger's clouded yellows were still evident. October ended warm, but November began very cold. 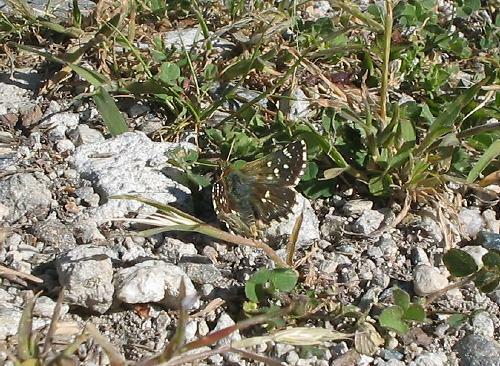 I suspected I had seen my last butterflies of the year when the first week was peristently inhospitable. 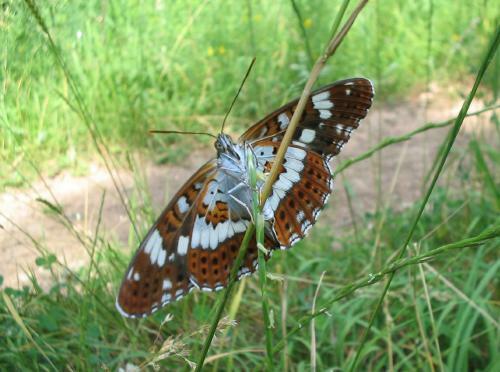 However, it cleared and both painted ladies and red admirals flew on 15th. Snow fell after this but a single red admiral was flying in Gryon on 27th. On a whim, I went to Martigny on 15th December, after my last day of school for the year. 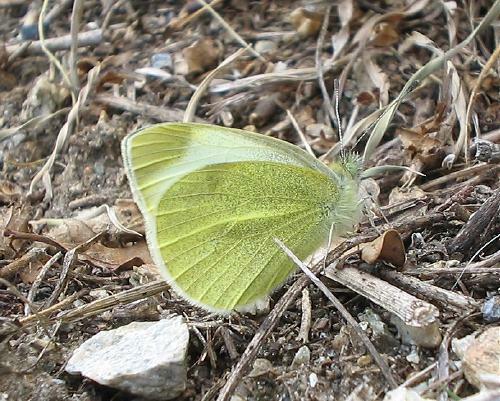 I was pleased, but not terribly surprised, to find two clouded yellows pretending the watery winter sunlight was warm summer beams. 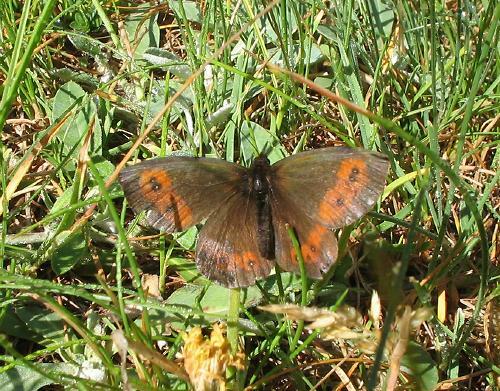 However, I was extremely surprised to find a single male wall brown doing the same. Very, very strange.